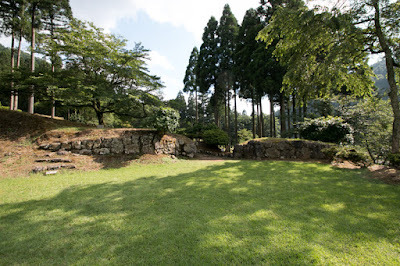 A turning point of Asakura clan occurred in 1565, when Yoshiaki Ashikaga (1537-1597), a younger brother of Yoshiteru Ashikaga (1536-1565), the 13th Shogun of Muromachi shogunate and who was assassinated by Miyoshi clan and Hisahide Matsunaga (1510-1577) in this year, refuged to Ichijyodani with his close retainers. Yoshiaki seek assistance to large warlords for his return to Kyoto and inauguration to next Shogunate, and visited Asakura clan as the strongest and loyal warlord near Kyoto. Yoshikage Asakura (1533-1573), leader of Asakura clan at that time, welcomed Yoshiaki and hosted him very carefully. 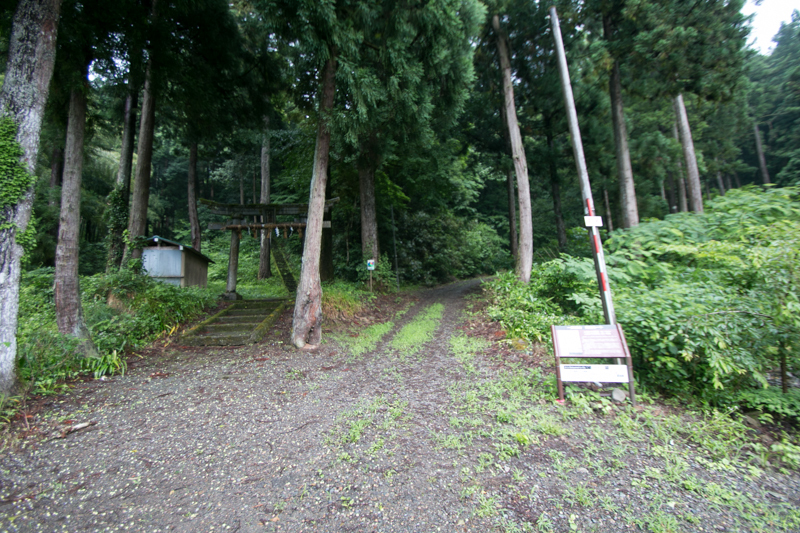 But in spite of recurring request from Yoshiaki, Yoshikage did not make any actual military support for him. 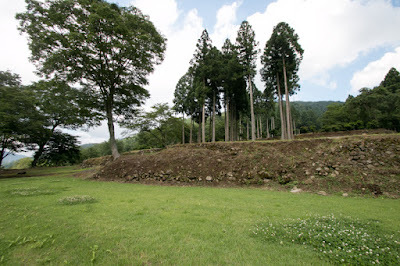 Although Echizen country was stable, Asakura clan had only one country, and Miyoshi clan or Matsunaga clan which seized Kyoto city had larger territory and army. 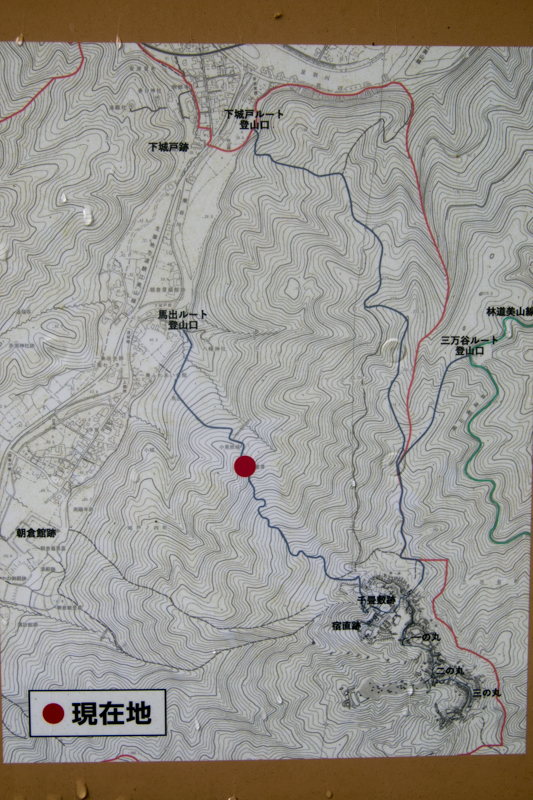 Once start to interrupt central area, without overwhelming victory, military operations will continue for long years without any merit. 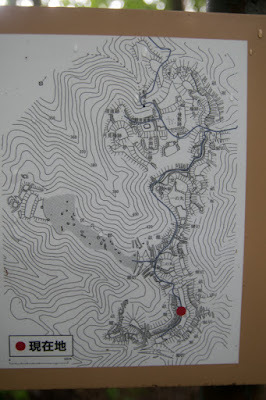 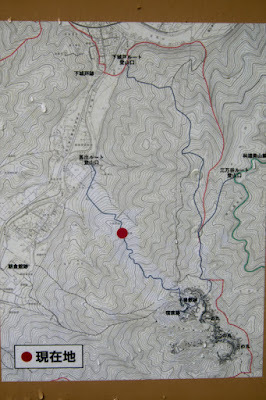 Further, even though Echizen country was close from Kyoto on map, but it was difficutl to keep the battle line at Kyoto from snowy Echizen country. At last, Norikage Asakura (1477-1555), the brilliant military leader of Asakura clan was lost, and there was no other general to perform long campaign in distant area. 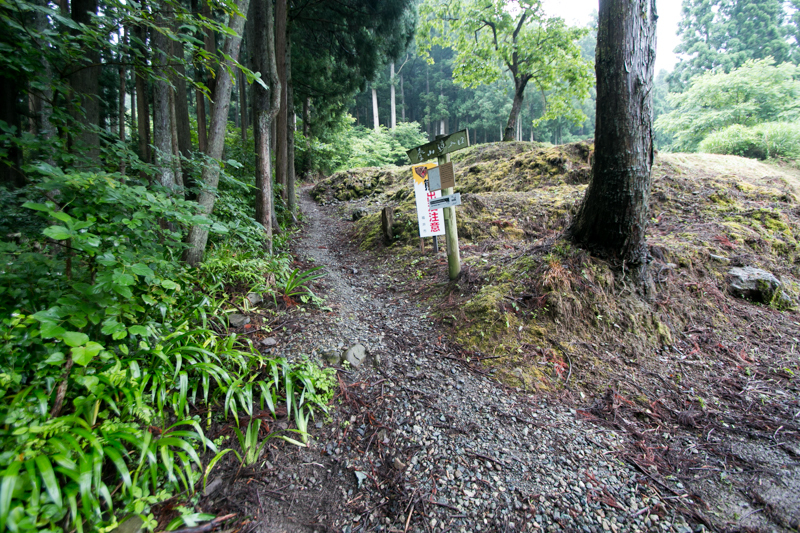 As a result Asakura clan chose keep the status quo. 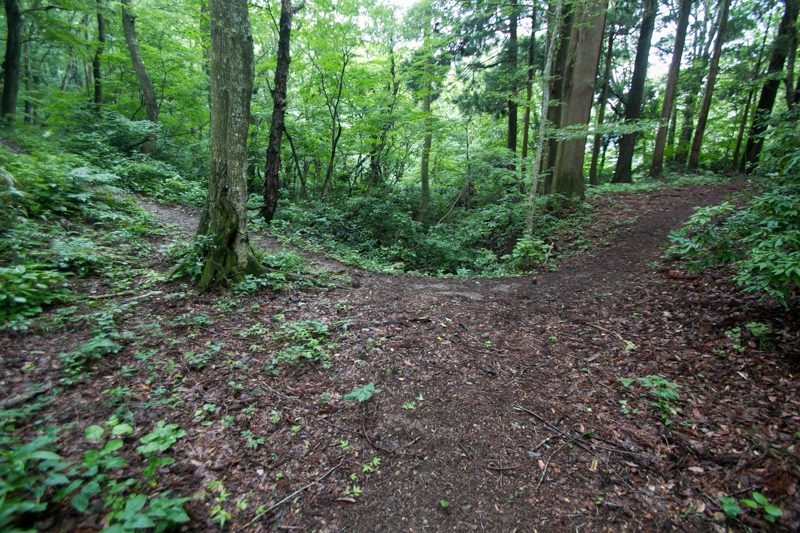 Probably this choice might be the right decision in 50 years ago. 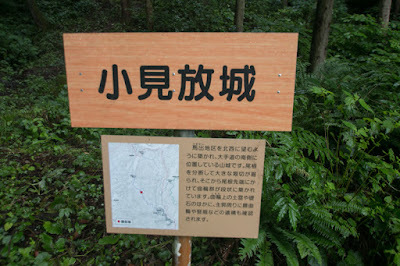 But at that time, new strong clan emerged into the history. 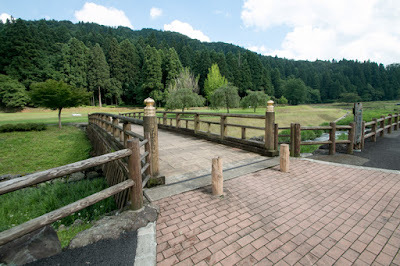 Nobunaga Oda (1534-1582), who defeated powerful warlord Yoshimoto Imagawa (1520-1560) at the battle of Sekigahara in 1560, seized Mino country (Gifu prefecture) in 1567 and prepared to march to central region. 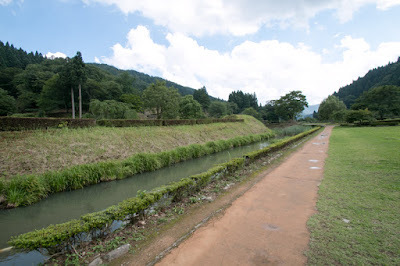 Under coordination of Mitsuhide Akechi (1528-1582), a retainer of Yoshiaki who was born at Mino country, Yoshiaki moved to Oda clan and started his action with Nobunaga. Nobunaga made alliance with Azai clan, a subordinate power of Asakura clan to secure the side front during his expedition in 1567, and next year Nobunaga proceeded to Kyoto with Yoshiaki very easily by three month campaign. 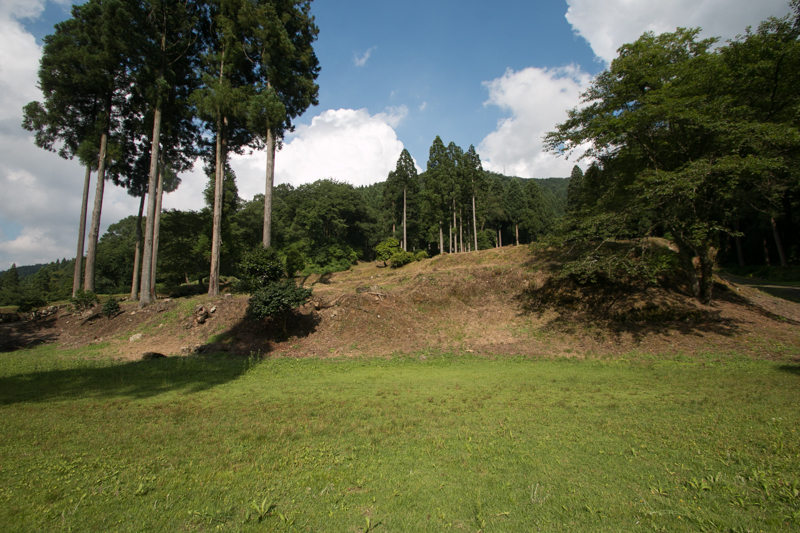 Nobunaga expelled Miyoshi and Matsunaga army from Kyoto, and established his hegemony with Yoshiaki. 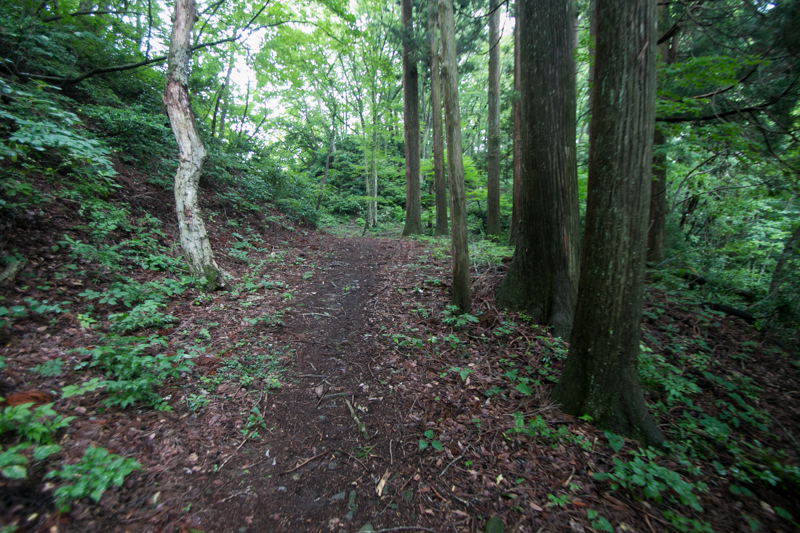 At first Yoshiaki and Nobumaga kept good relationship, but gradually the gap between Yoshiaki and Nobunaga who seek his power spread. 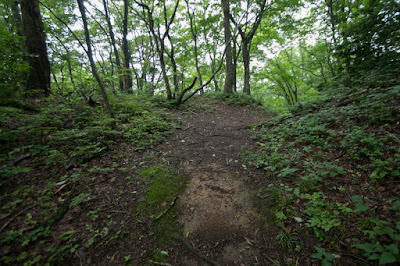 Yoshiaki started to ask assistance to other warlords including Asakura clan to defeat Nobunaga, and this time Yoshikage agreed. 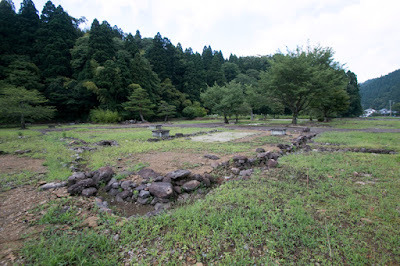 Nobunaga requested Yoshikage to come to Kyoto and subordinate to him, but Yoshikage did not respond to this. 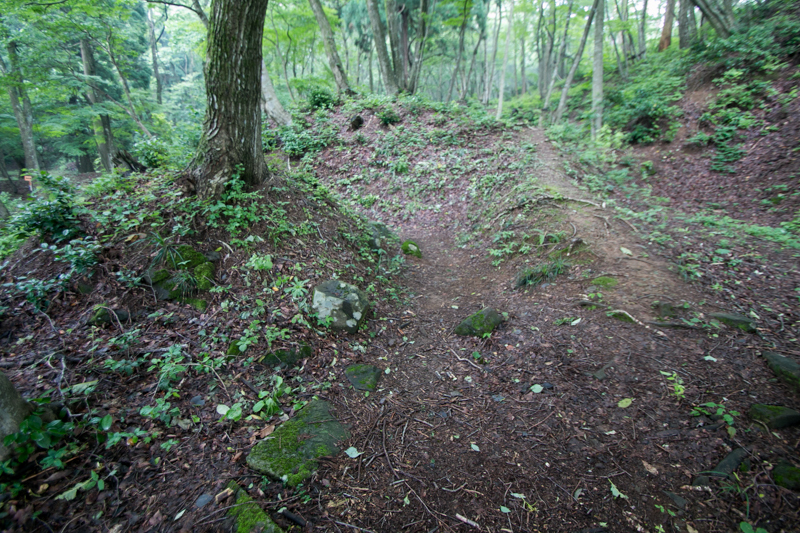 In 1569, Nobunaga finally attacked Asakura clan with large army. 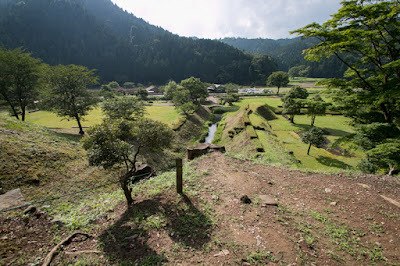 Tsuruga area was lost without resistance and Asakura clan was on the verge of extinction, but this time Azai clan broke alliance with Nobunaga and chose to support Asakura clan. Fearing attack from both side Nobunaga quickly retreated to Kyoto region, and Asakura army chased Oda army but could not cause critical damage to them. 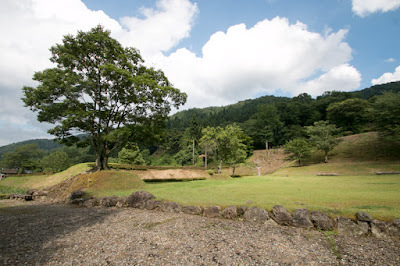 Returned Nobunaga started his revenge to Asakura and Azai clan with his full strength. 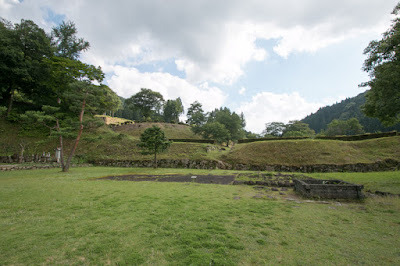 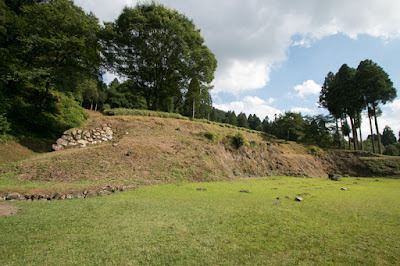 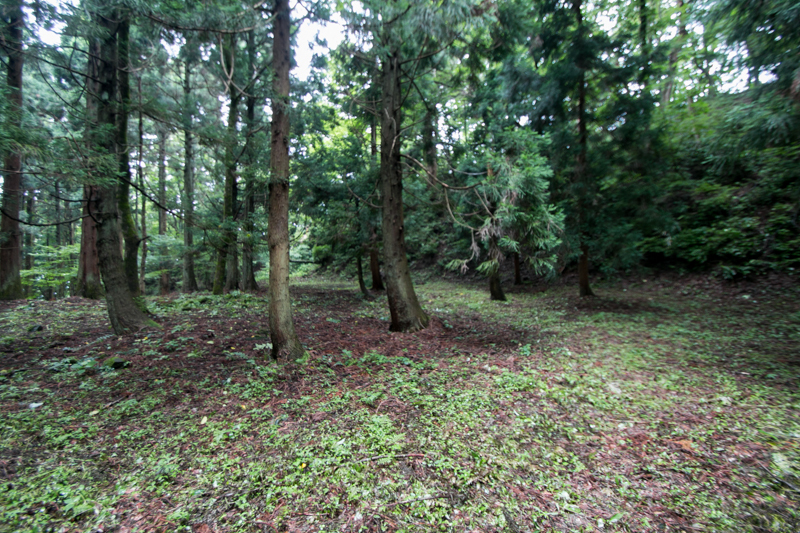 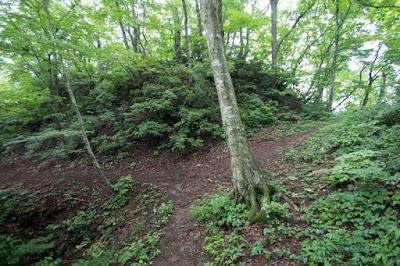 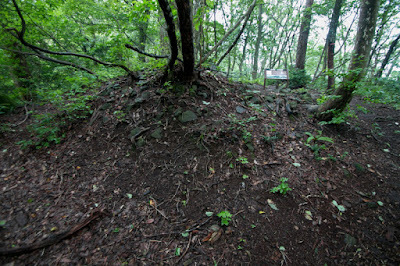 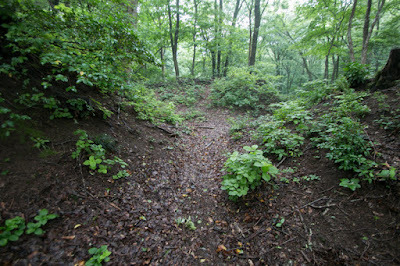 Next year Nobunaga attacked Odani castle (Shiga prefecture), the main base of Azai clan, and the battle between Oda army and Azai Asakura allied army occurred at Anegawa, near the Odani castle. Azai Asakura side was defeated at this battle and Azai clan lost south half of their territory. 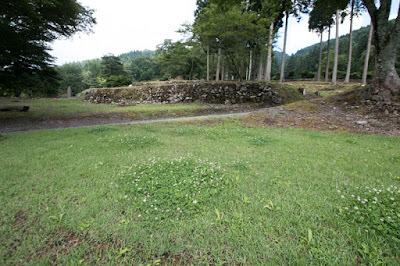 But in the same year, Honganji temple, the head temple of Ikkoshu (a denomination of Japanese Buddhism) entered anti Nobunaga alliance, and when main army of Nobunaga confronted Ikkoshu army at Osaka, Asai Asakura army attacked north shore of Lake Biwako and approached Kyoto and entrenched them at Enryakuji temple at Hieizan mountain. 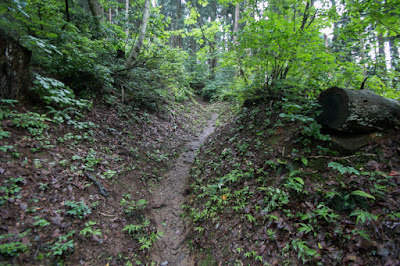 Now the situation became quite tough for Nobunaga, then Nobunaga once made peace with Azai and Asakura clan under inferior condition. Asakura clan also exhausted with long campaign and agreed it. Asakura clan once made victory to Nobunaga, but they could not put an end to Nobunaga this time and later this became a fatal mistake for them. But indomitable and furious Nobunaga started to revenge to Azai and Asakura clan. 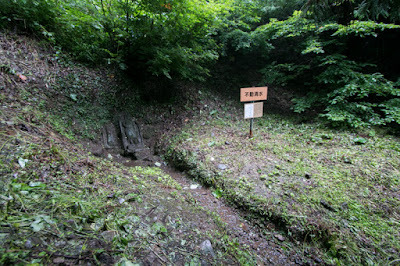 In 1571, Nobunaga burned down Enryakuji temple which sheltered Azai and Asakura army, and further suppressed Azai clan. 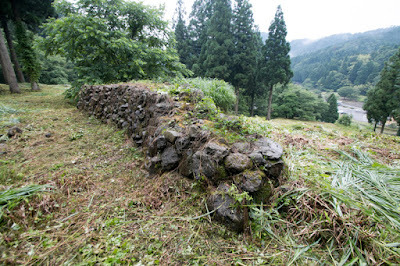 In response to this, Yoshikage sent reinforcement to Azai clan every year, and barely stand the front for next two years. But long and continuous operations became the burden of retainers and people of Asakura clan. 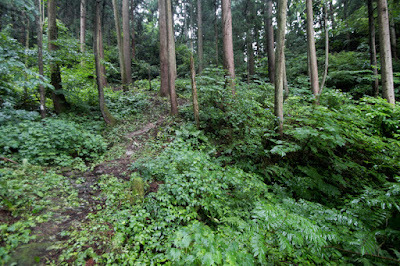 Yoshikage gradually lost his confidence, and some retainers began to change to Nobunaga. 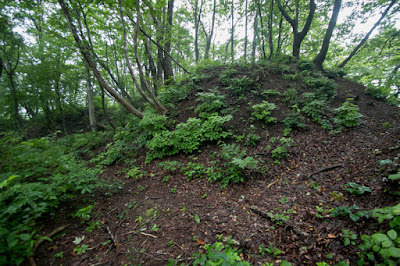 Mountain castle behind the residence might be expanded around this time. 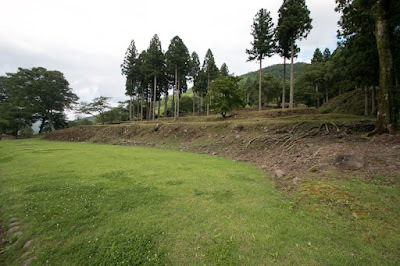 In 1572, Shingen Takeda (1521-1573), a warlord of Kai country (Yamanashi prefecture), started to invasion to Oda clan and Asakura clan also dispatched troops to support Takeda clan, but Asakura army easily retunred to their country in winter season and this news discouraged Shingen very much. 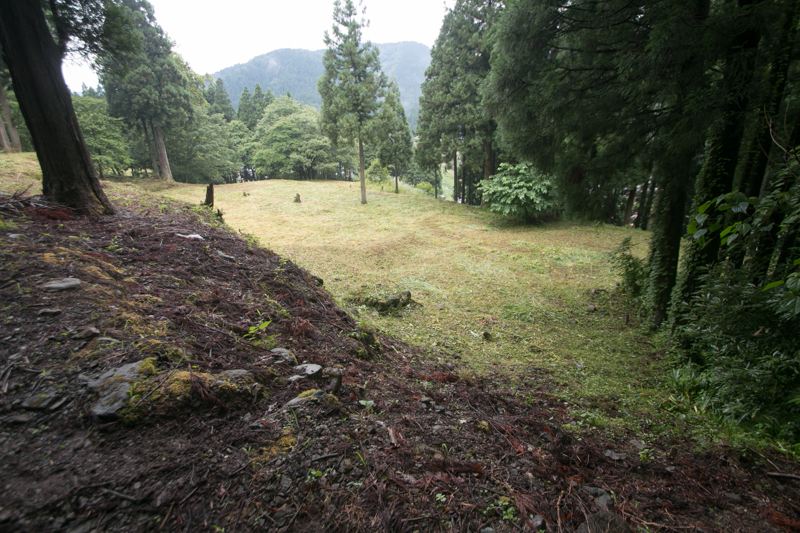 Next year Shingen died at the midway of expedition and no one could oppose to Nobunaga any more. 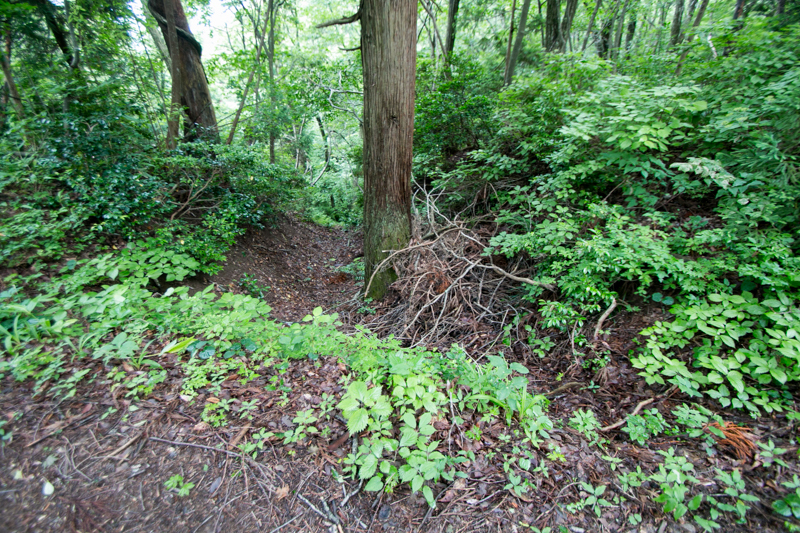 At the beginning of August 1573, Atsuji clan who guarded Yamamotoyama castle, whic was in front of Odani castle, changed to Oda side, and defense line of Odani castle collapsed. 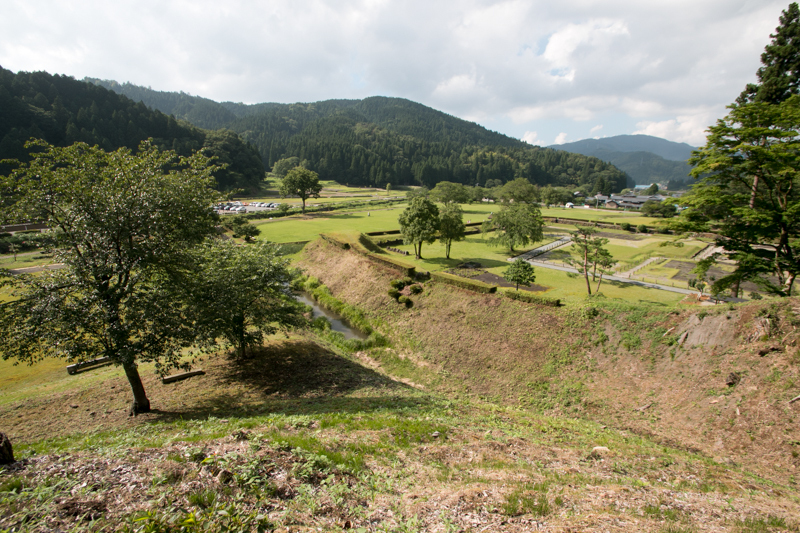 Utilizing this opportunity, Nobunaga brought the whole 30,000 army to Odani castle. 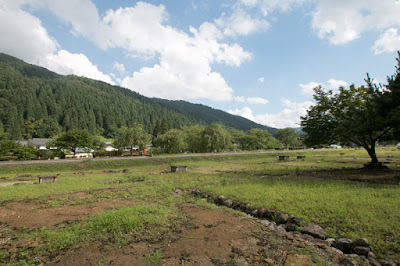 In response to this situation, Yoshikage also lead 20,000 troops to support Azai clan, but Nobunaga quickly occupied the height between Odani castle and Asakura army then shut the communication between both party. 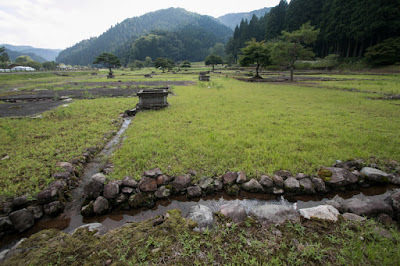 Seeing this inferior situation Yoshikage decided to retreat, but Nobunaga who expected this movement of Yoshikage made a full scale attack to retreating Asakura army. 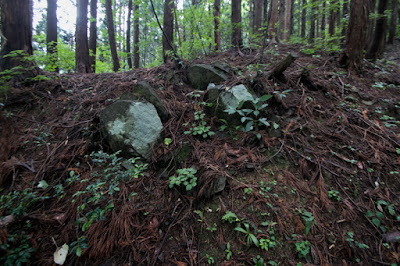 In only one day battle main force of Asakura clan collapsed, and many generals died in the battle. Yoshikage once returned to Ichijyodani palace with small guards. 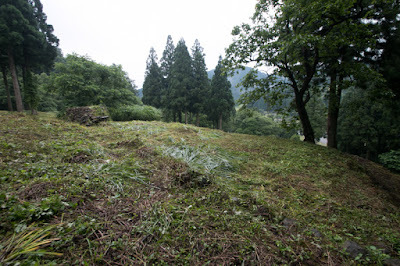 But even if they besieged at mountain castle area there was no soldier to fight with Nobunaga, then Yoshikage refuged to Ono area, which was held by his cousin Kageakira Asakura (?-1574) who kept his troops. 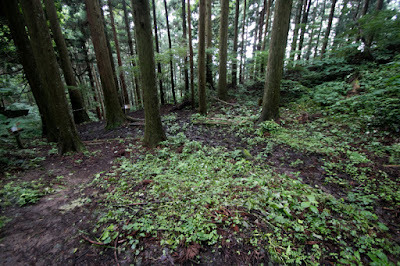 But Kageakira already betrayed to Nobunaga side, and forced Yoshikage to suicide by the end of this month. 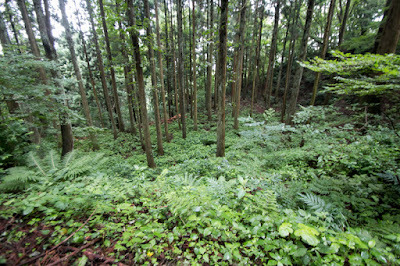 Now Asakura clan brought dow the curtain as warlord of Echizen country about 100 years, only in one month. 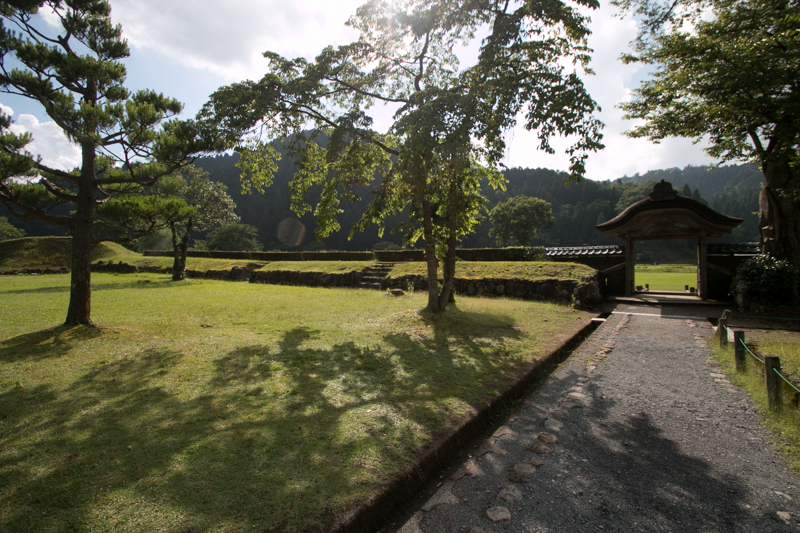 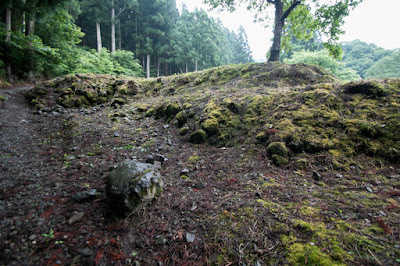 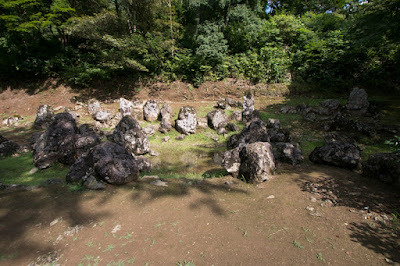 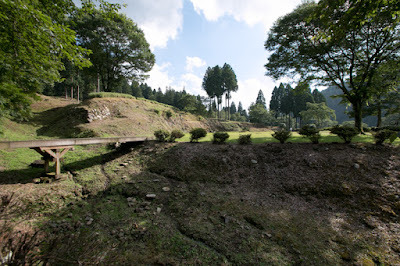 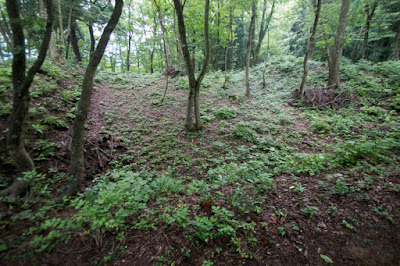 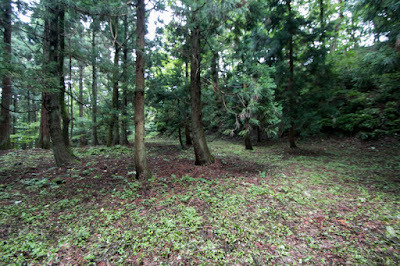 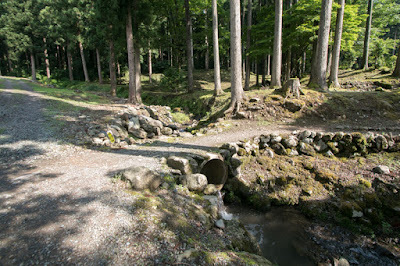 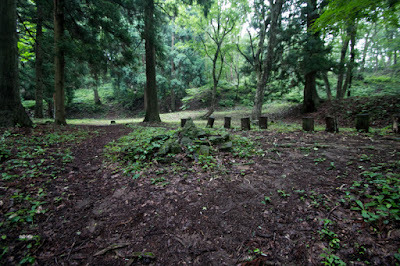 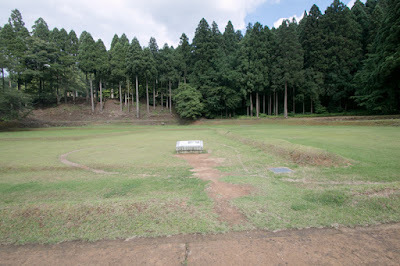 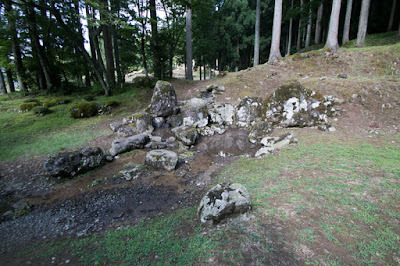 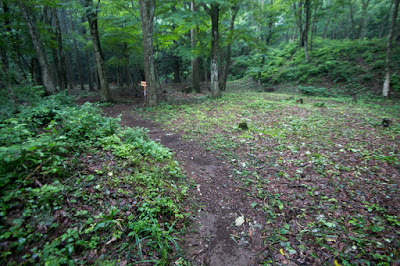 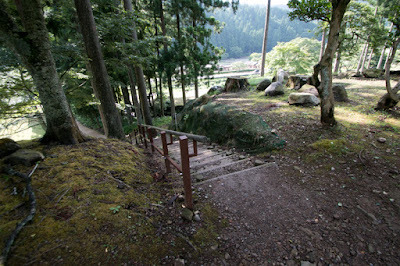 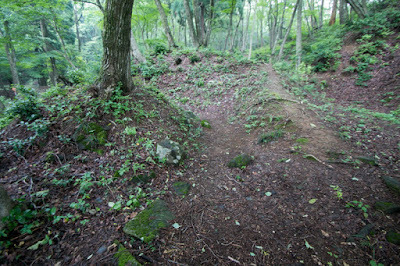 Ichijyodani palace and castle town was plundered and destroyed at the time of occupation by Oda army. 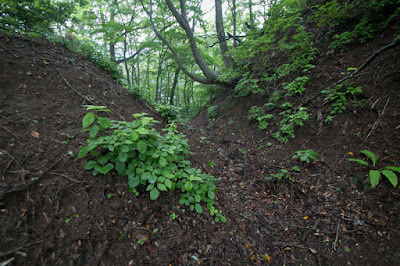 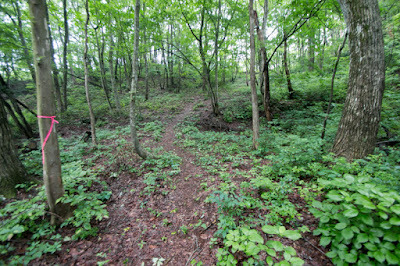 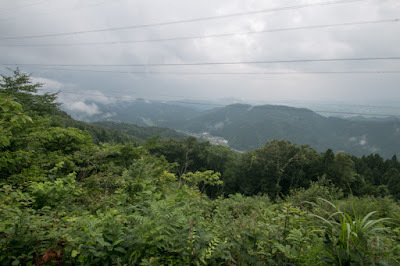 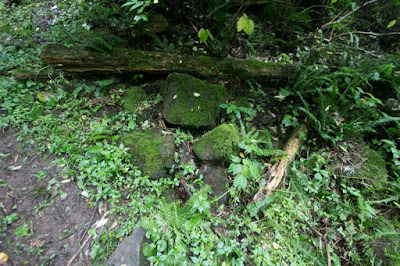 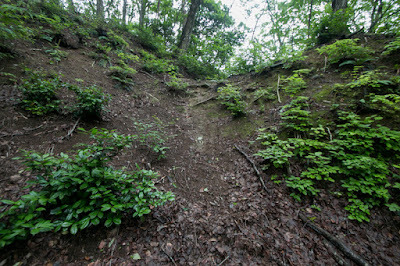 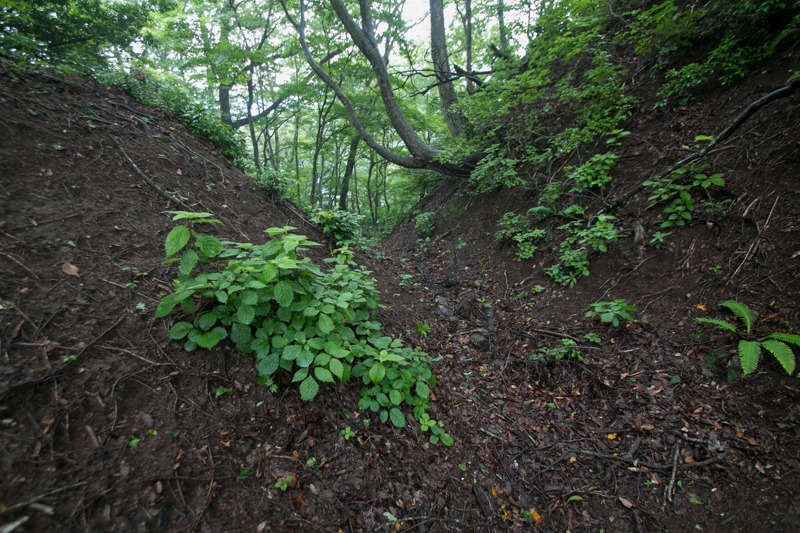 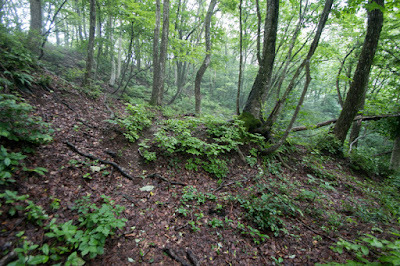 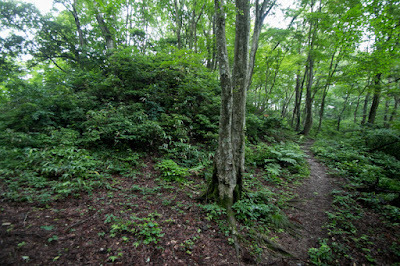 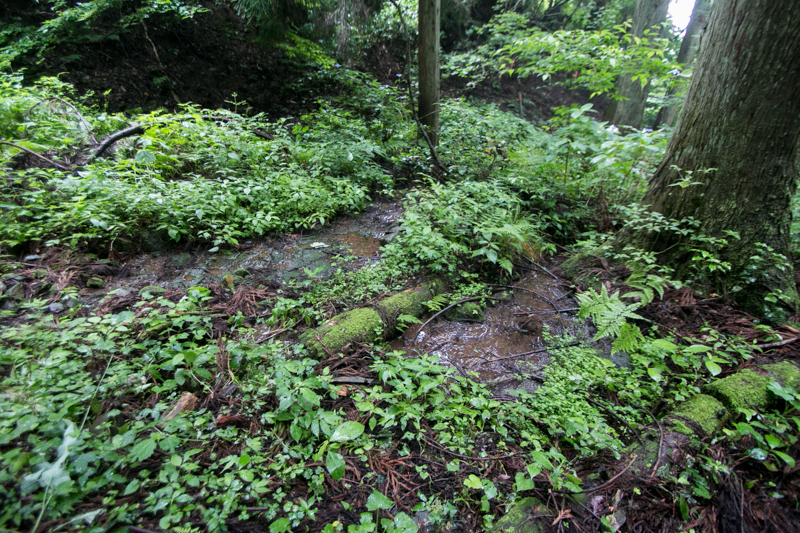 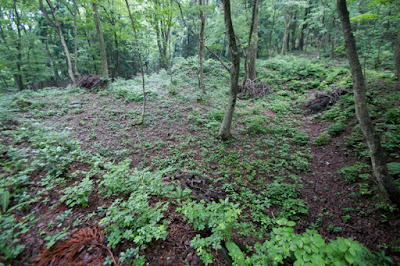 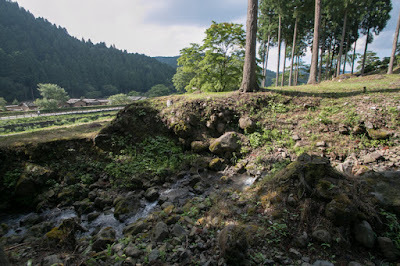 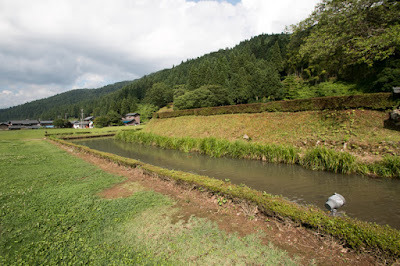 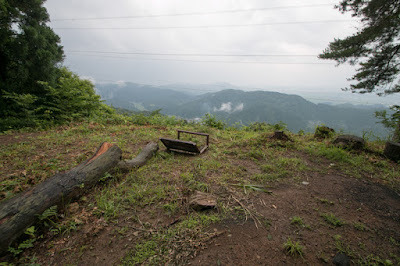 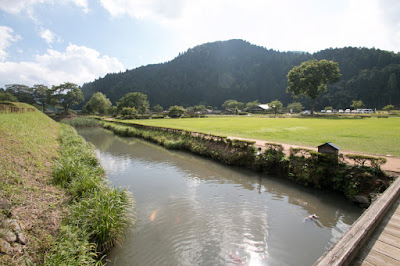 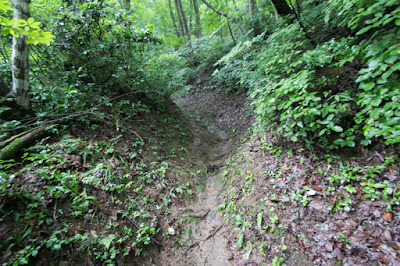 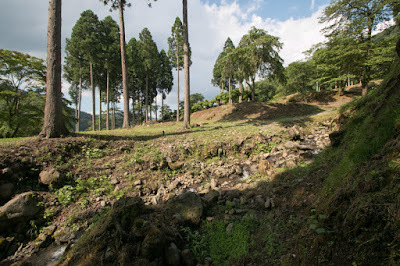 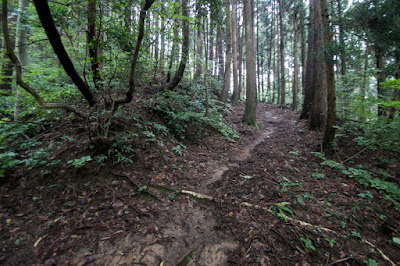 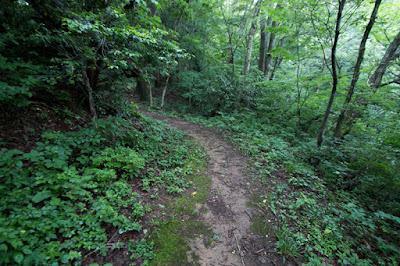 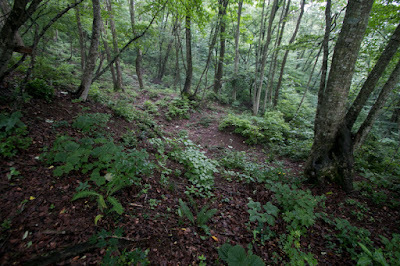 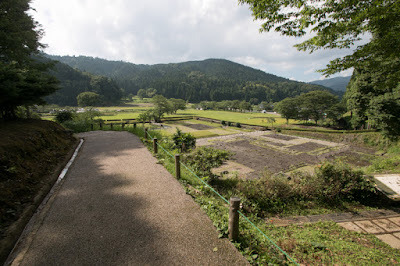 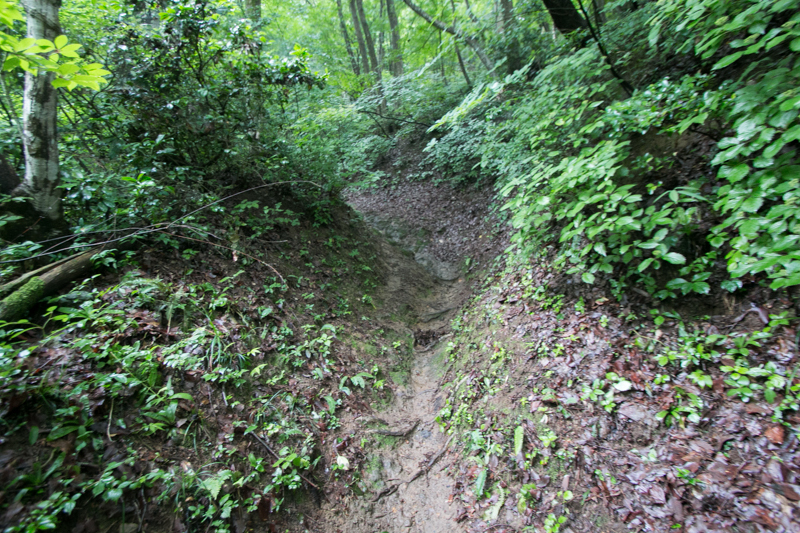 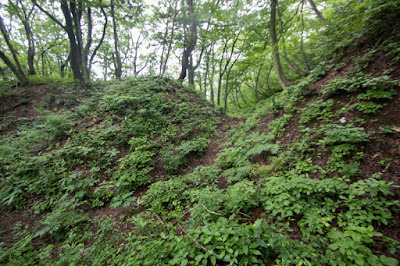 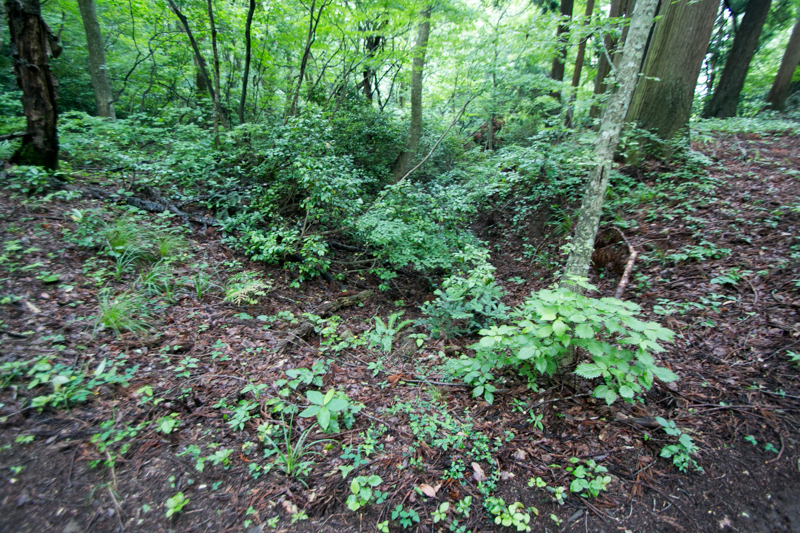 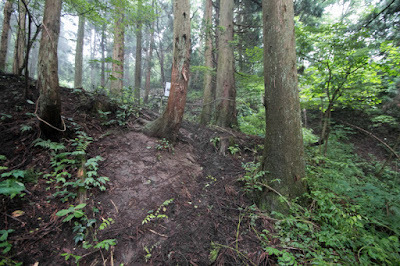 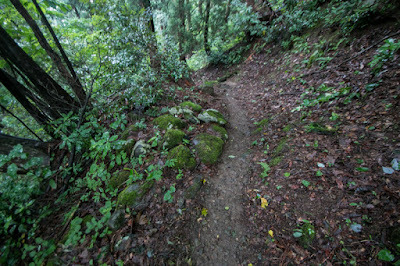 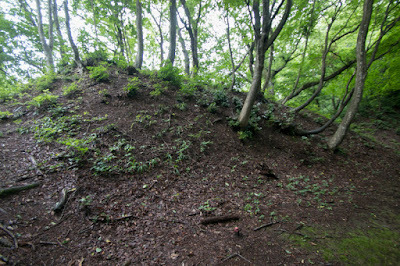 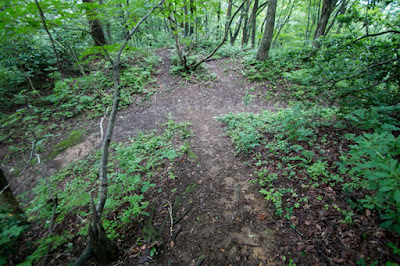 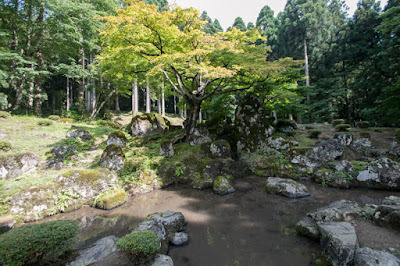 In addition to this, due to the uprising of Ikkoikki (rebellion of Ikkoshu denomination) and suppression by Oda army, Ichijyodani valley was involved in further disturbance and totally destroyed. 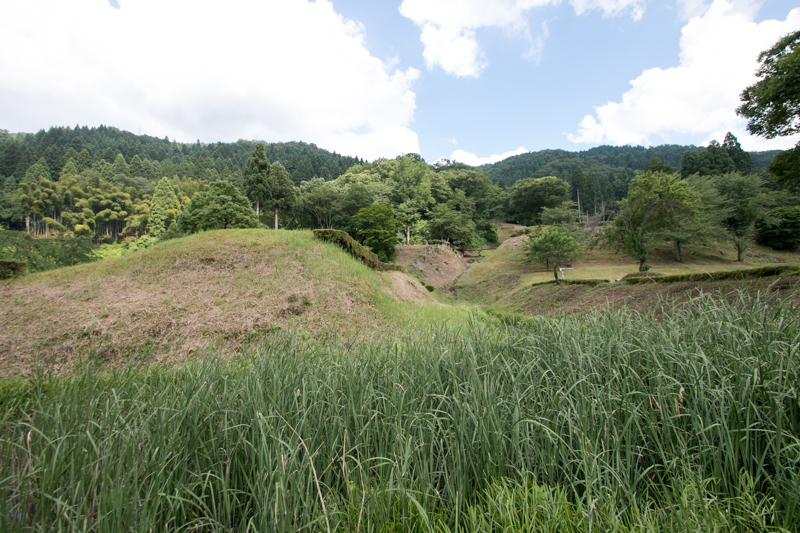 Next governor Katsuie Shibata (1522-1583) chose his base at current Fukui city and built Kitanosho castle, thus Ichijyodani valley and town was not used any more. 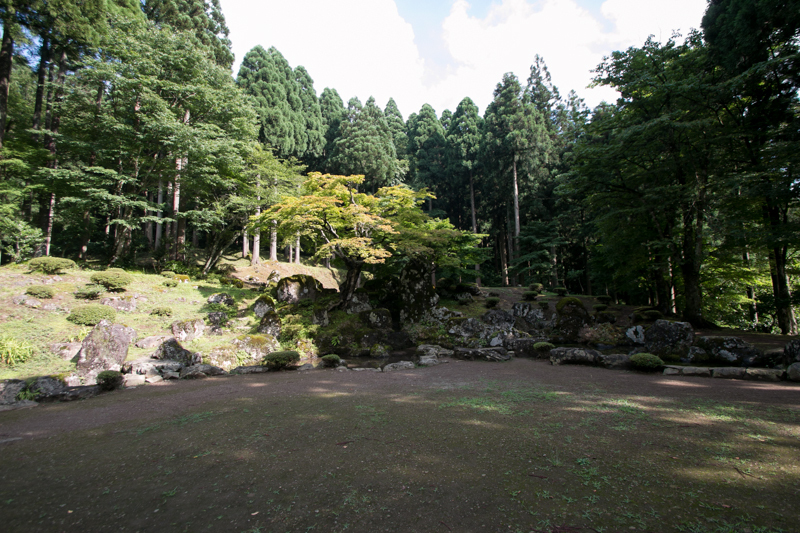 But owing to sudden fall and abandonment, Ichijyodani well kept the original shape under Asakura clan and became a valuable place. 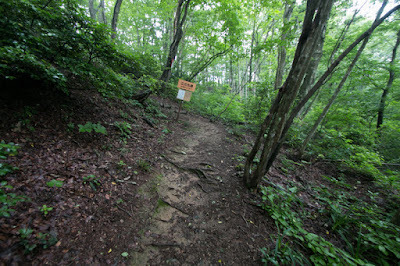 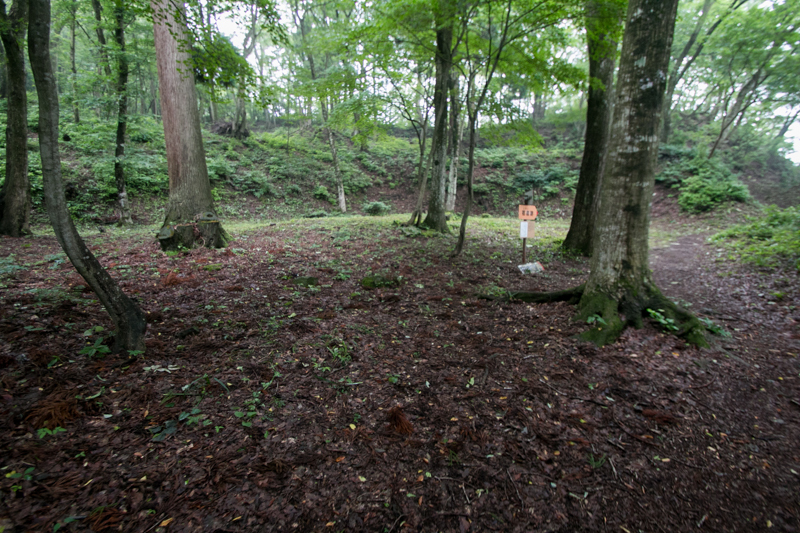 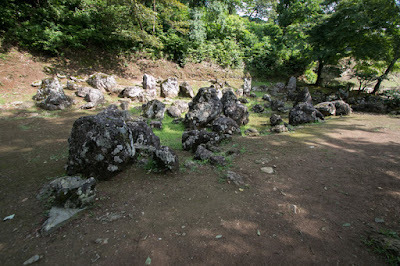 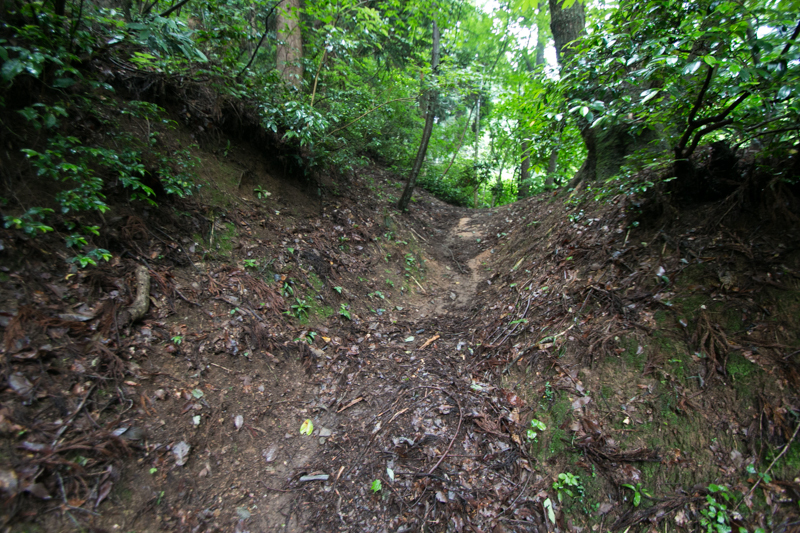 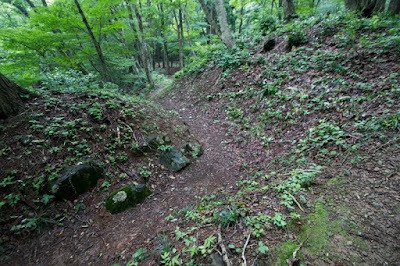 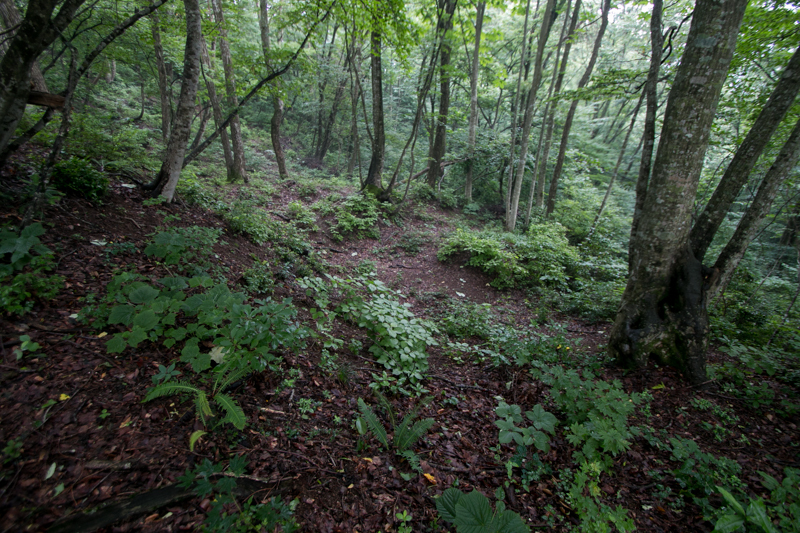 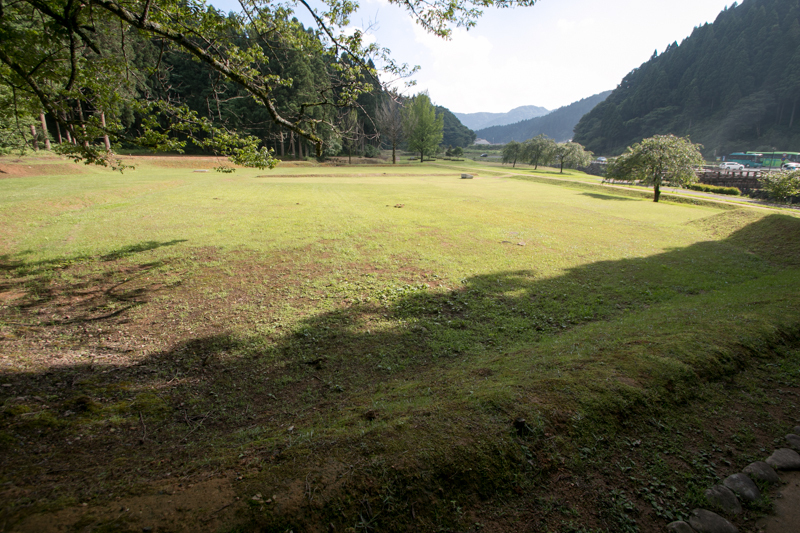 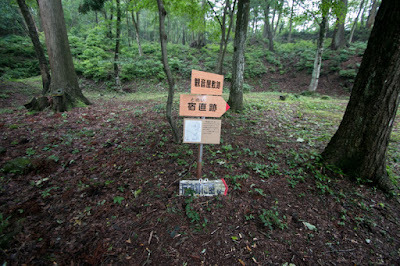 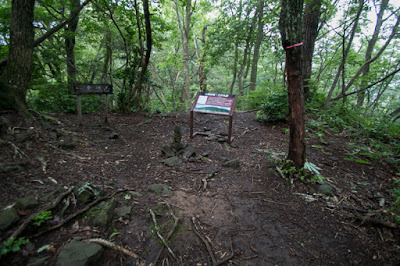 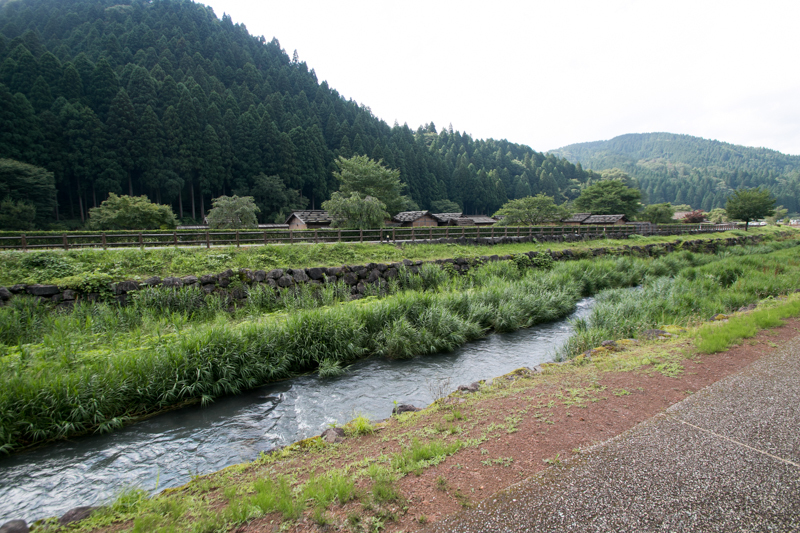 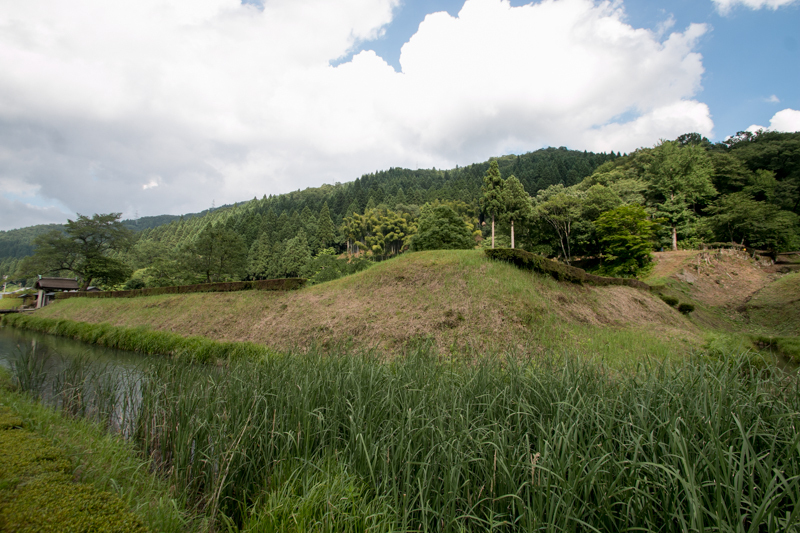 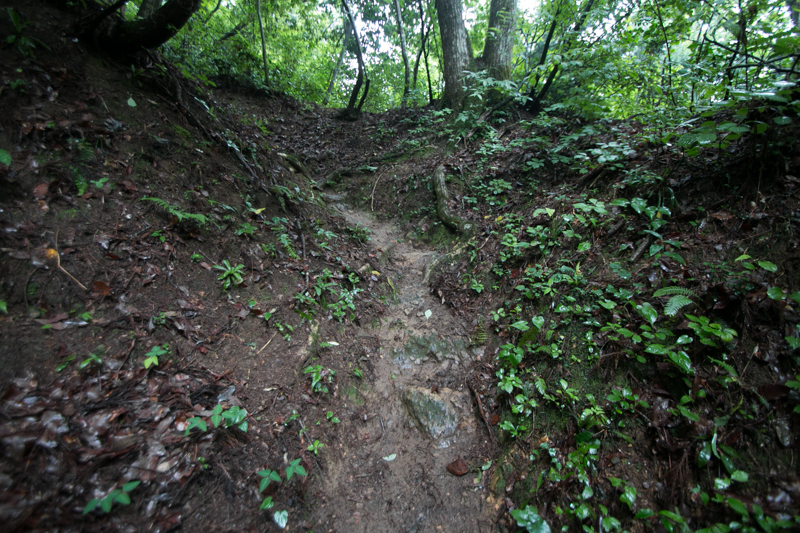 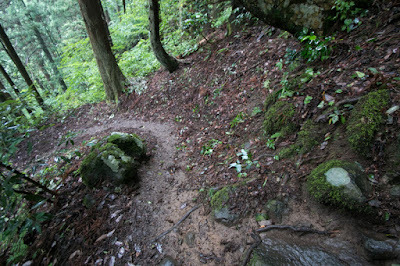 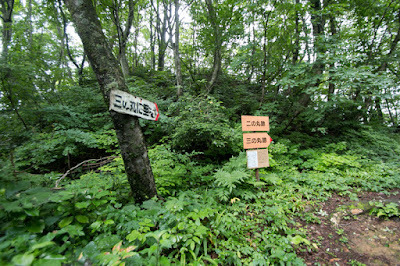 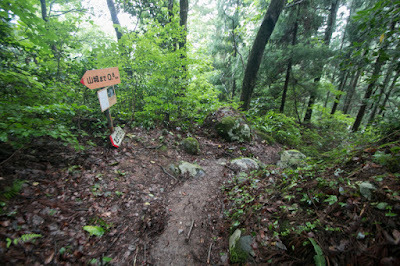 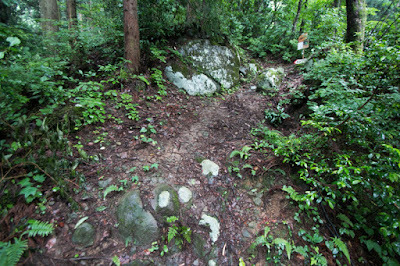 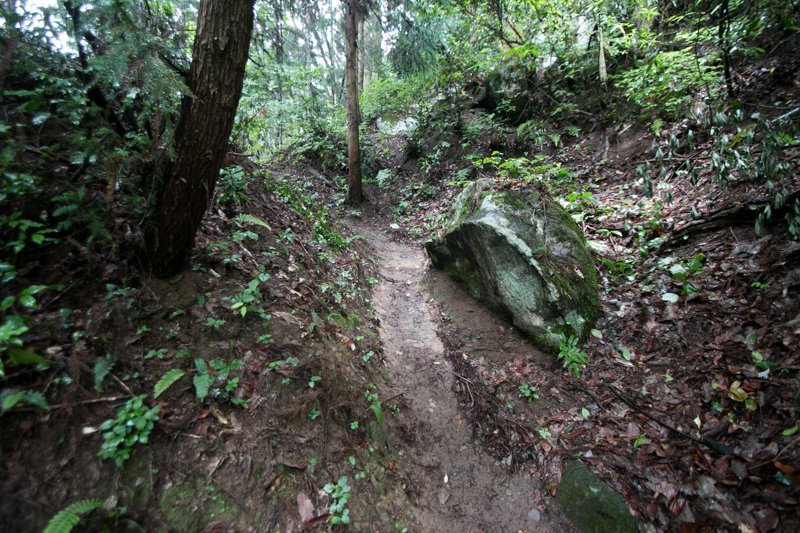 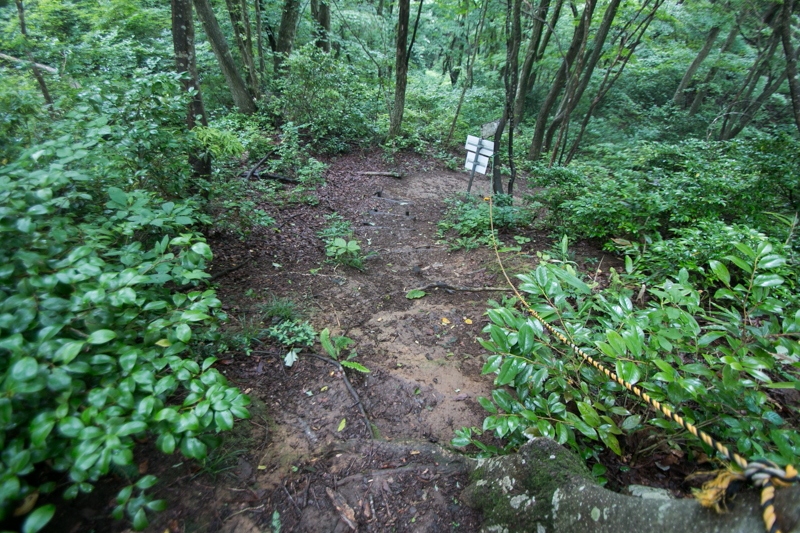 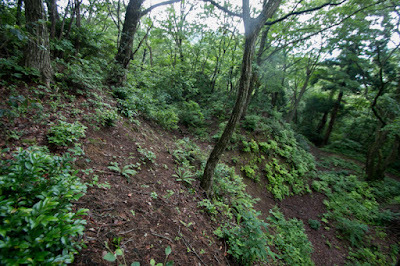 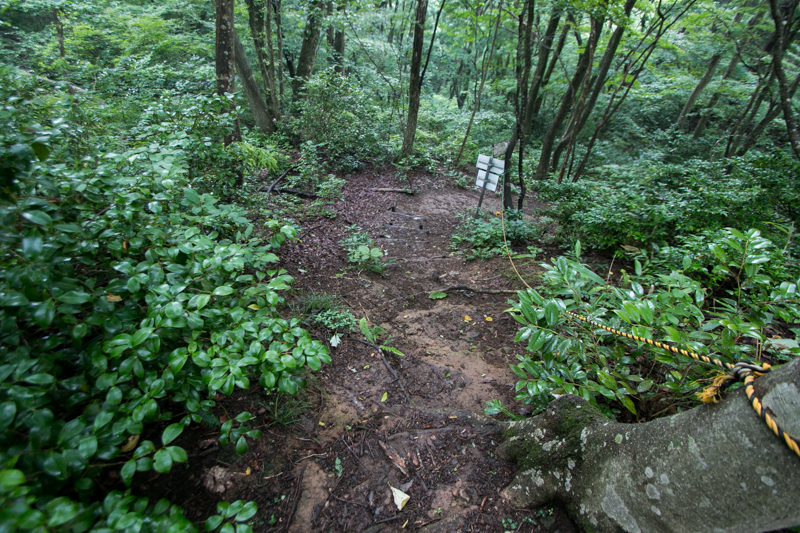 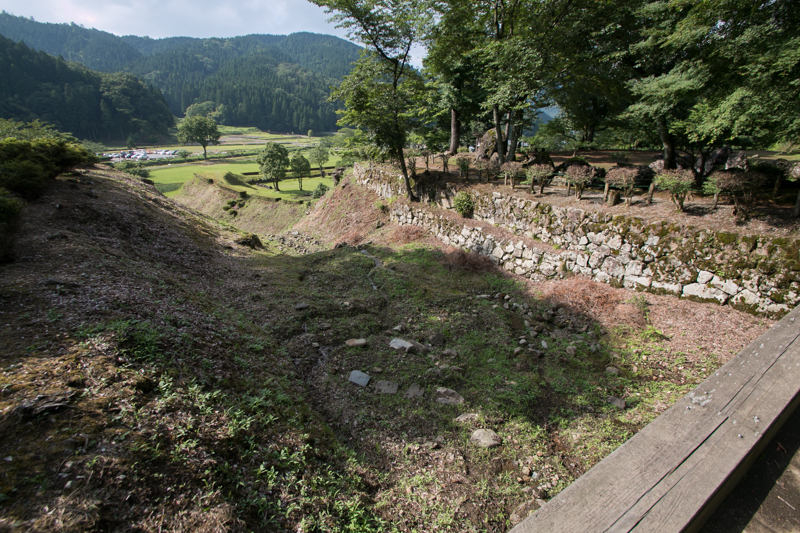 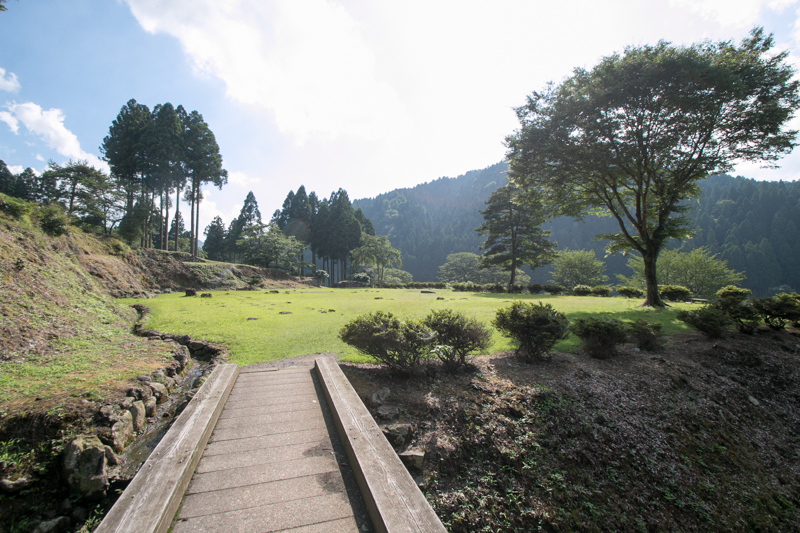 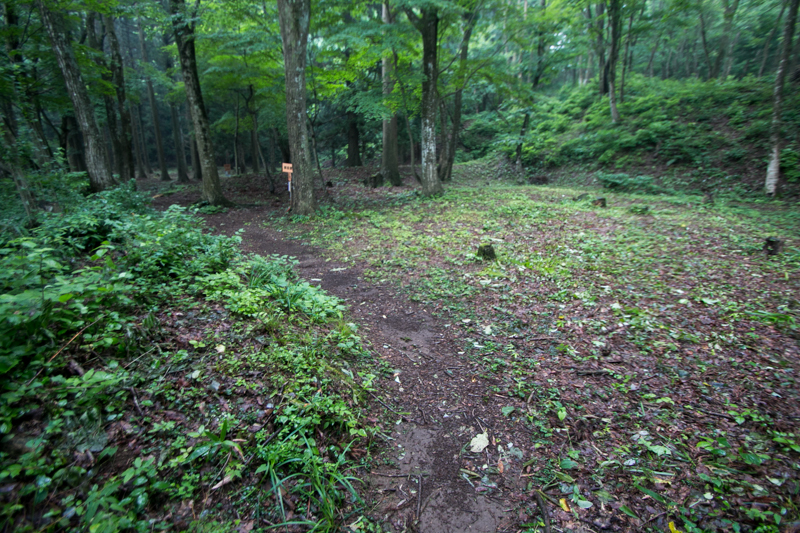 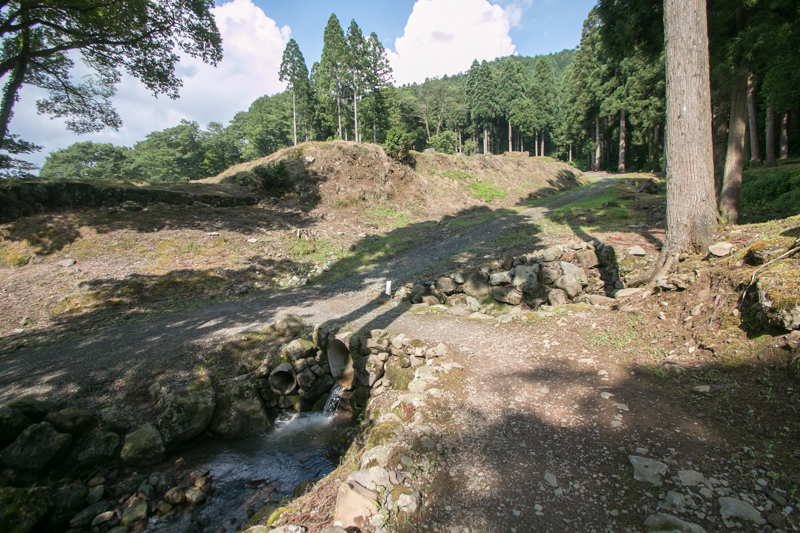 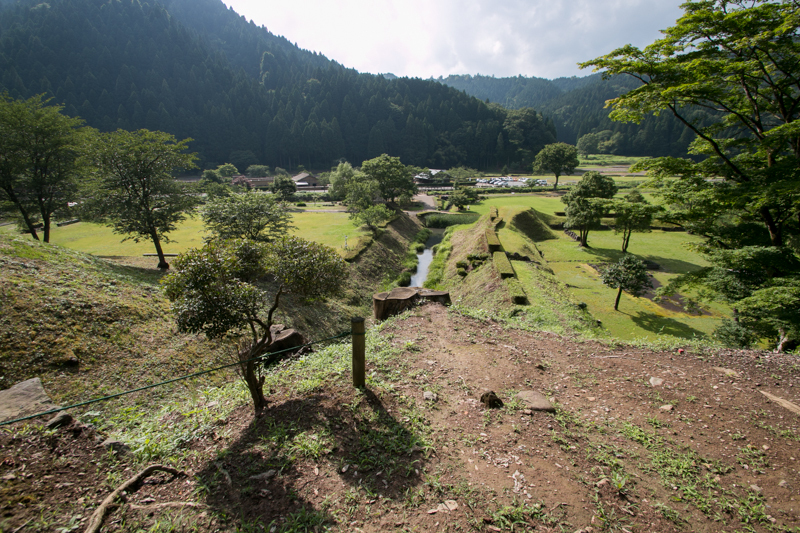 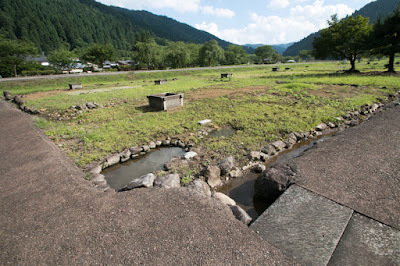 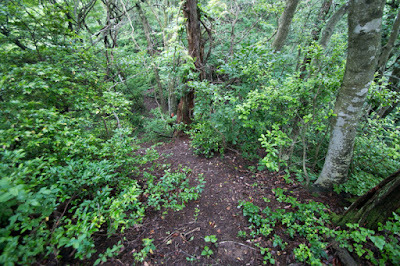 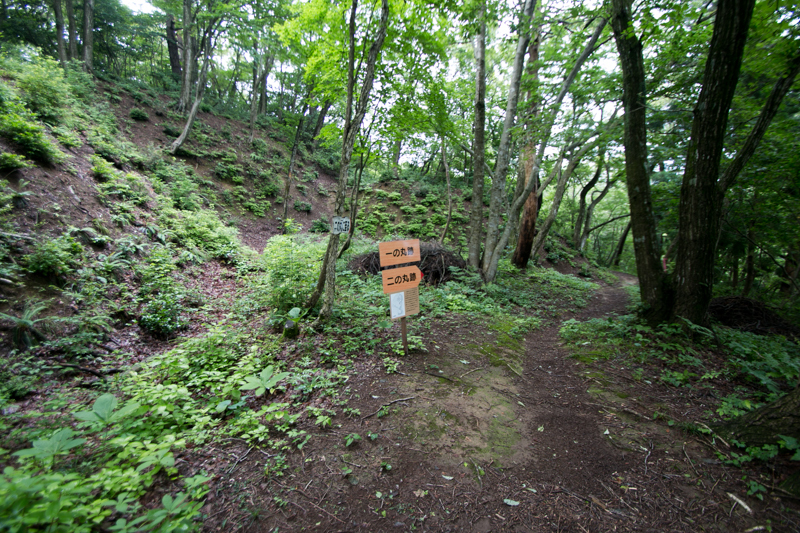 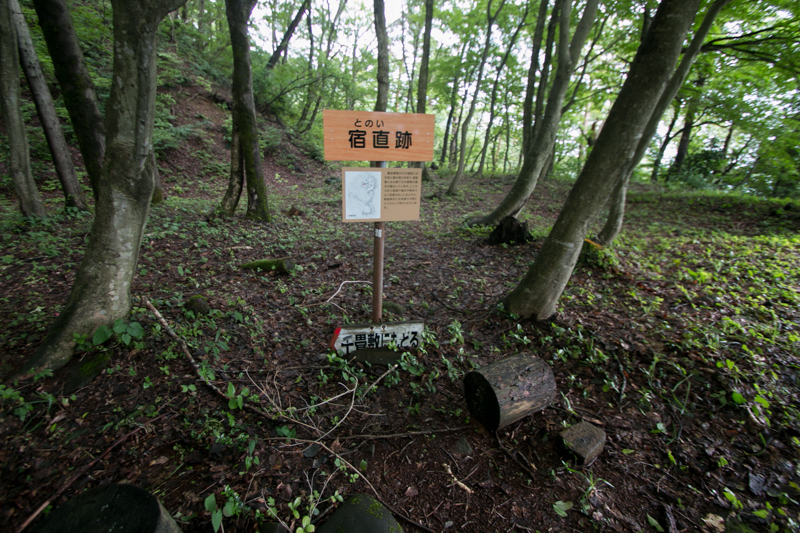 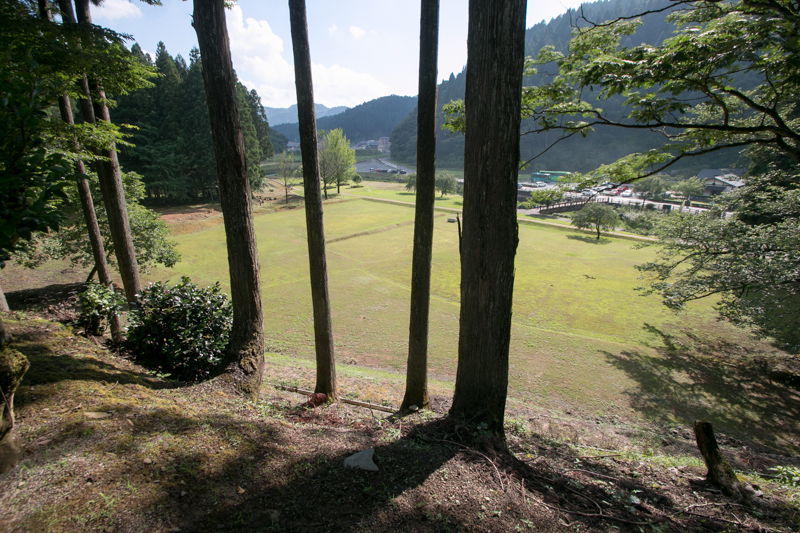 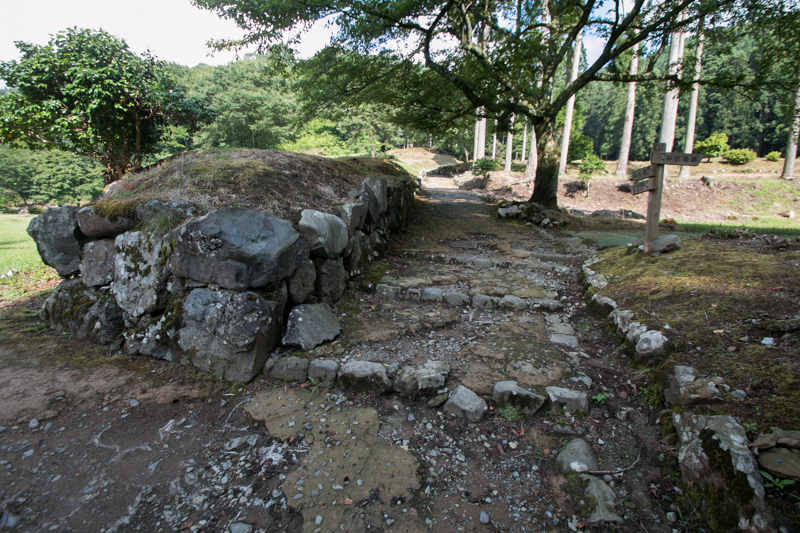 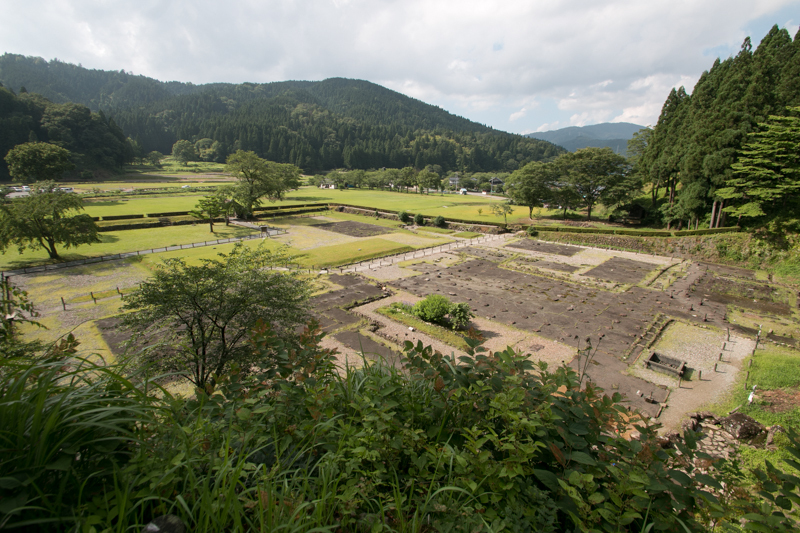 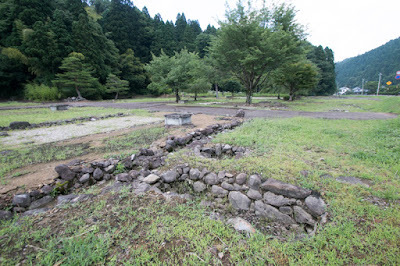 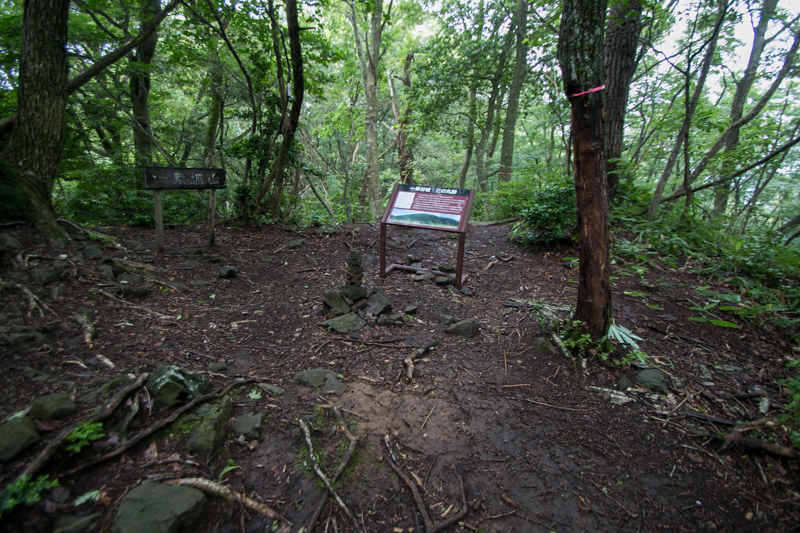 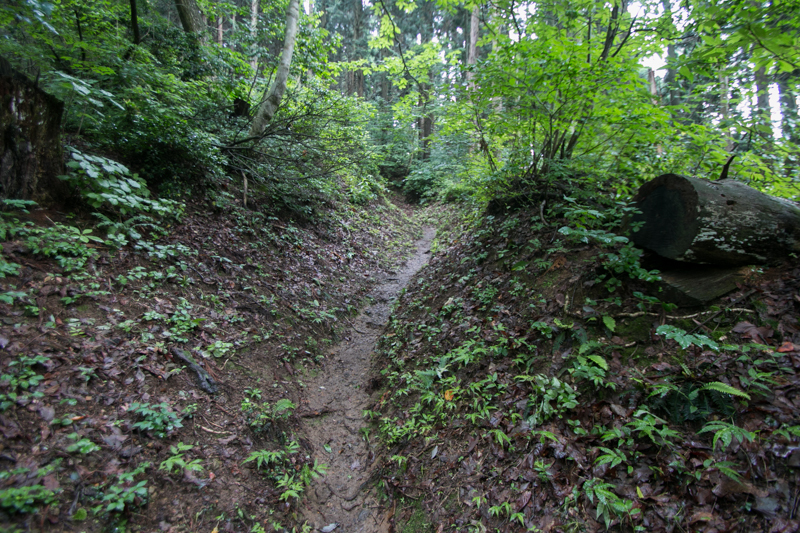 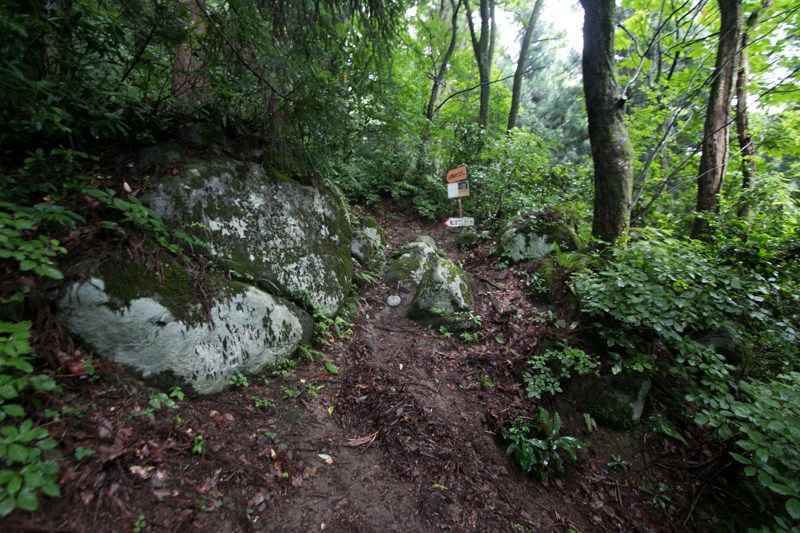 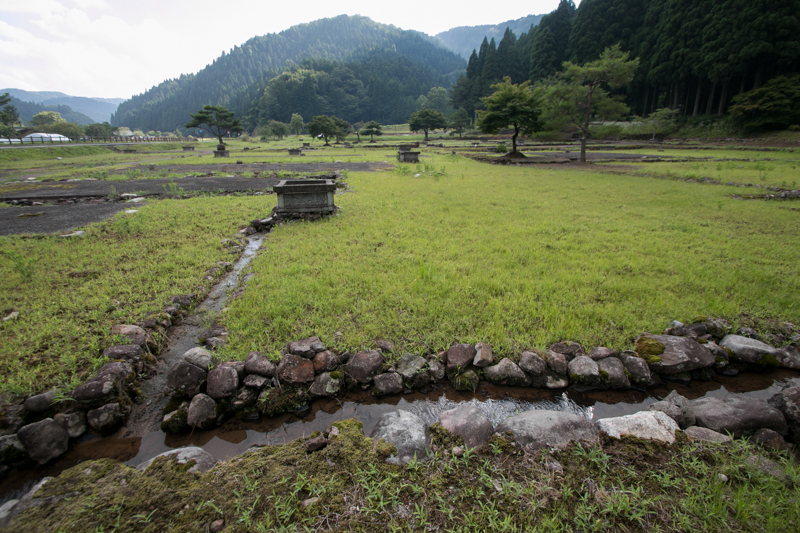 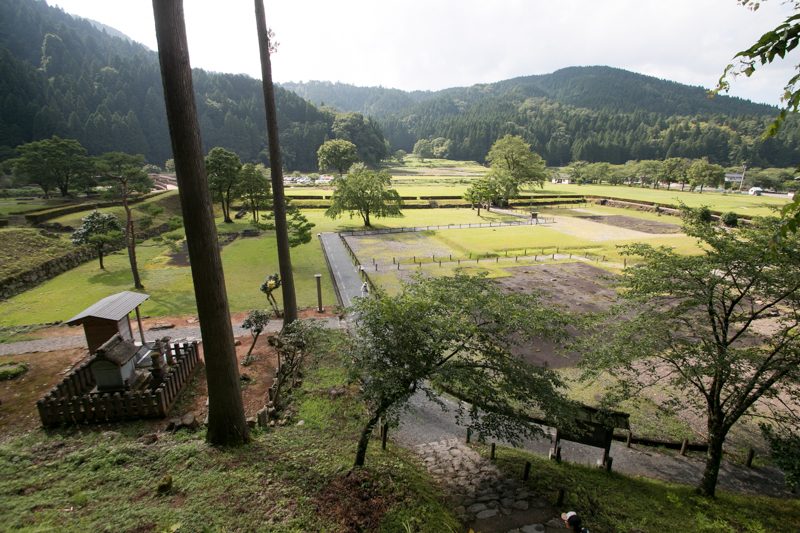 Now most part of Ichijyodani valley is nominated as Designated National Historical Site, and investigation is still proceeding. 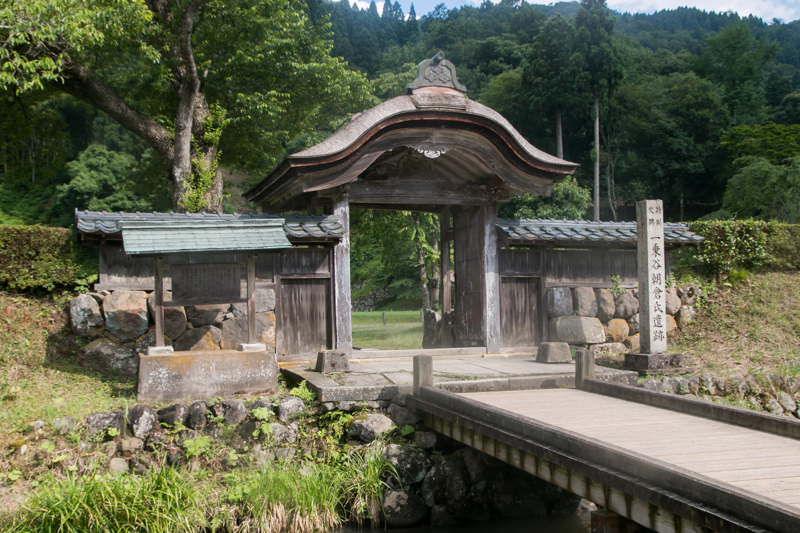 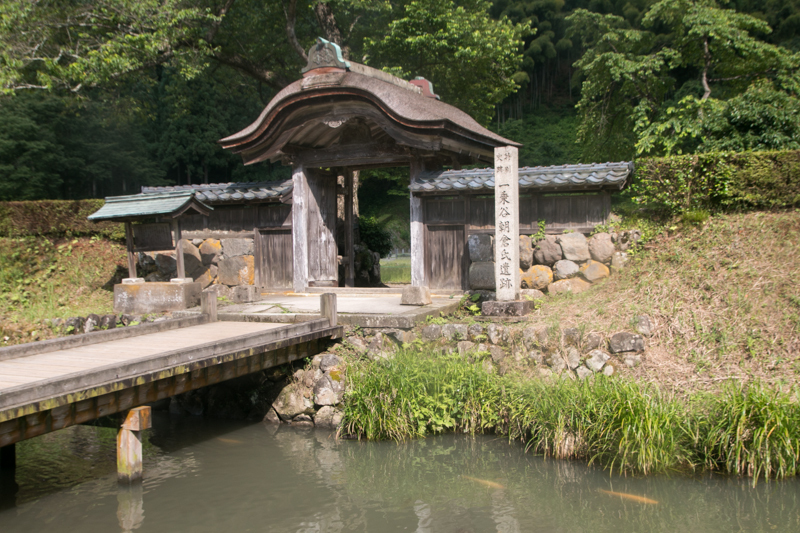 A Chinese style gate was built at the front gate of former Asakura clan residence, which is said to be moved from Fushimi castle by Hideyoshi Toyotomi. 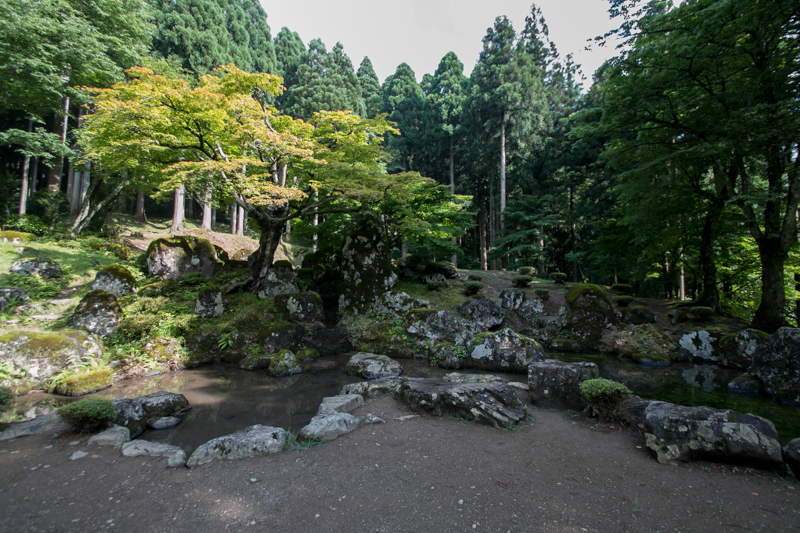 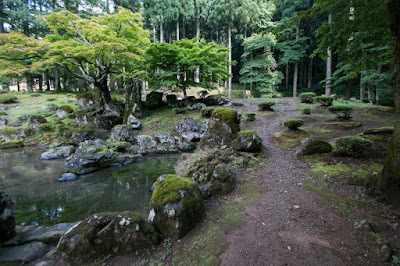 Also Japanese gardens at the residence of Yoshikage and relatives were restored, and tell us former cultural prosperity of this town. 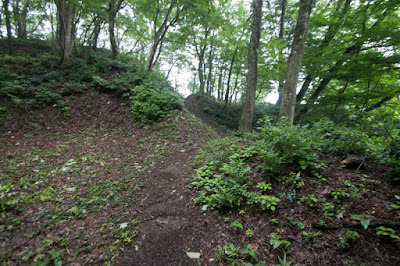 In castle town residence of retainers and merchants were restored based on the result of investigation, and this might be only one place where we can see the shape of medieval town street. 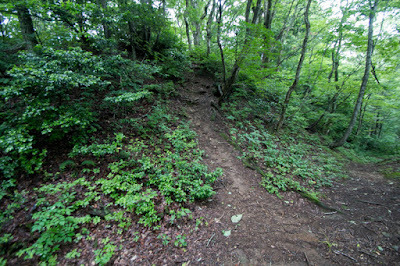 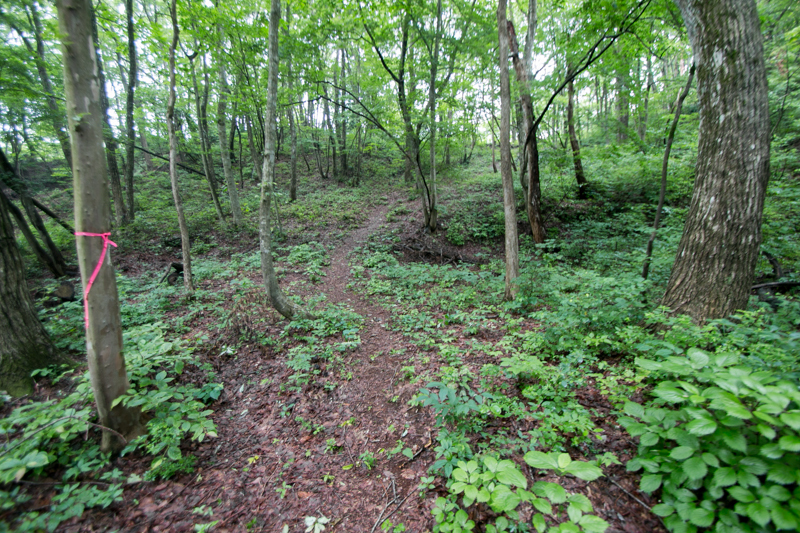 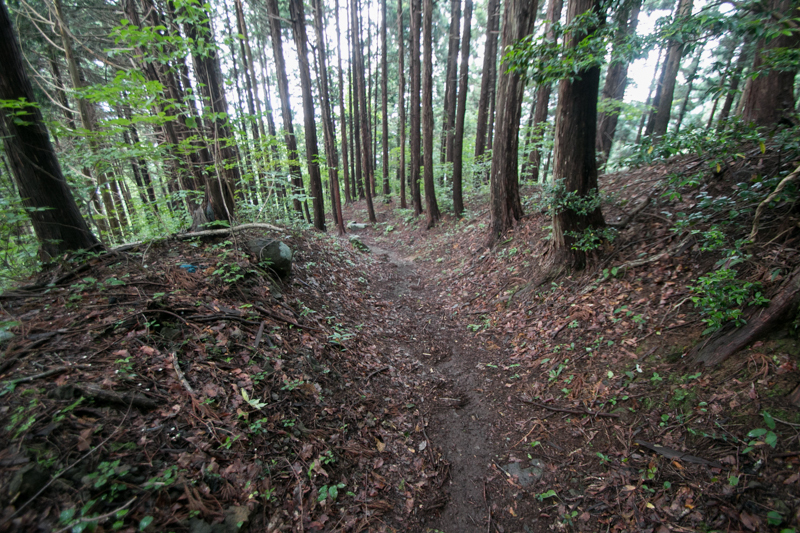 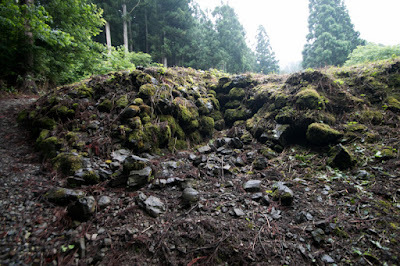 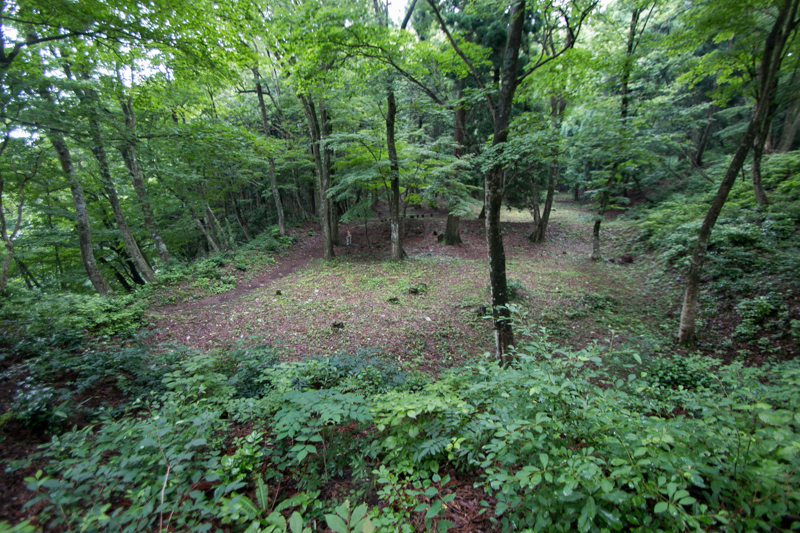 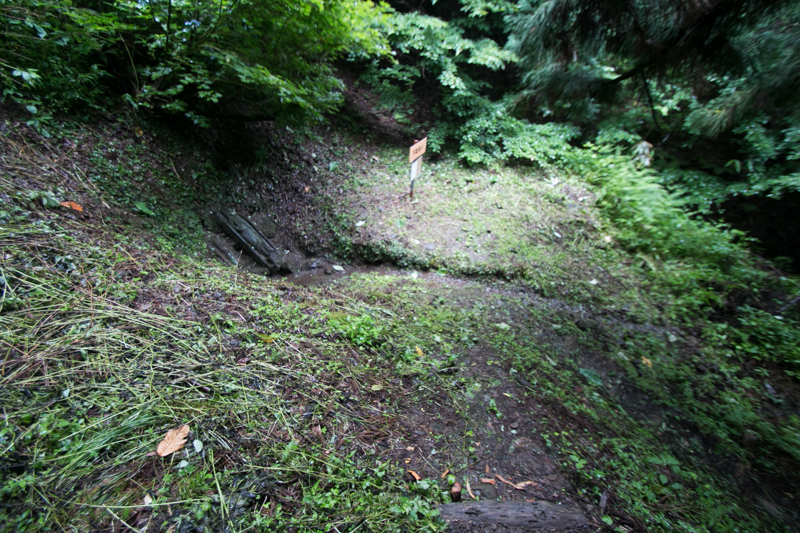 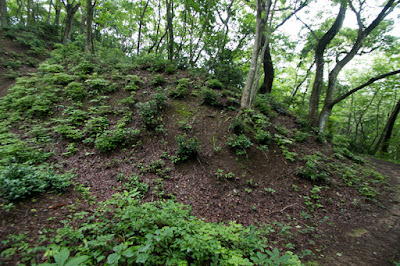 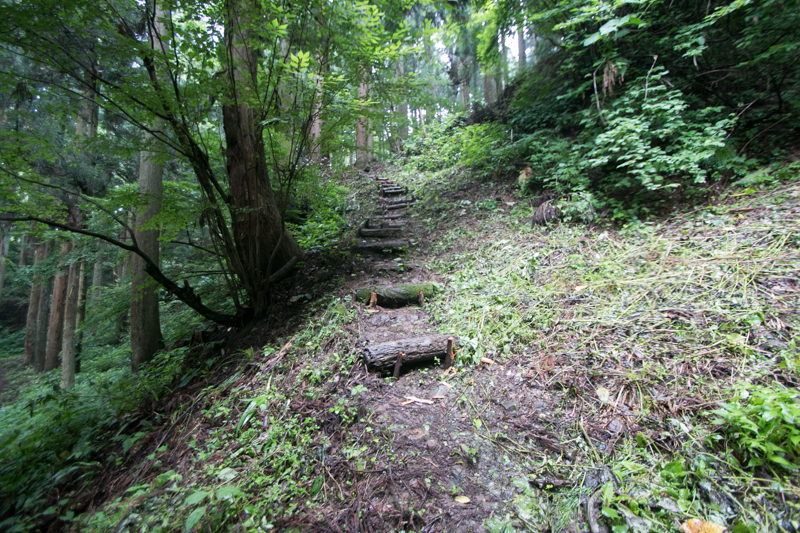 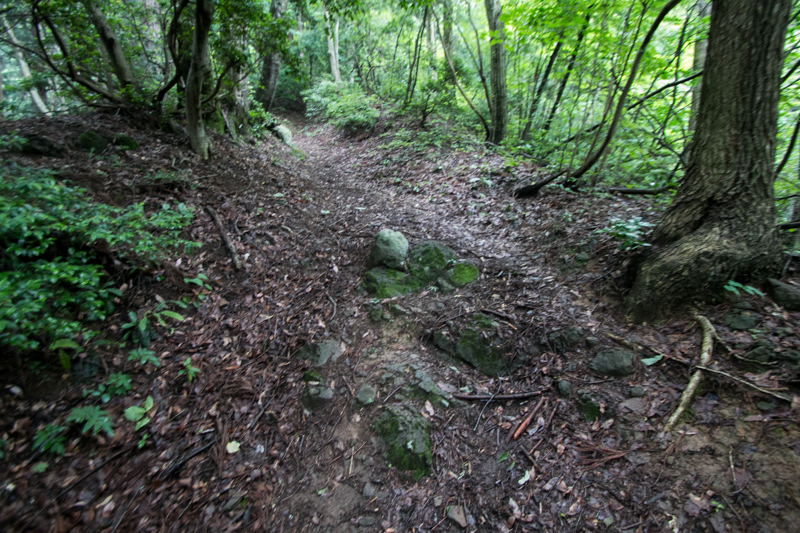 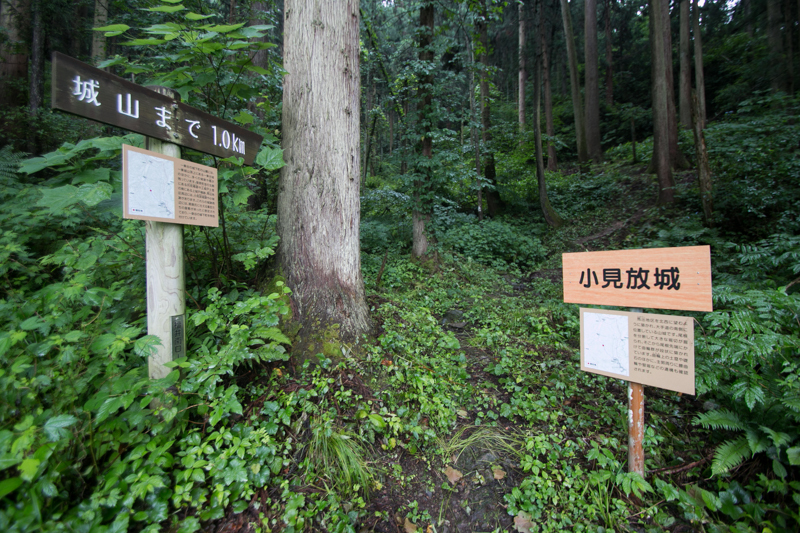 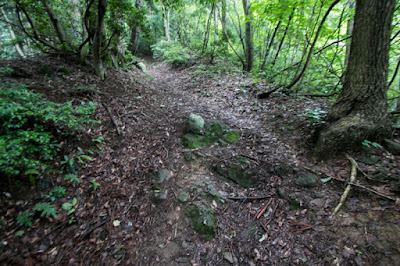 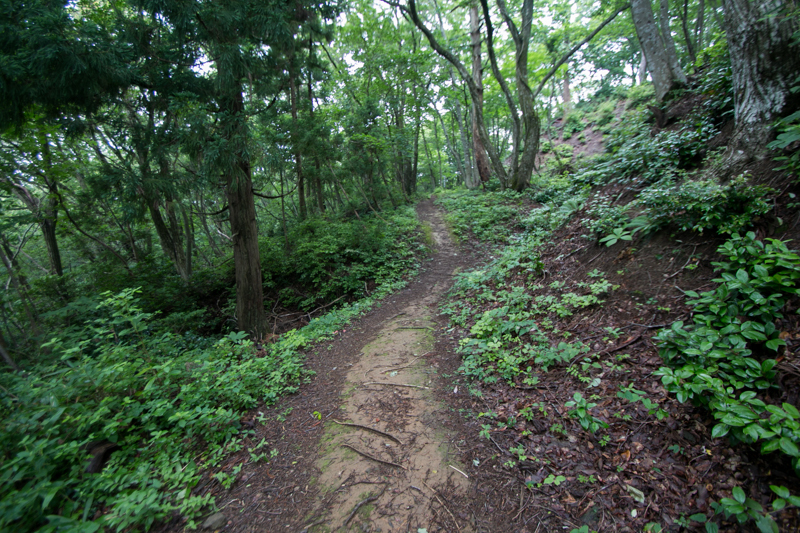 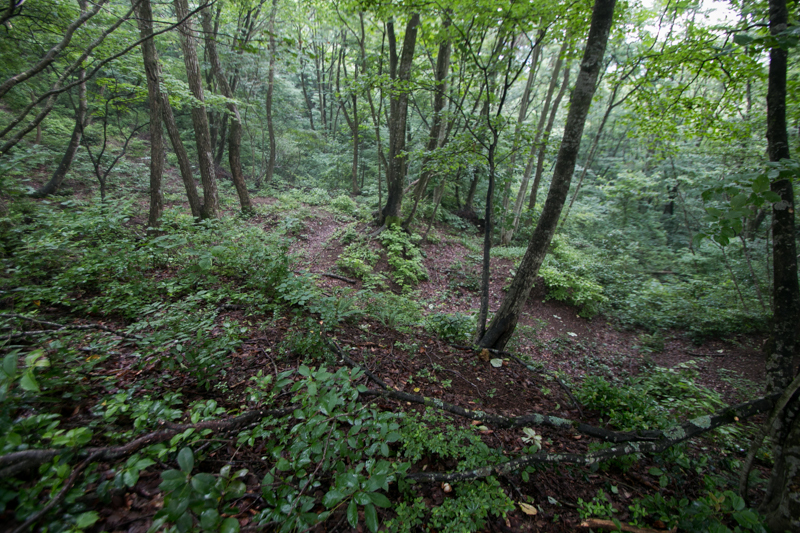 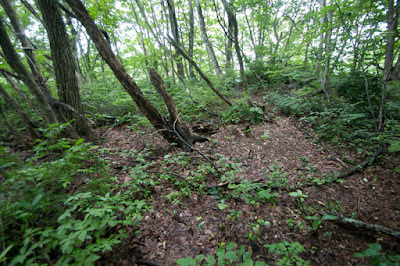 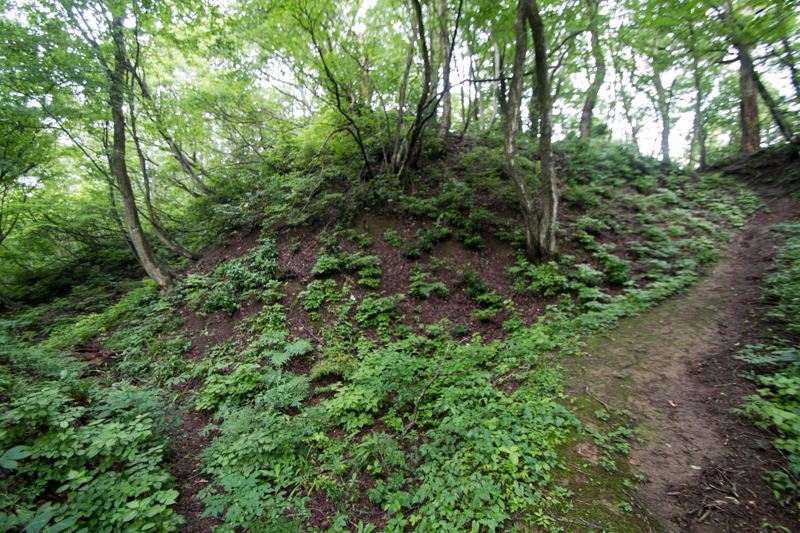 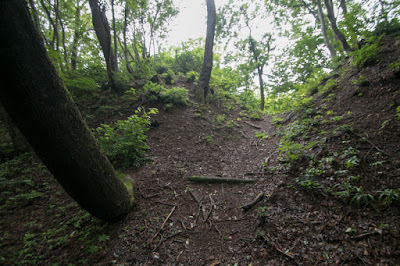 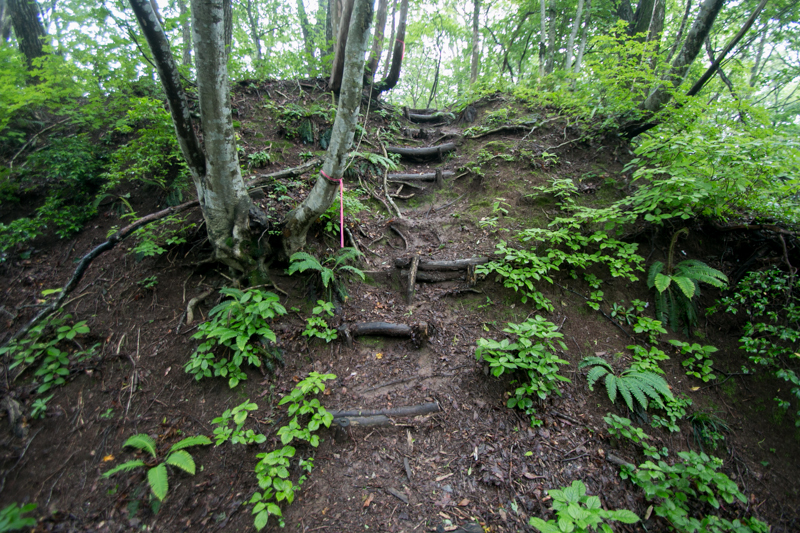 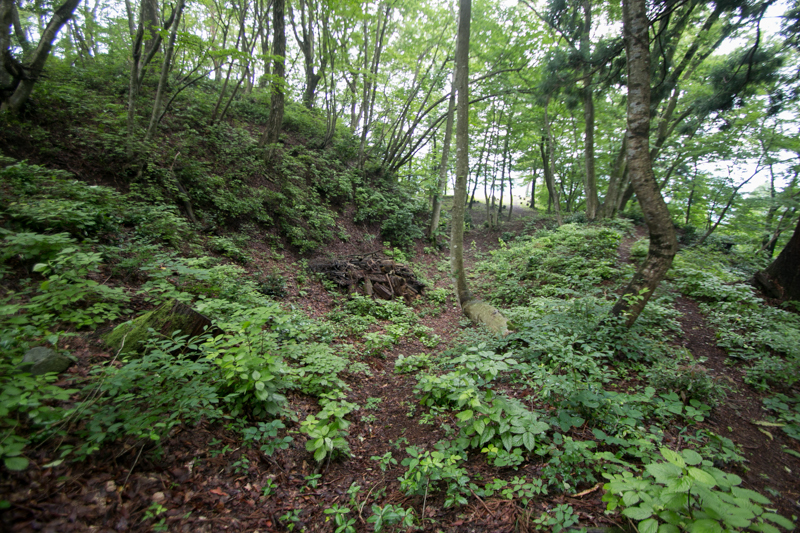 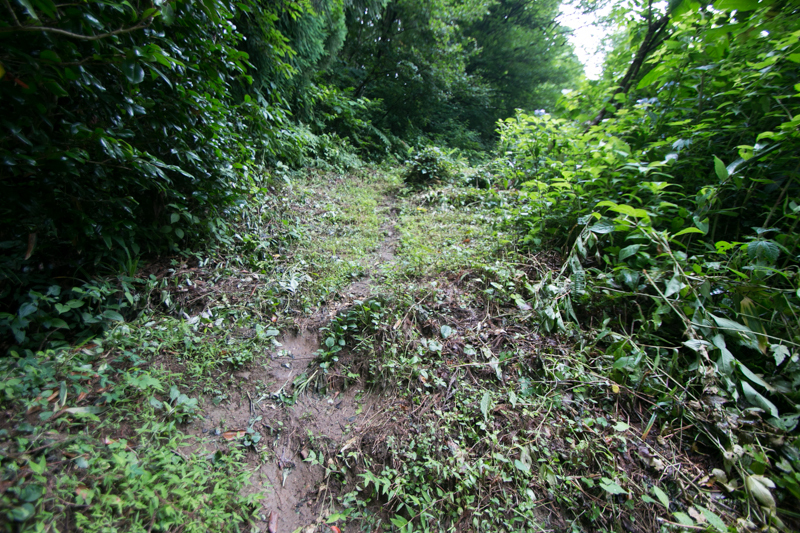 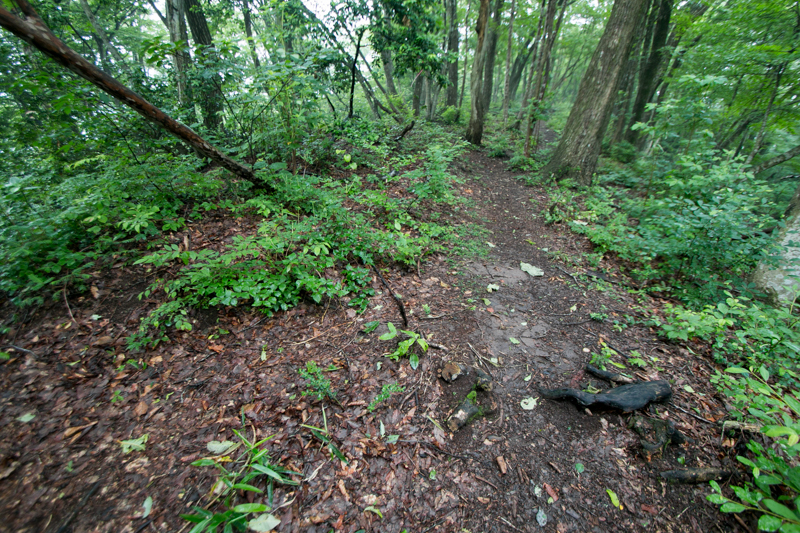 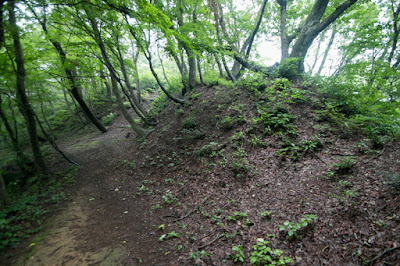 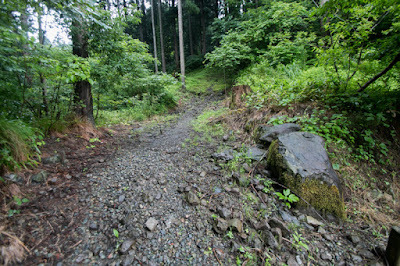 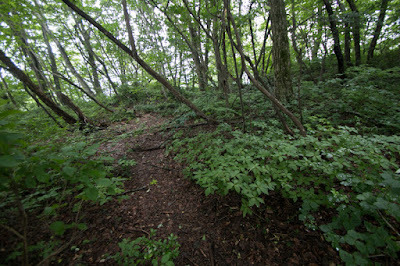 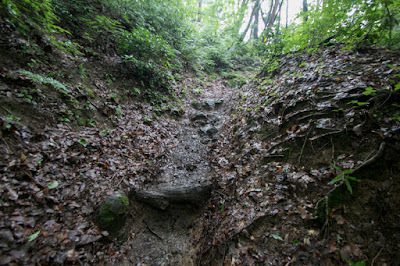 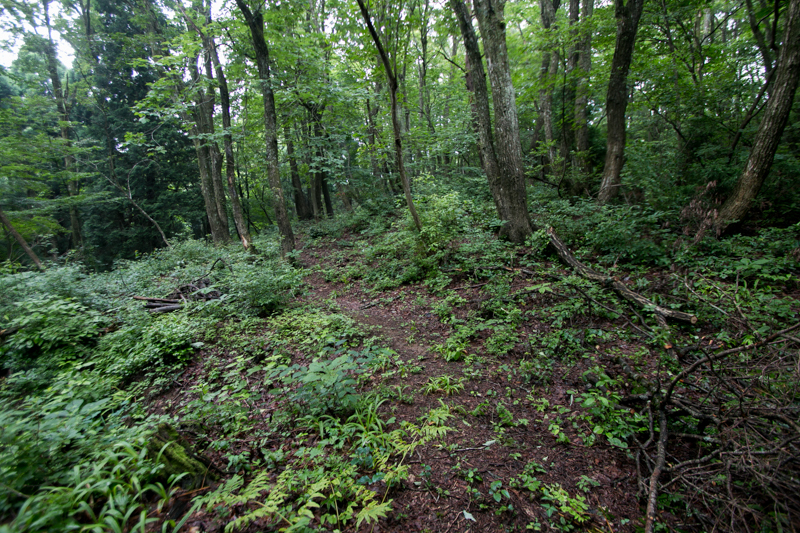 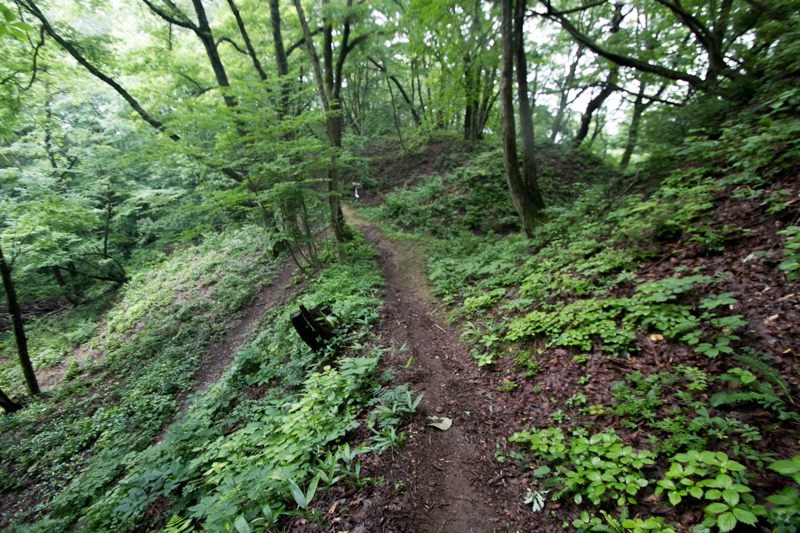 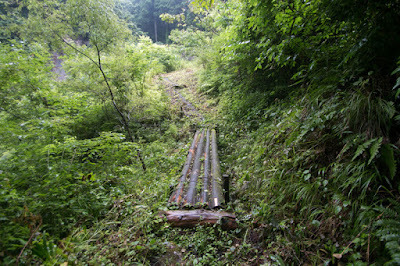 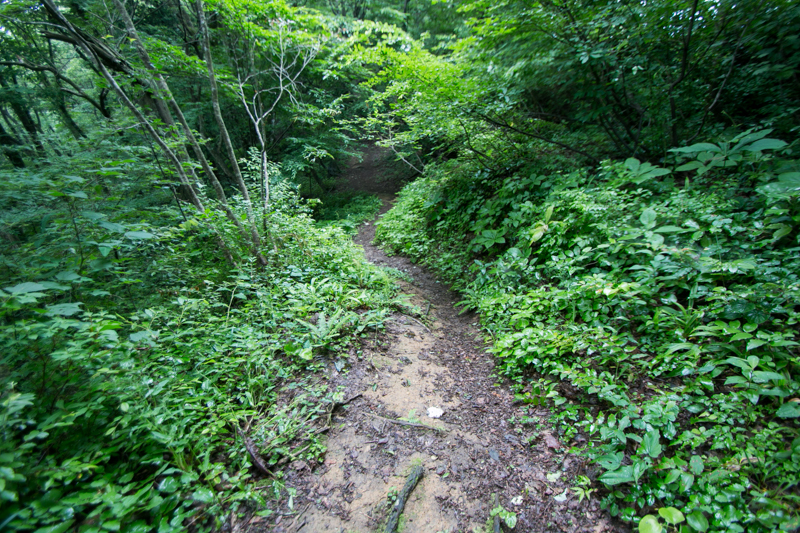 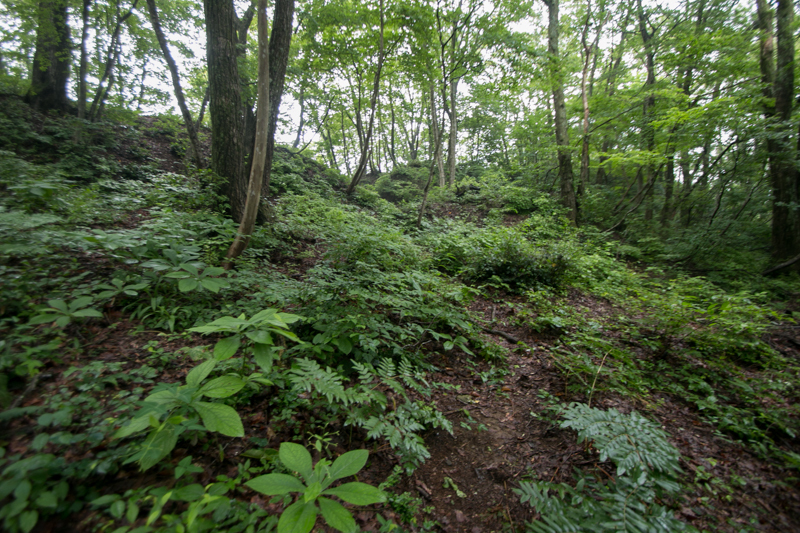 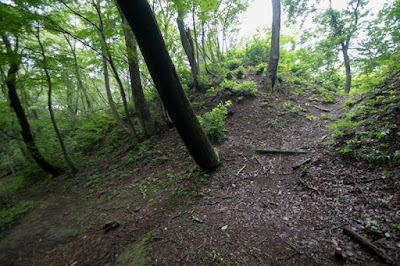 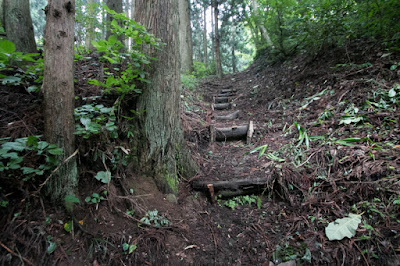 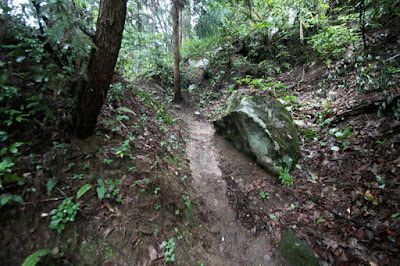 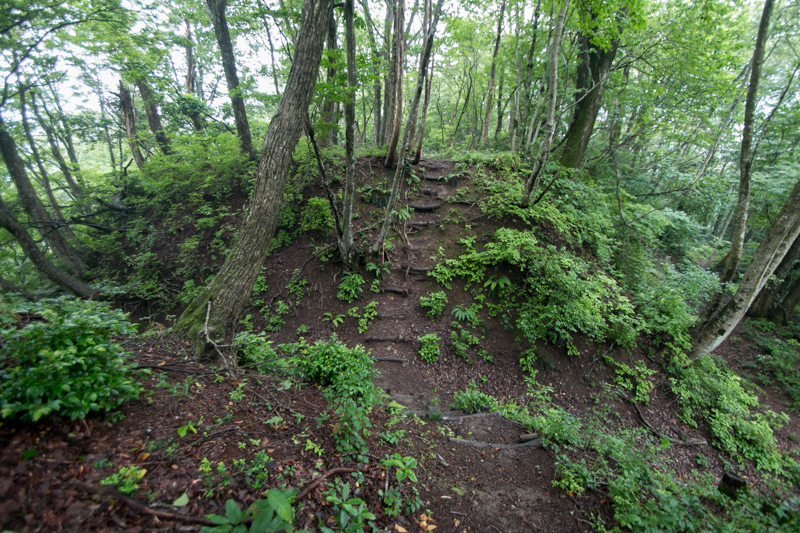 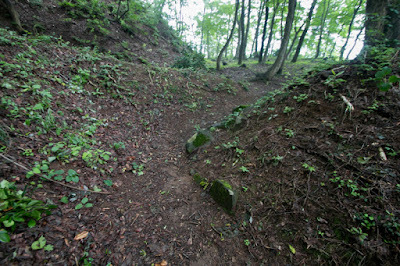 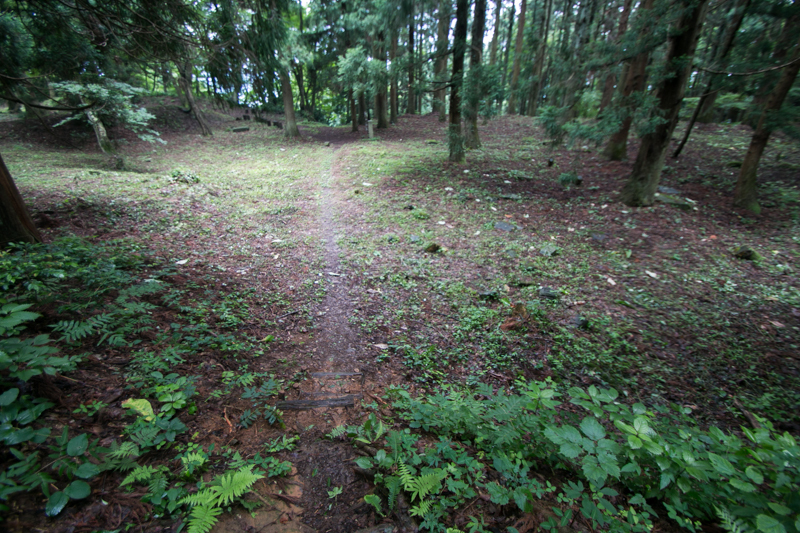 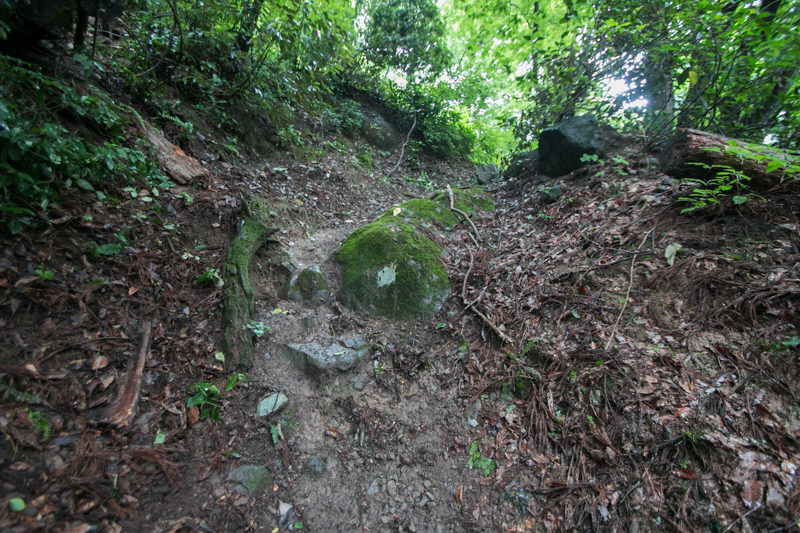 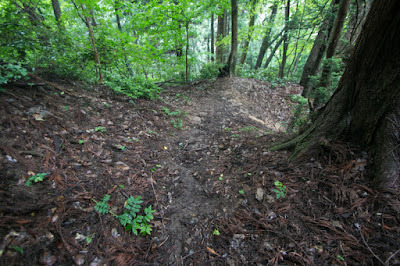 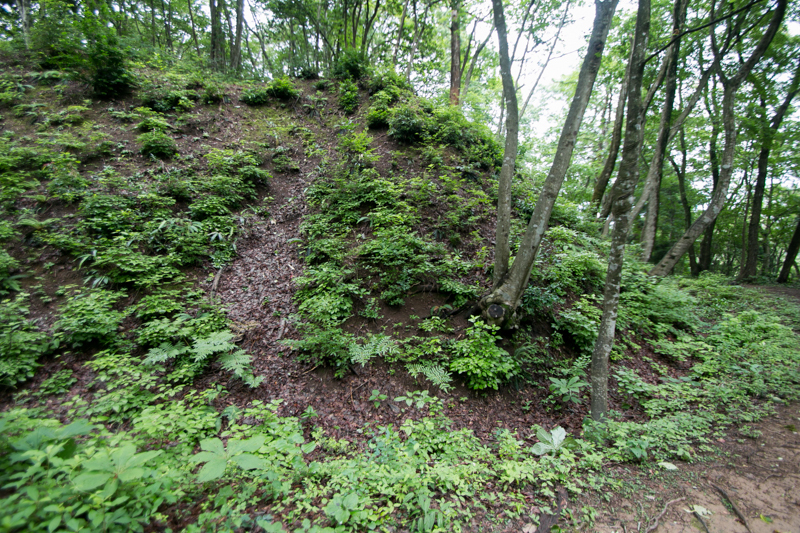 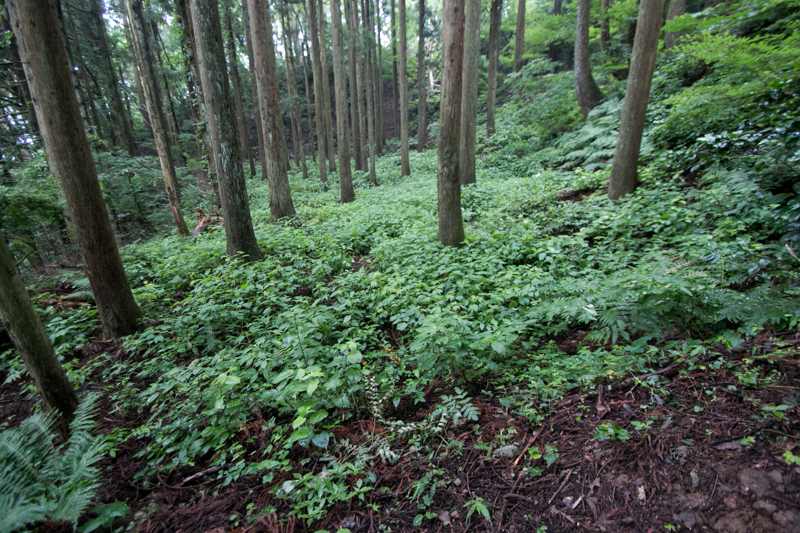 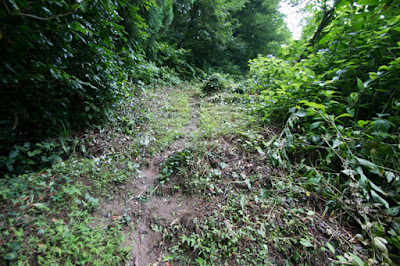 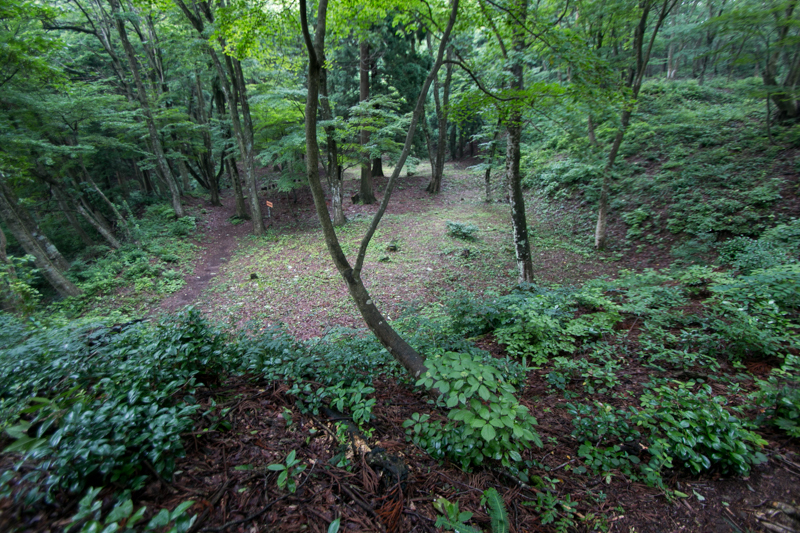 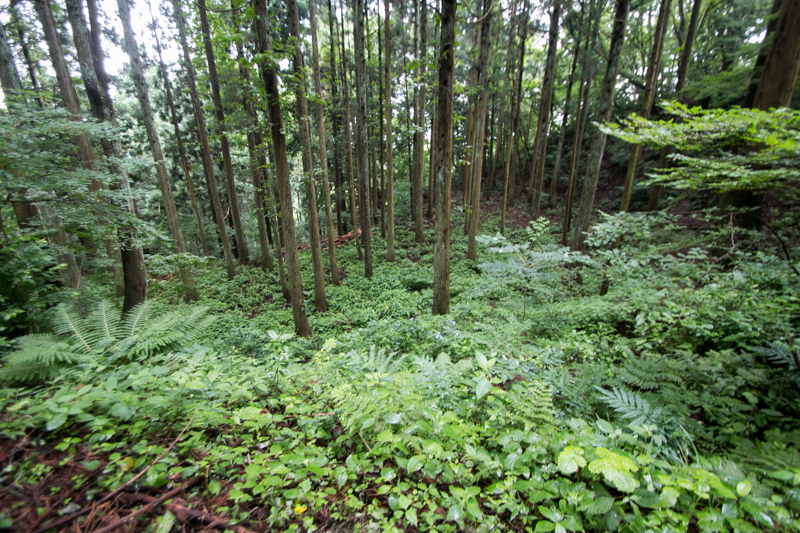 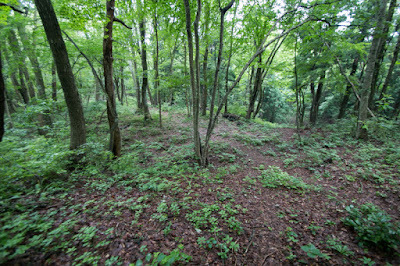 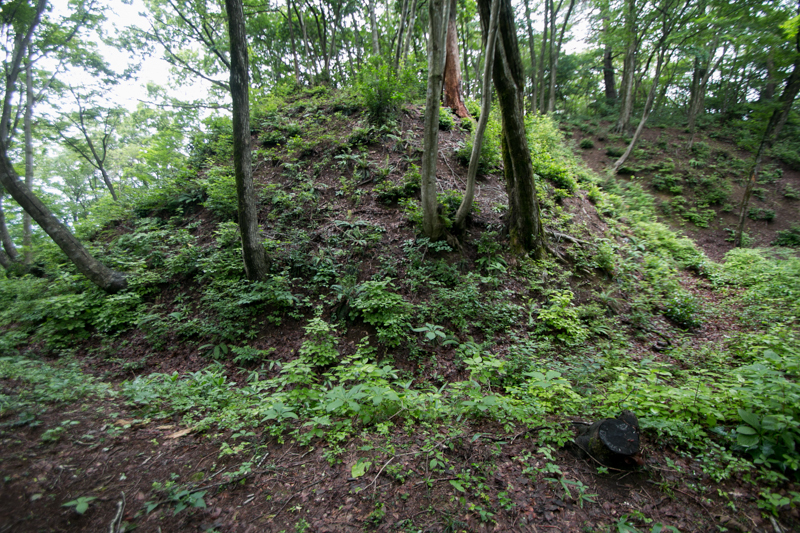 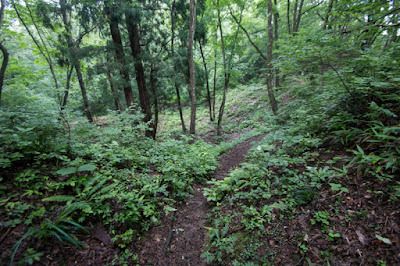 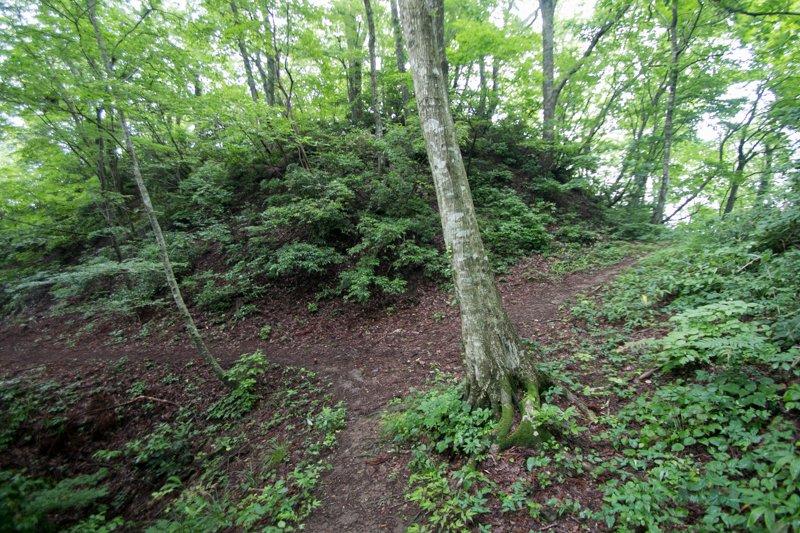 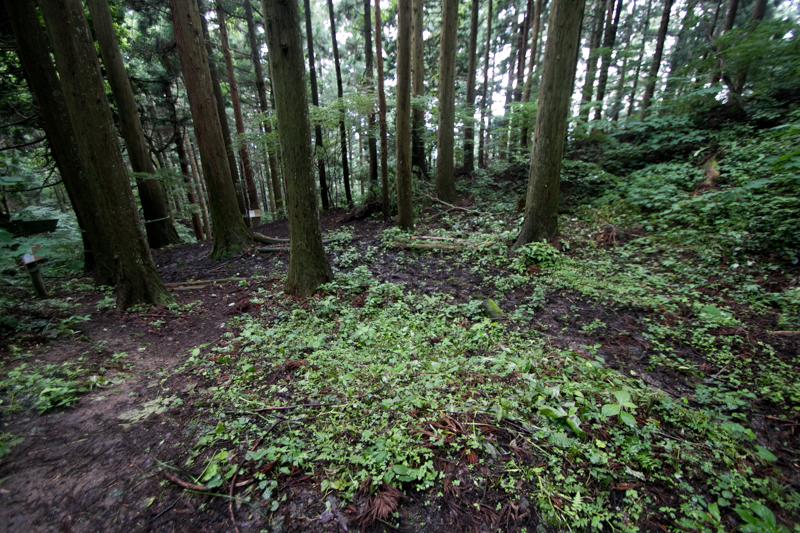 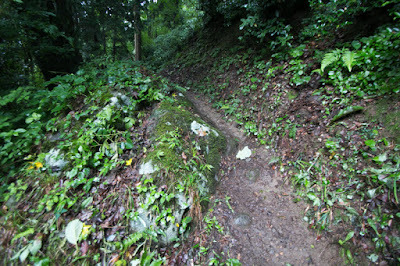 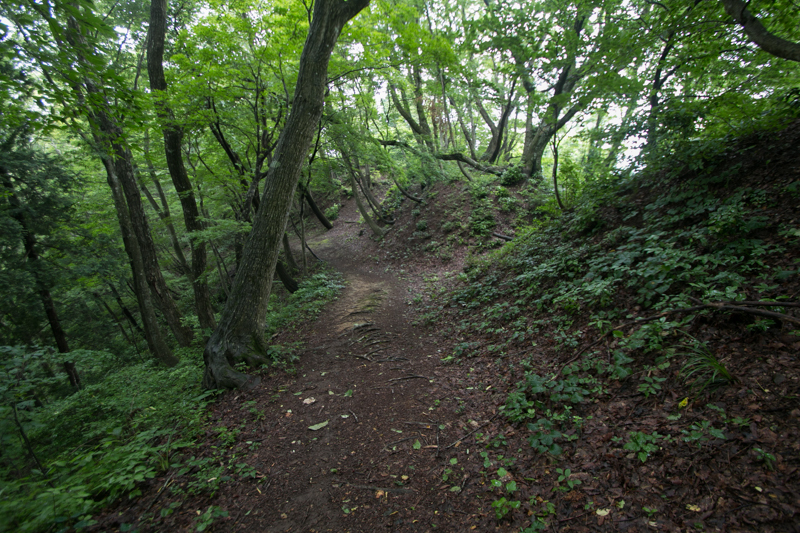 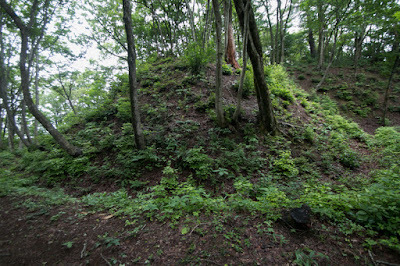 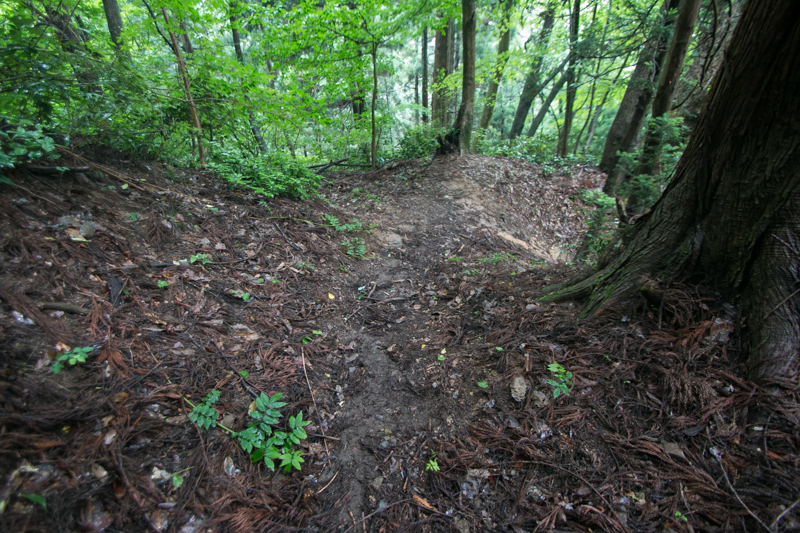 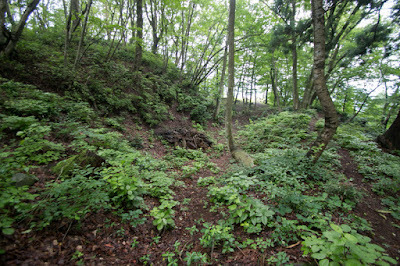 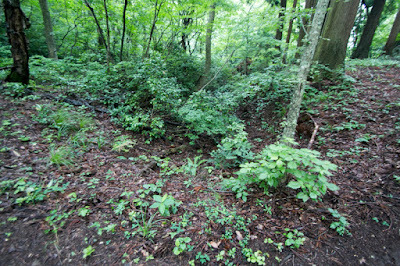 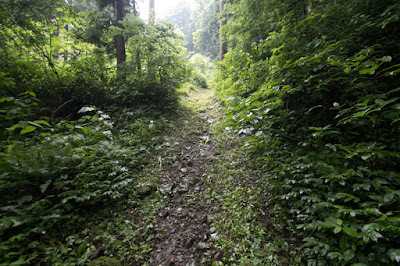 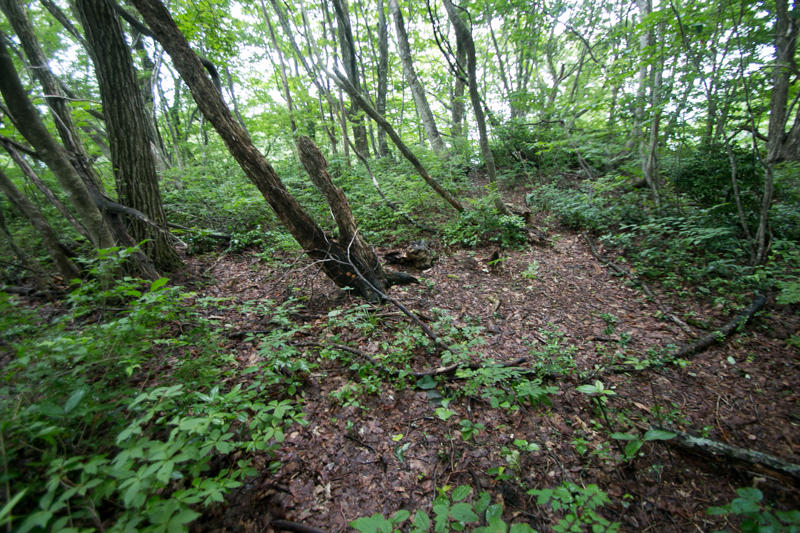 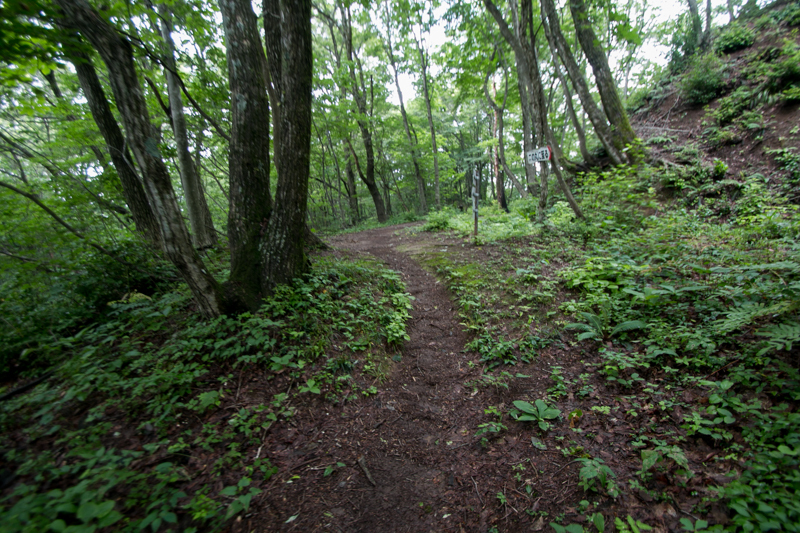 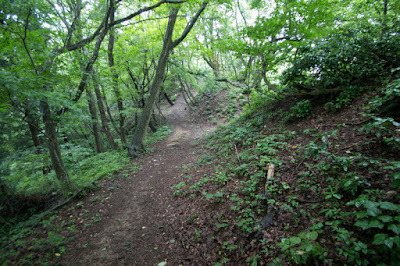 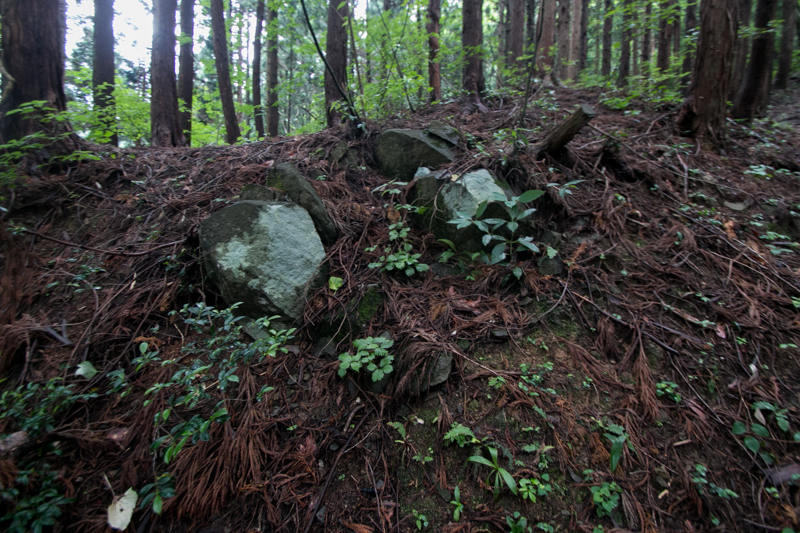 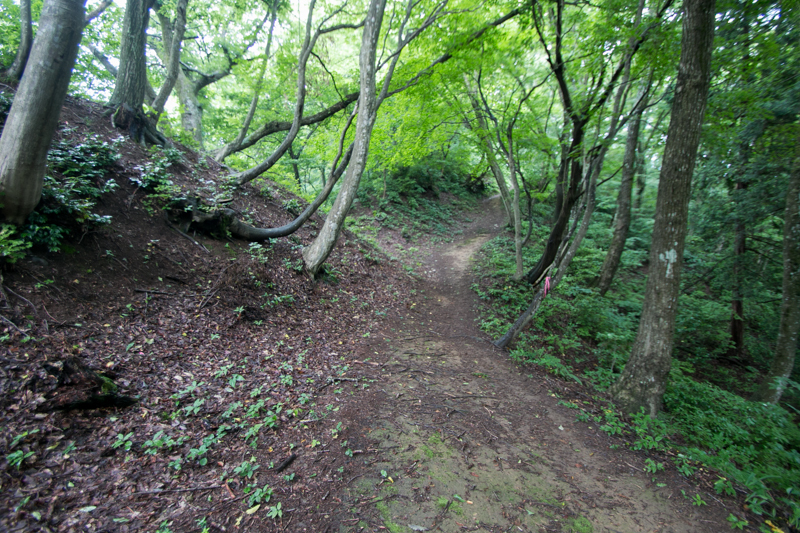 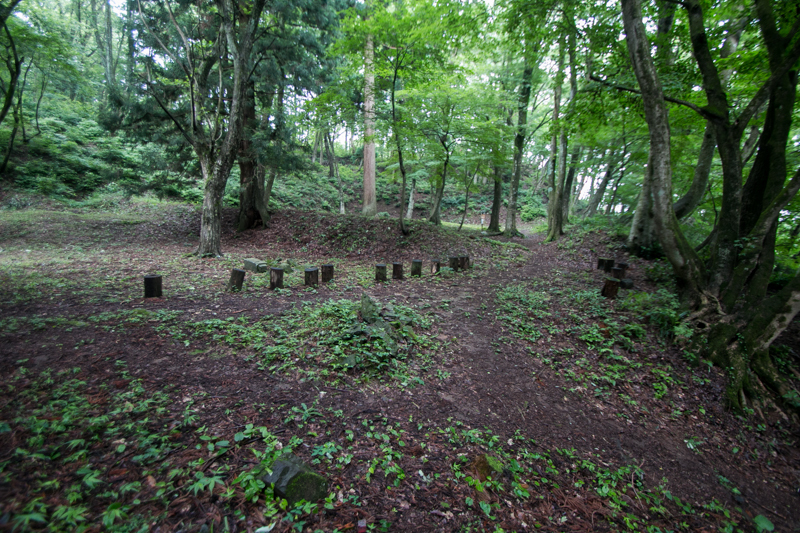 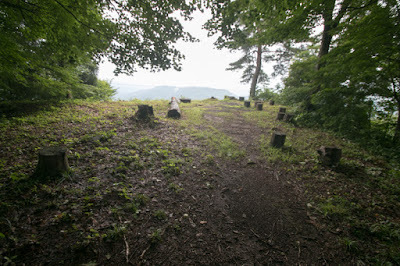 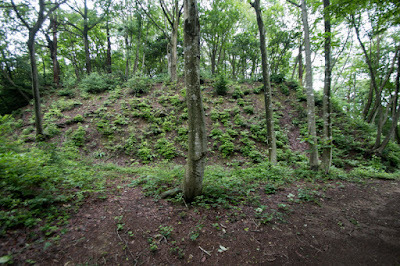 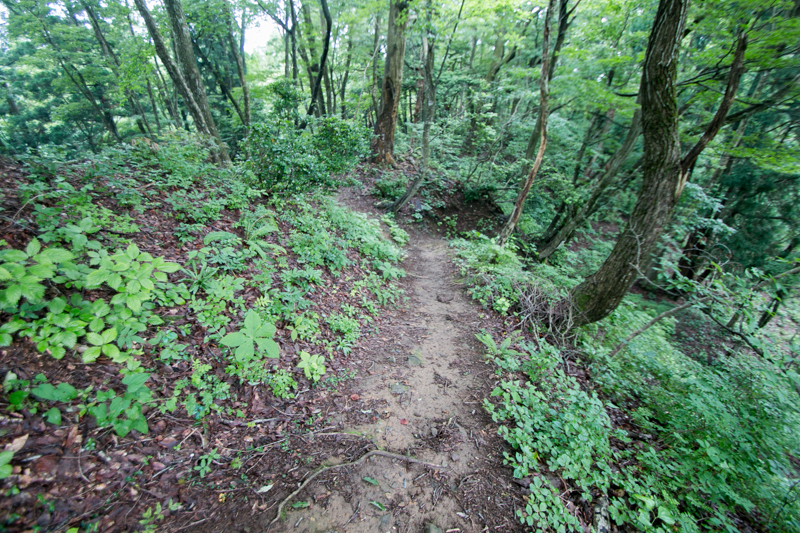 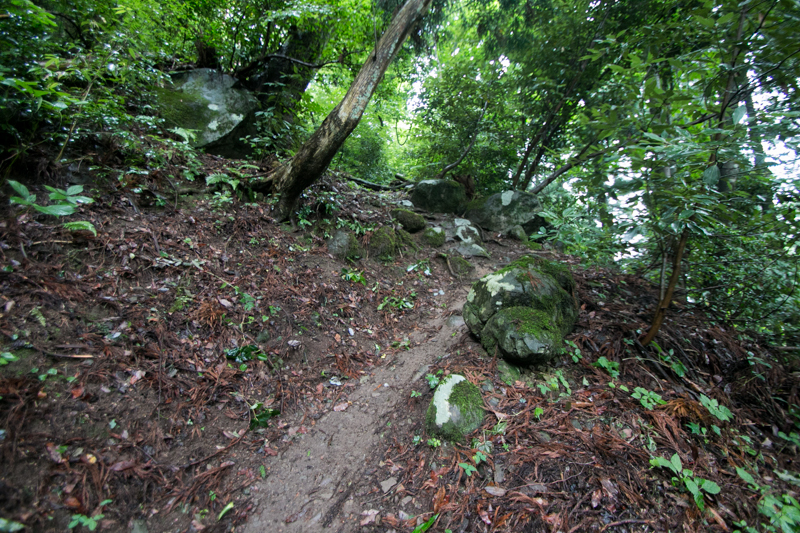 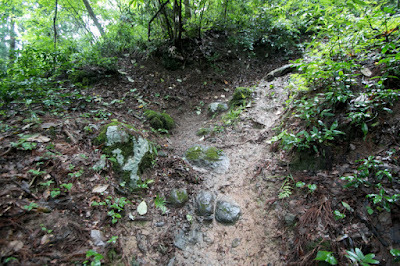 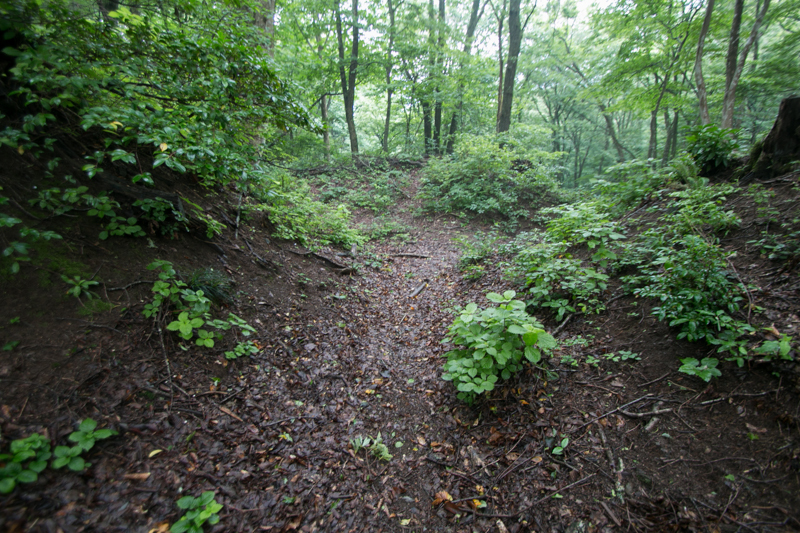 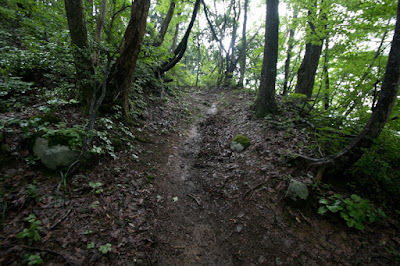 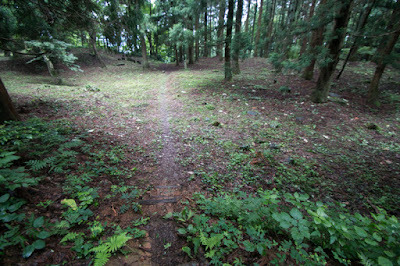 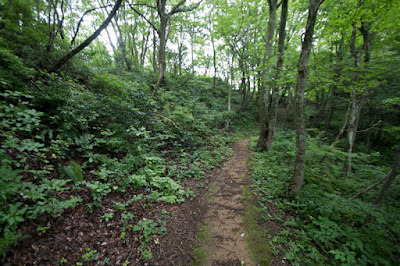 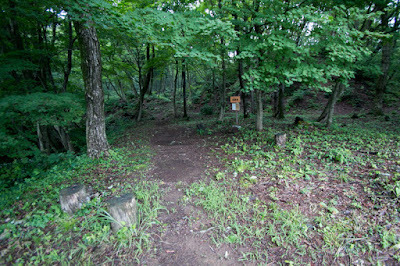 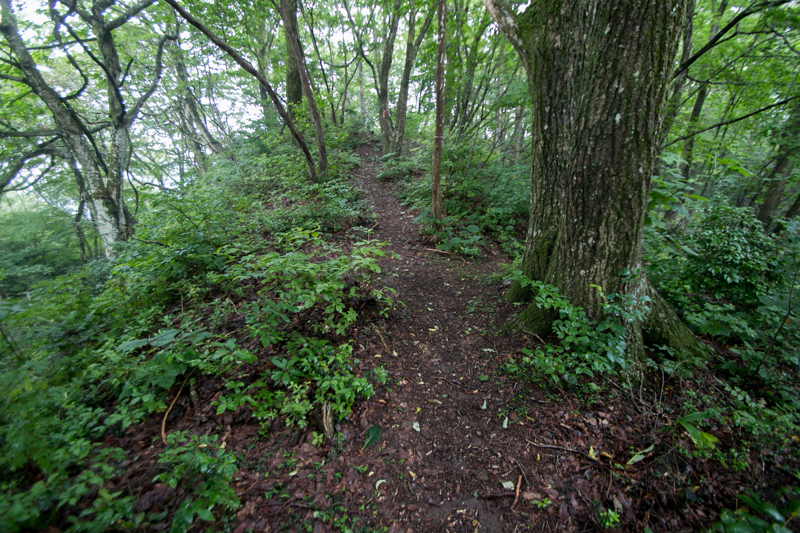 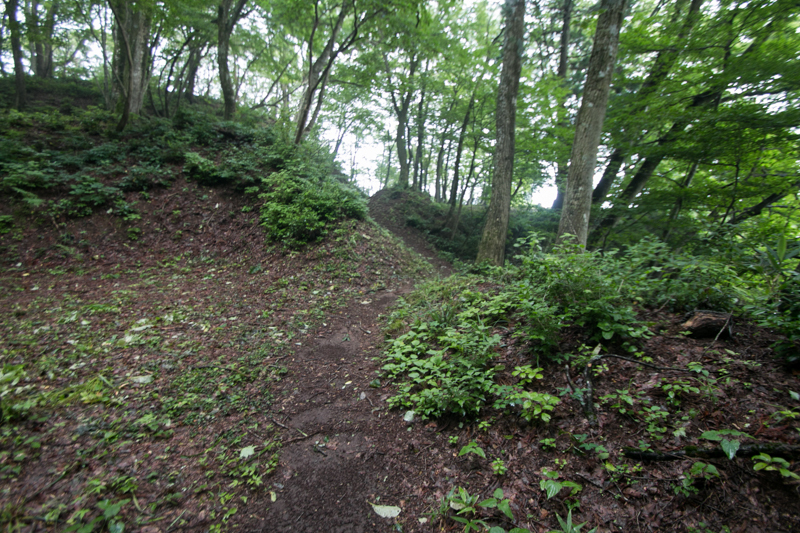 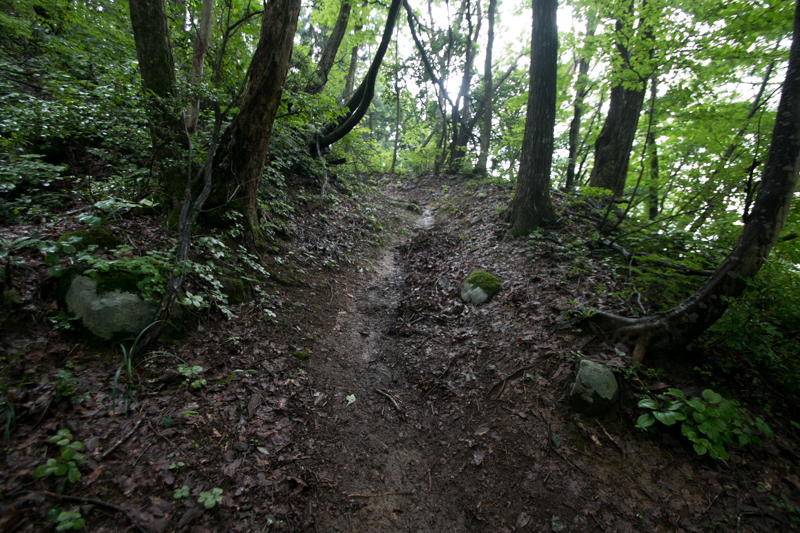 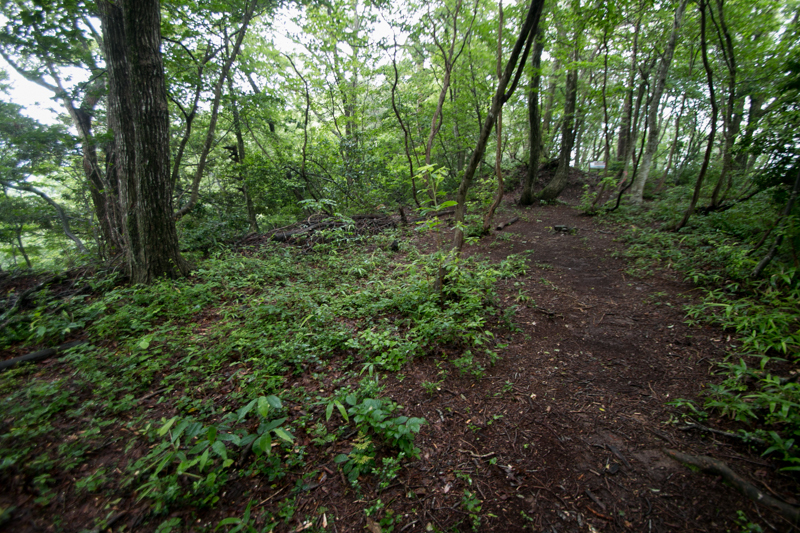 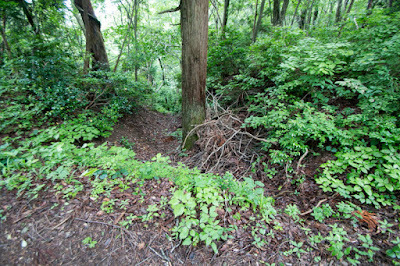 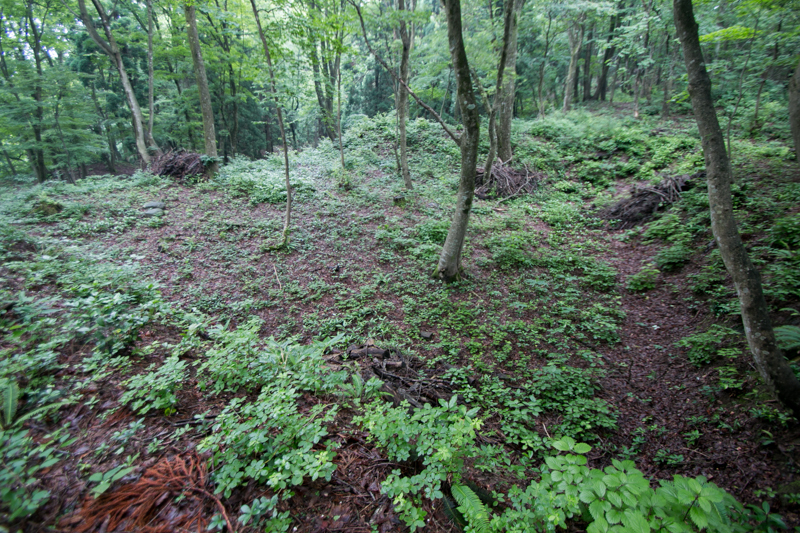 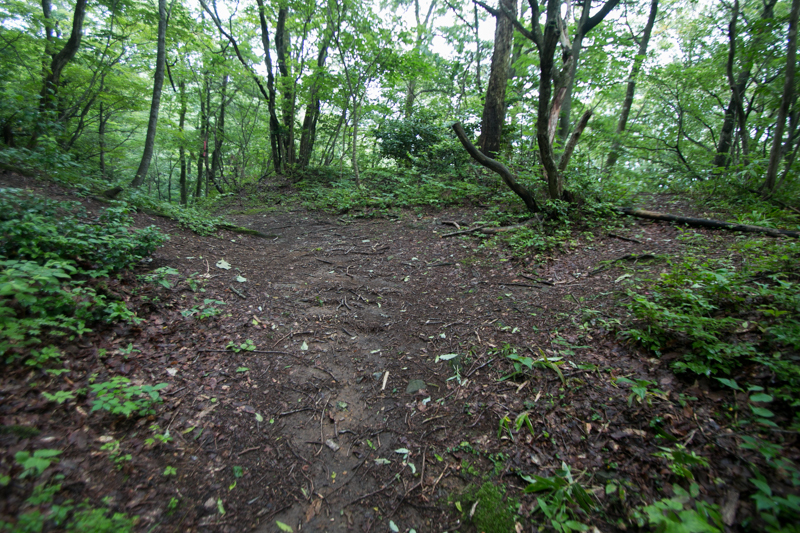 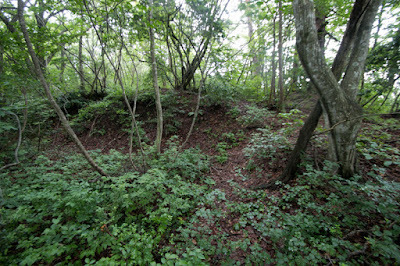 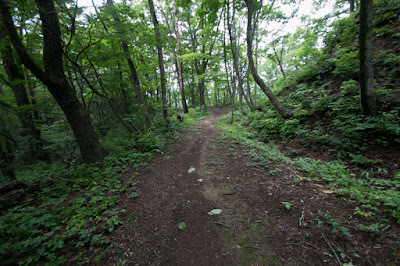 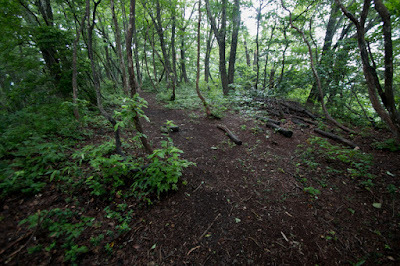 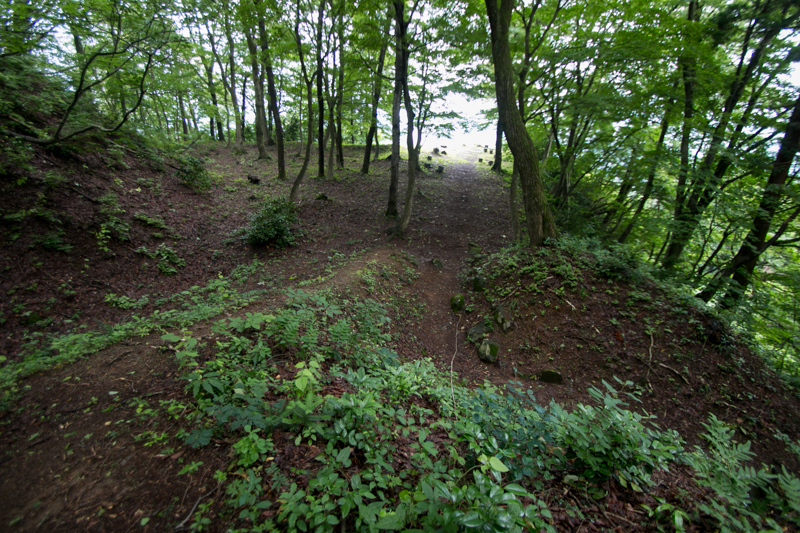 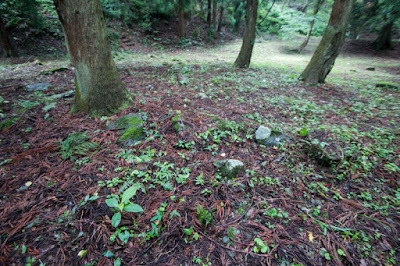 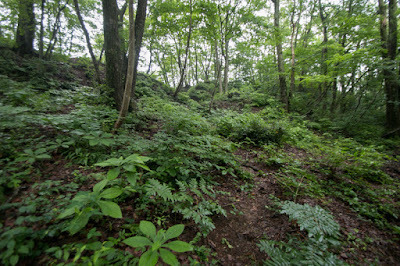 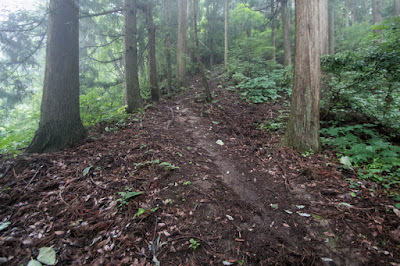 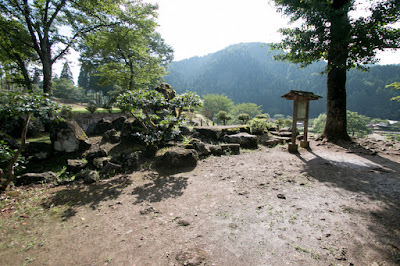 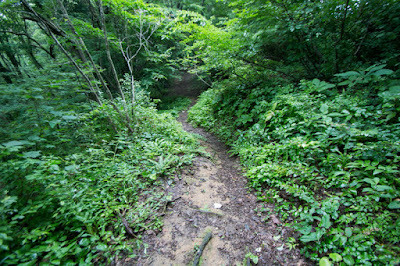 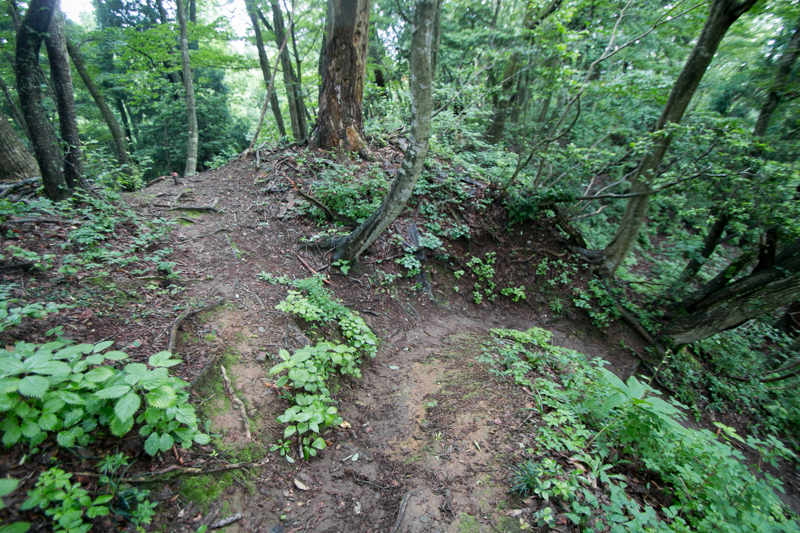 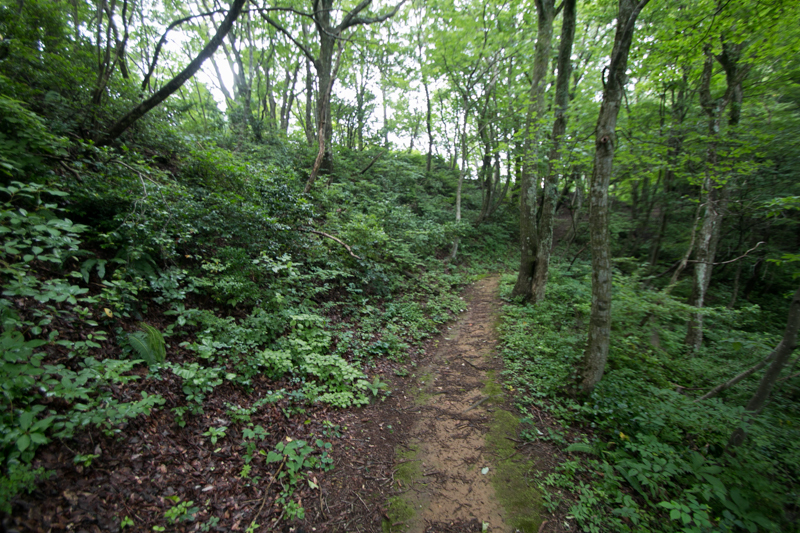 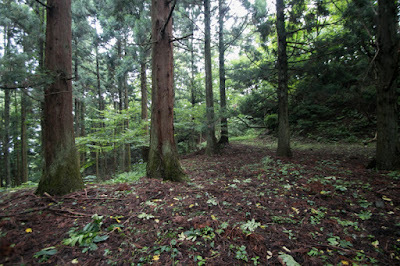 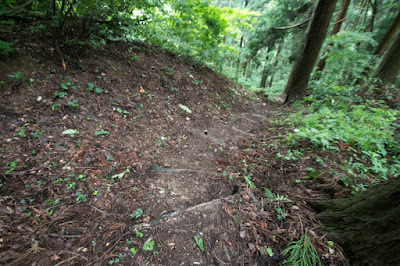 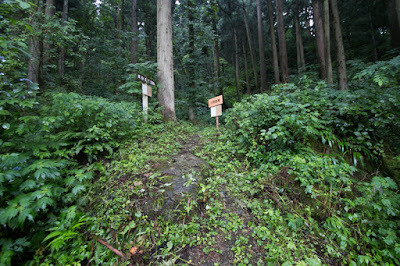 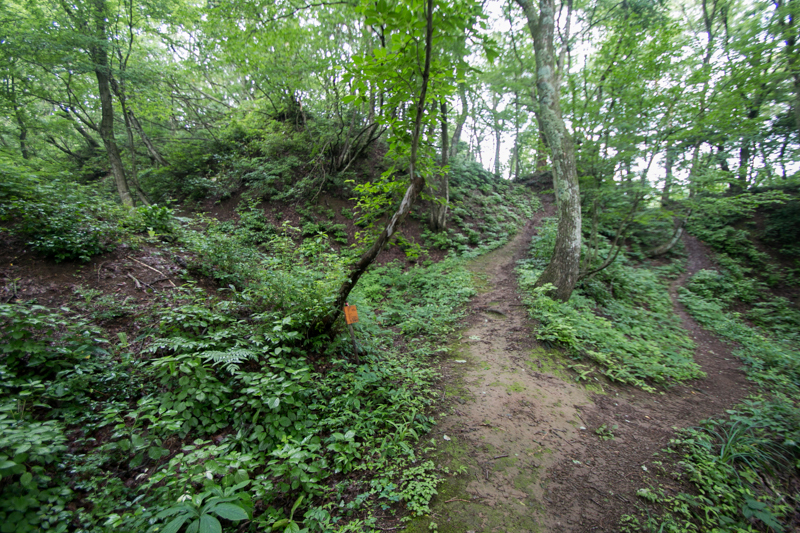 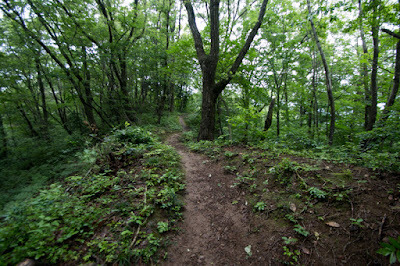 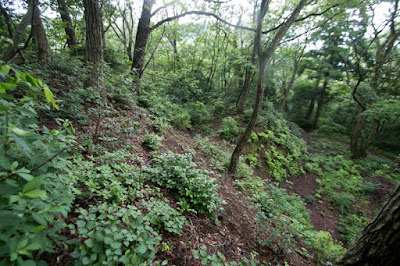 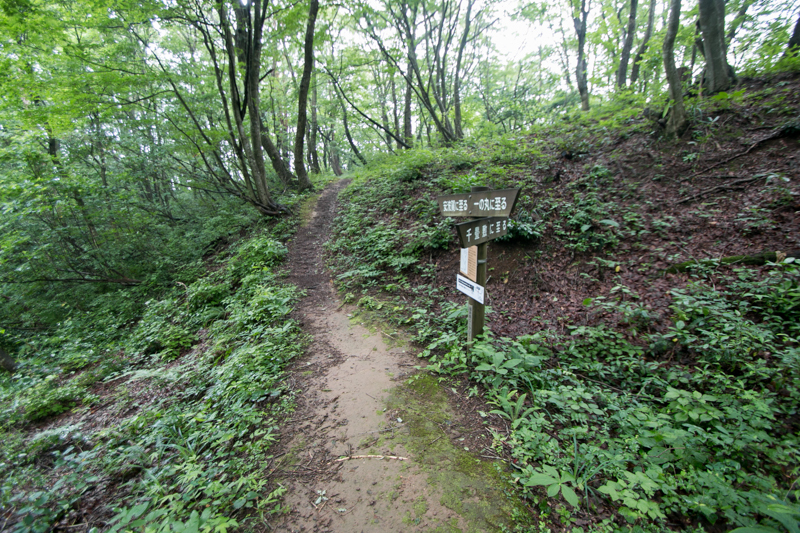 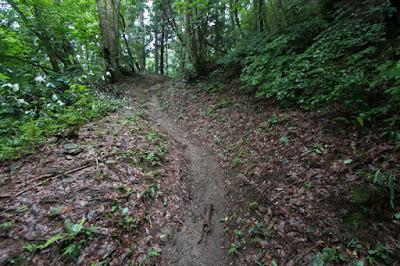 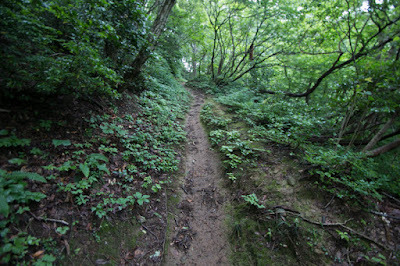 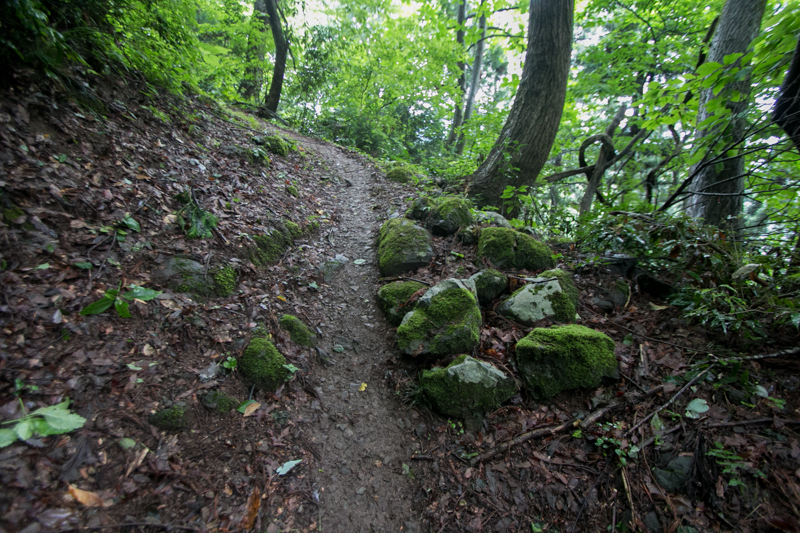 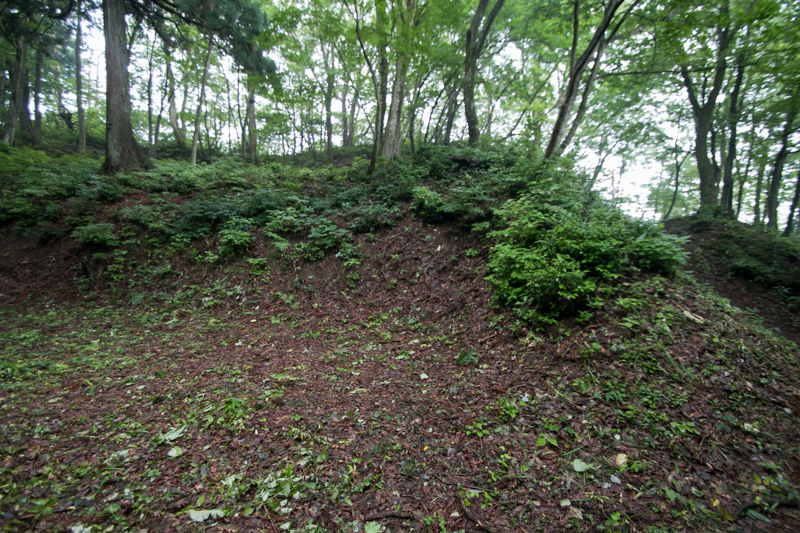 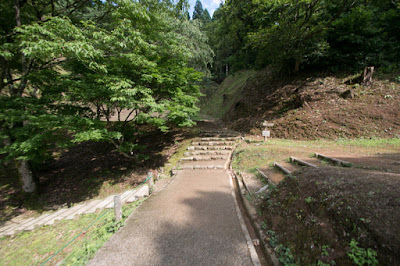 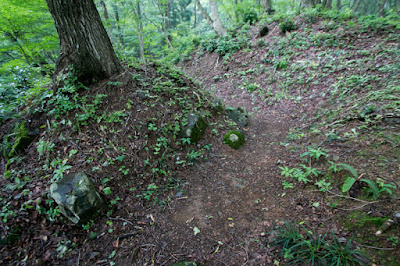 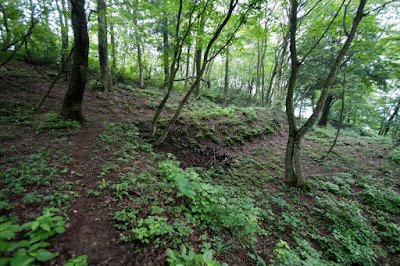 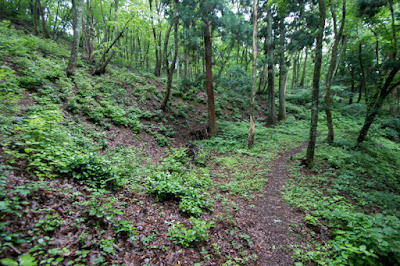 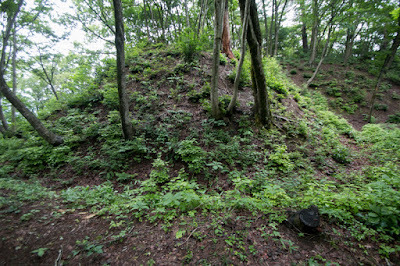 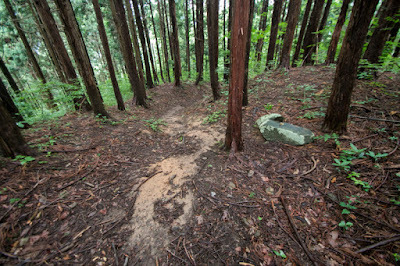 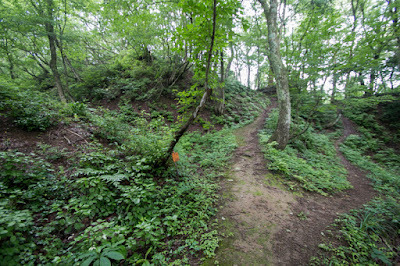 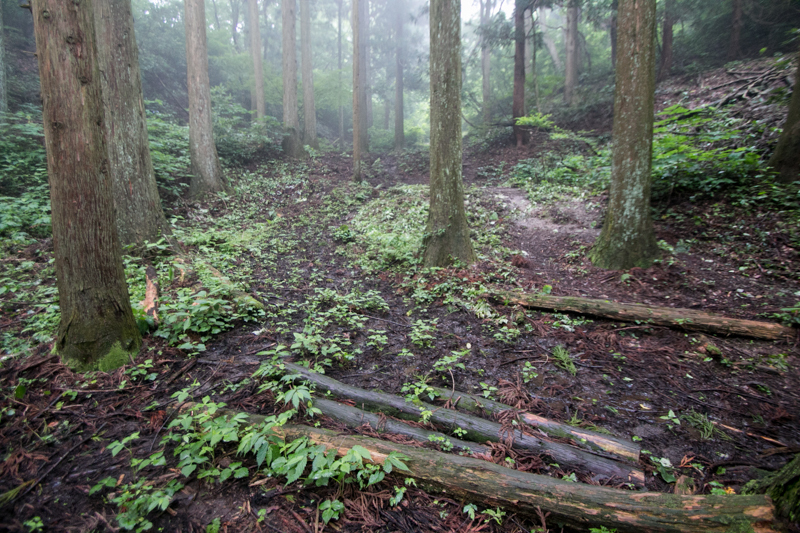 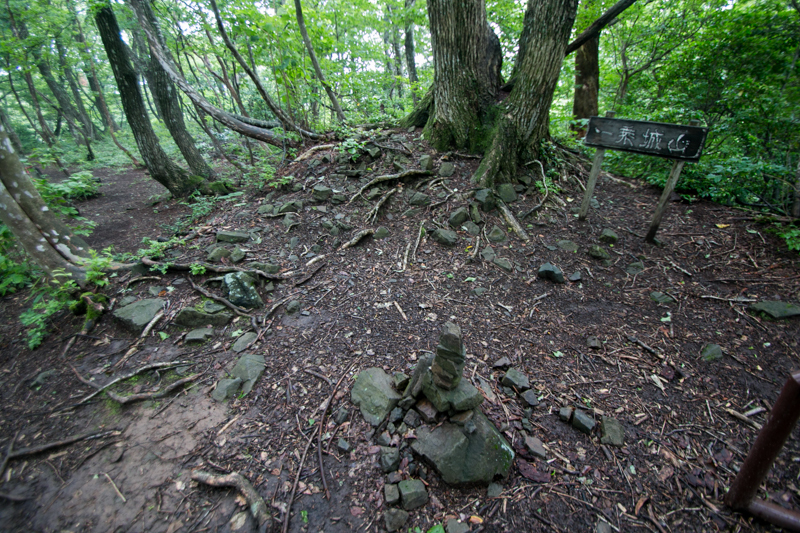 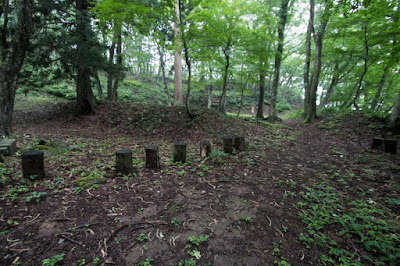 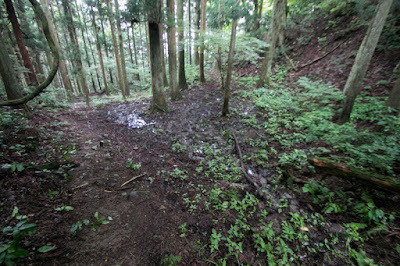 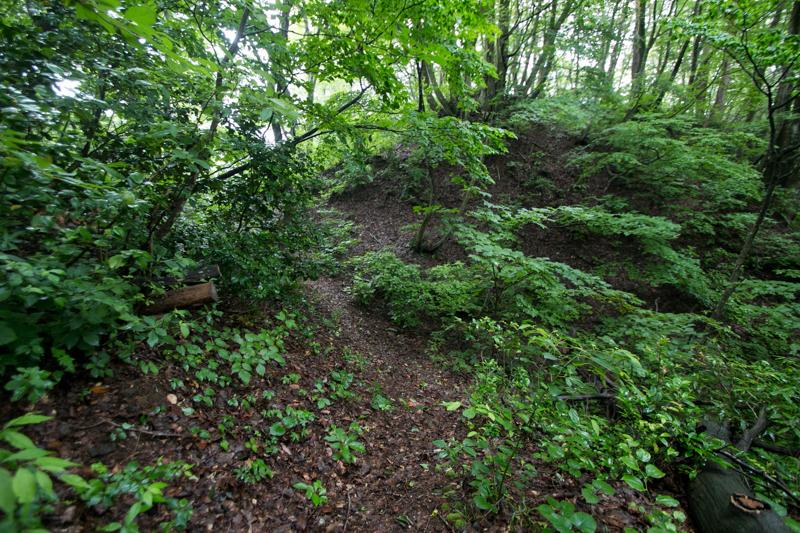 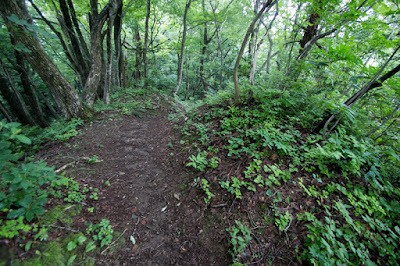 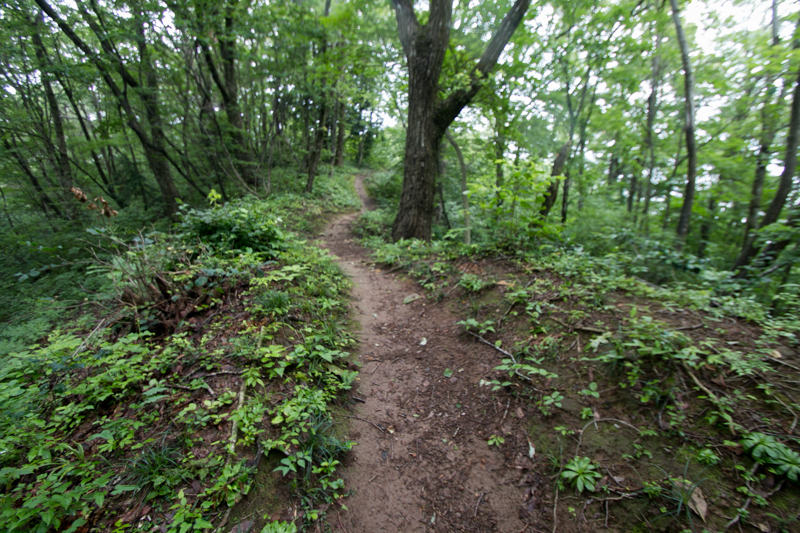 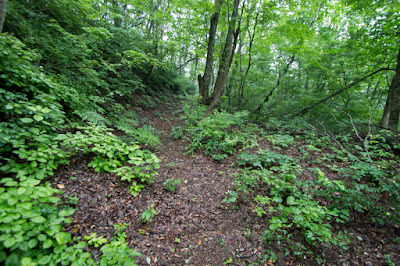 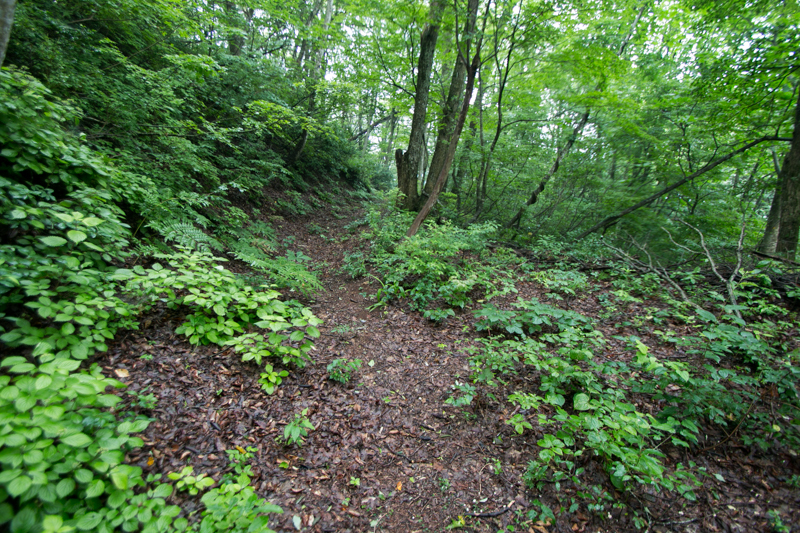 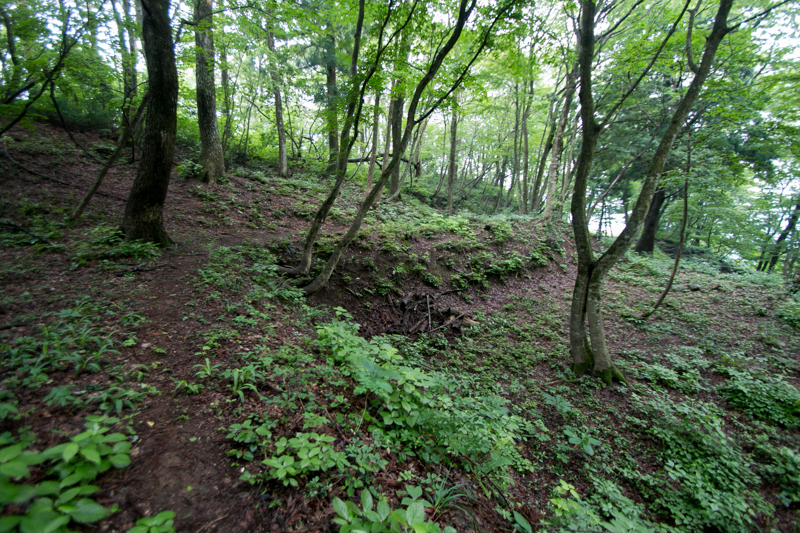 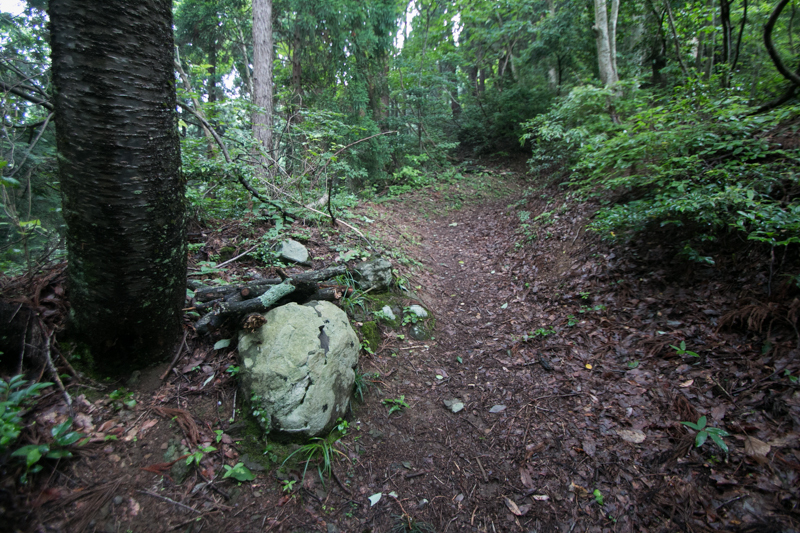 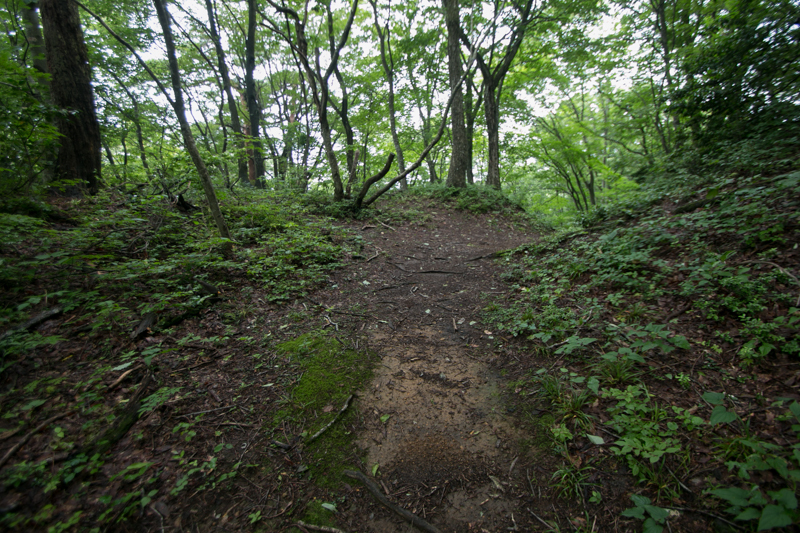 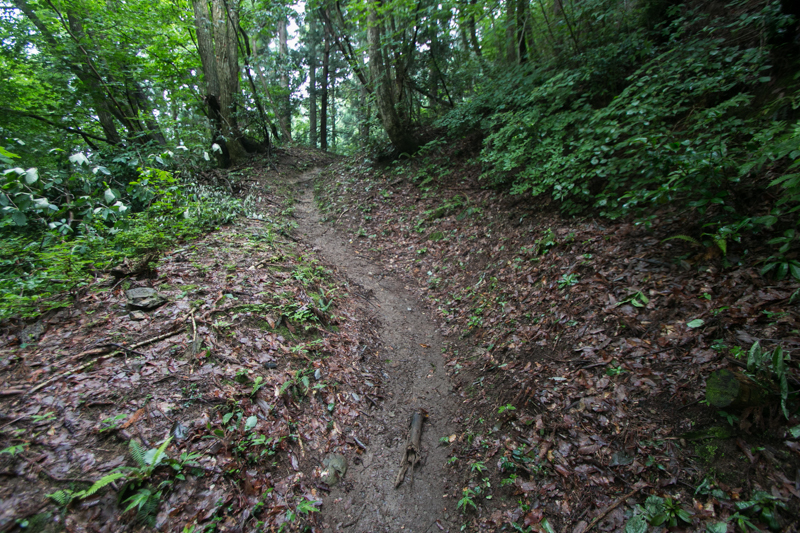 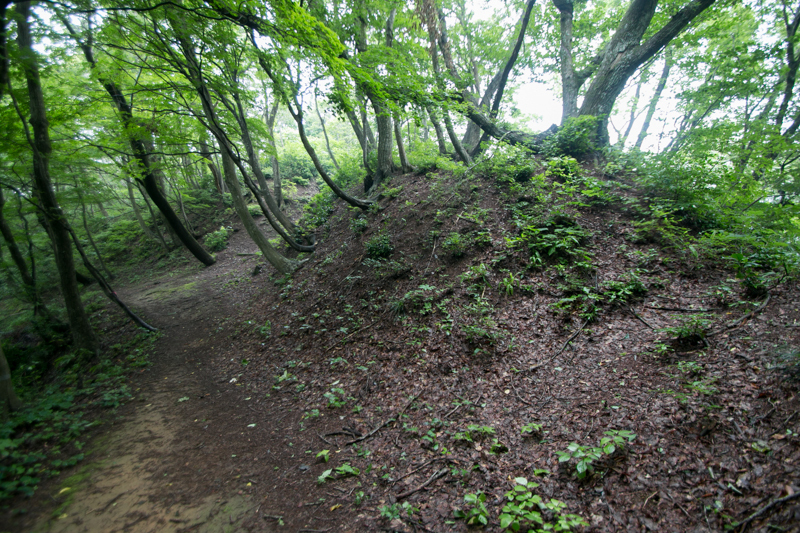 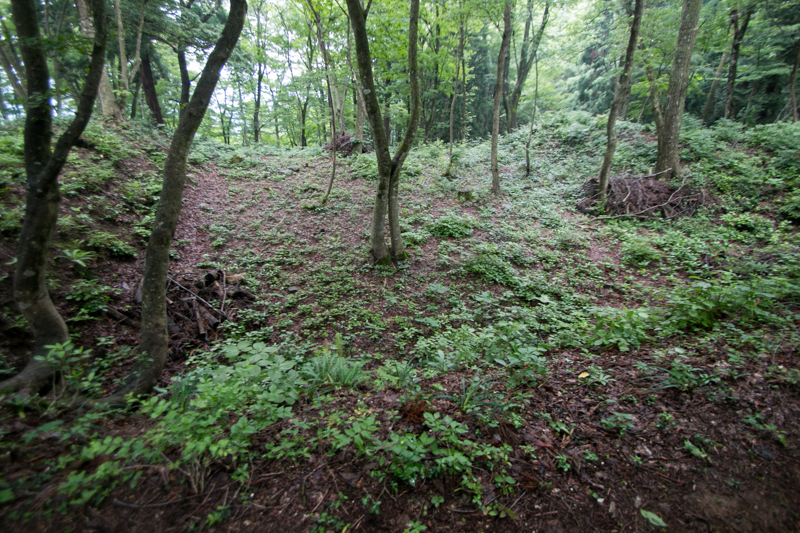 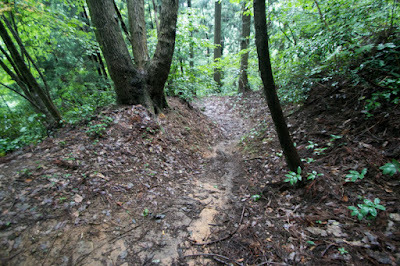 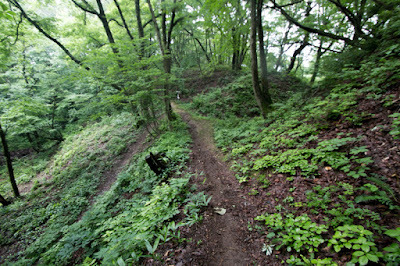 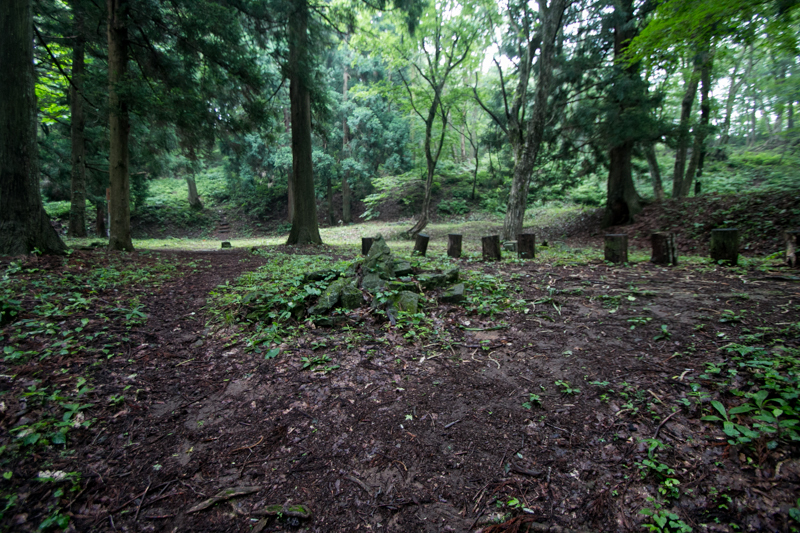 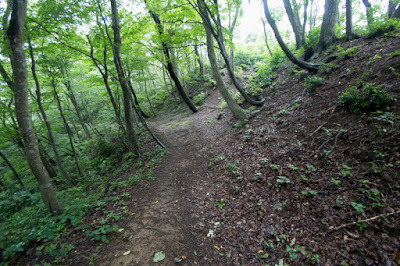 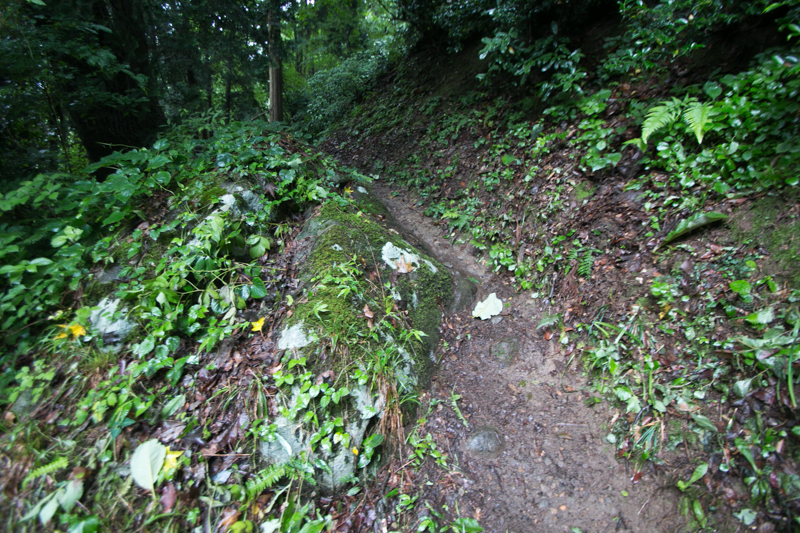 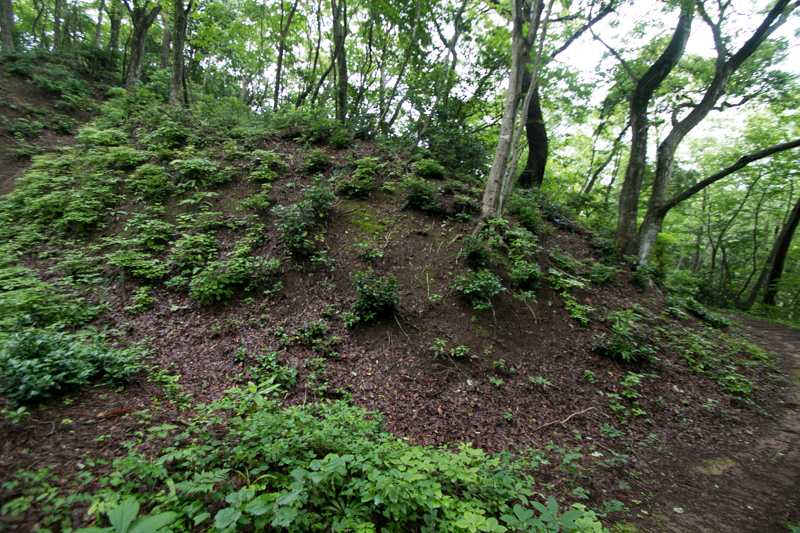 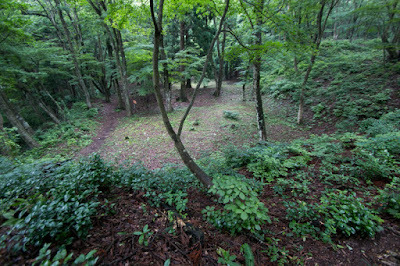 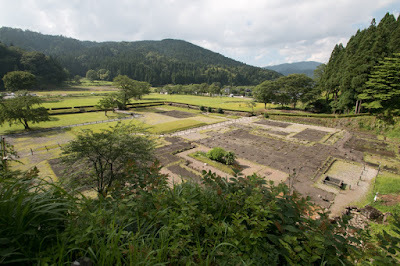 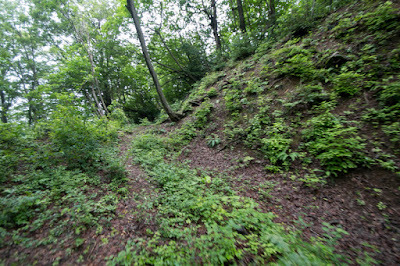 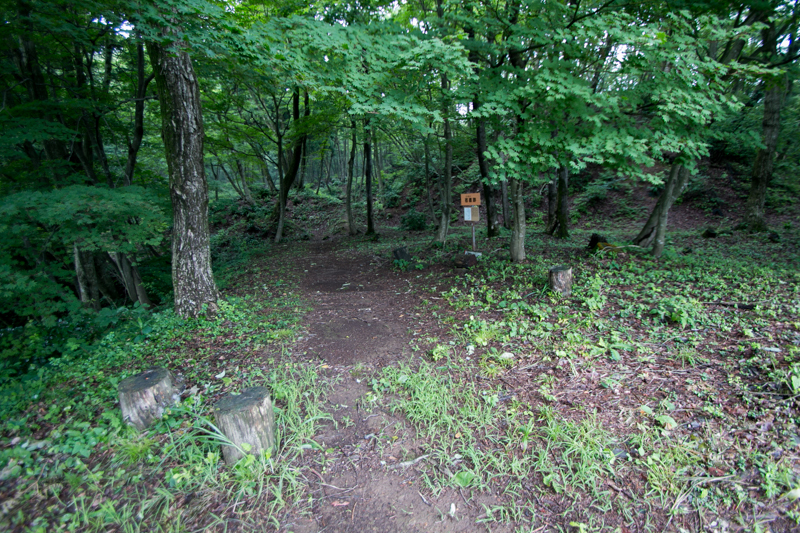 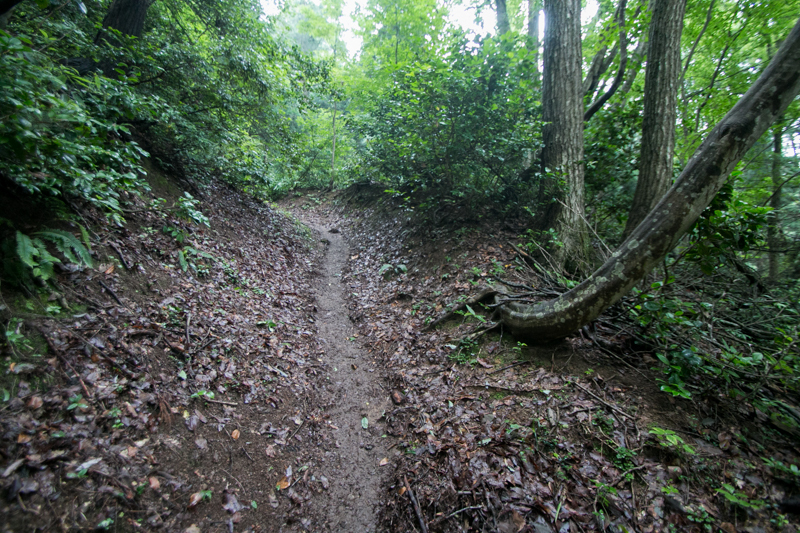 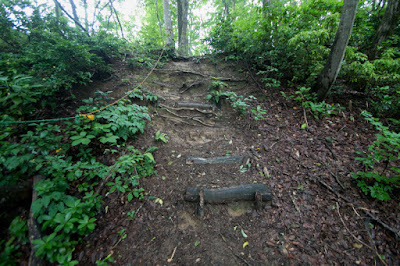 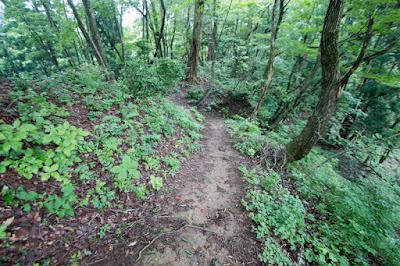 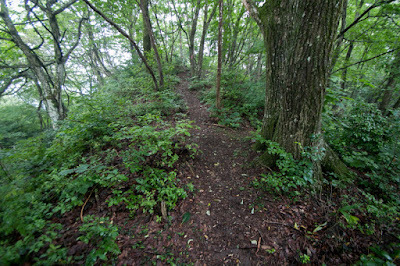 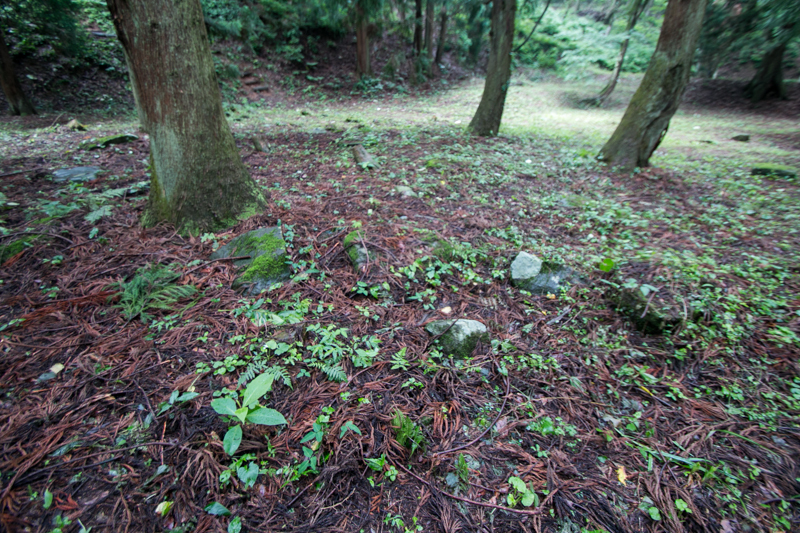 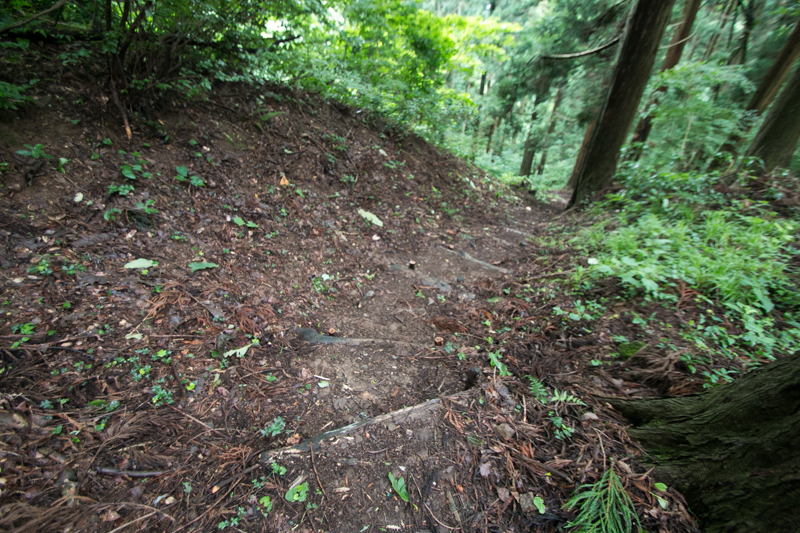 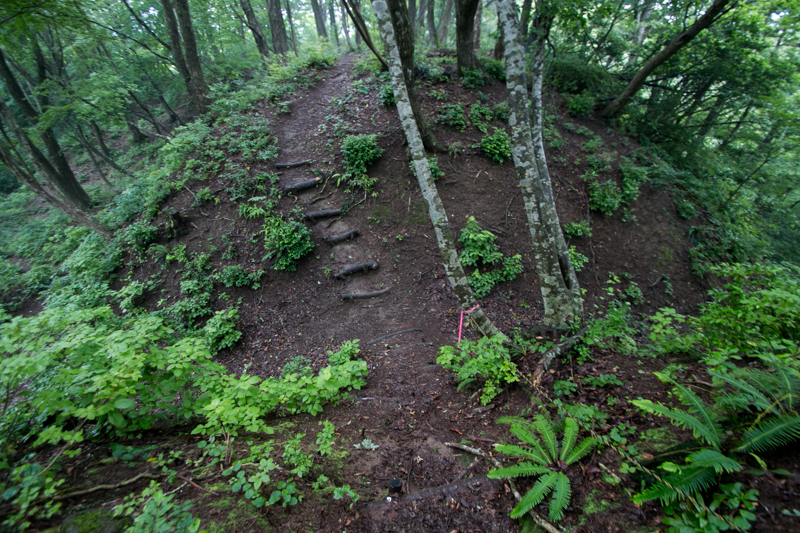 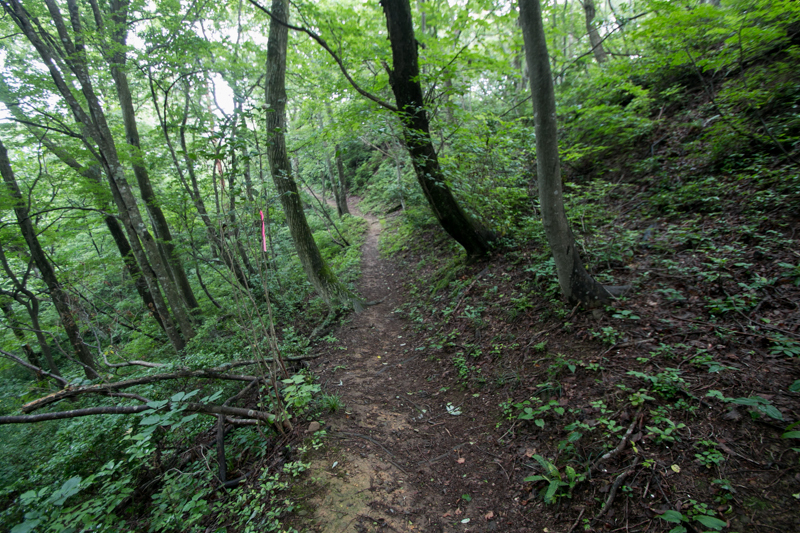 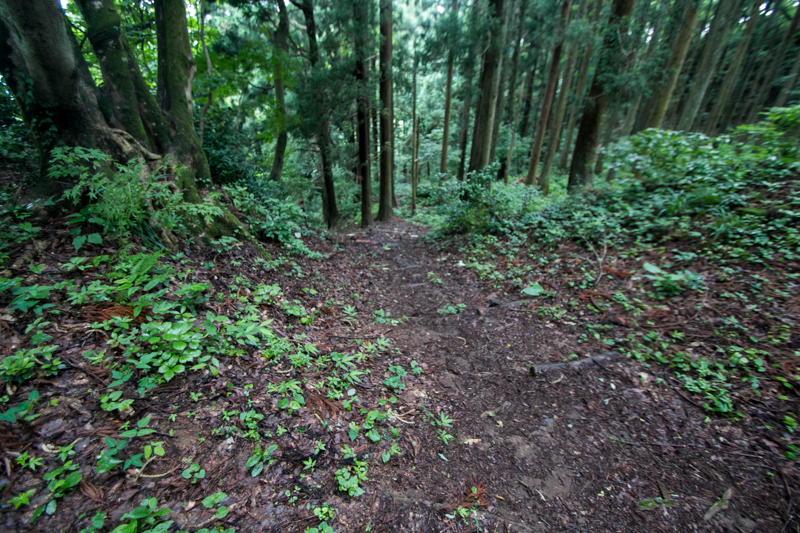 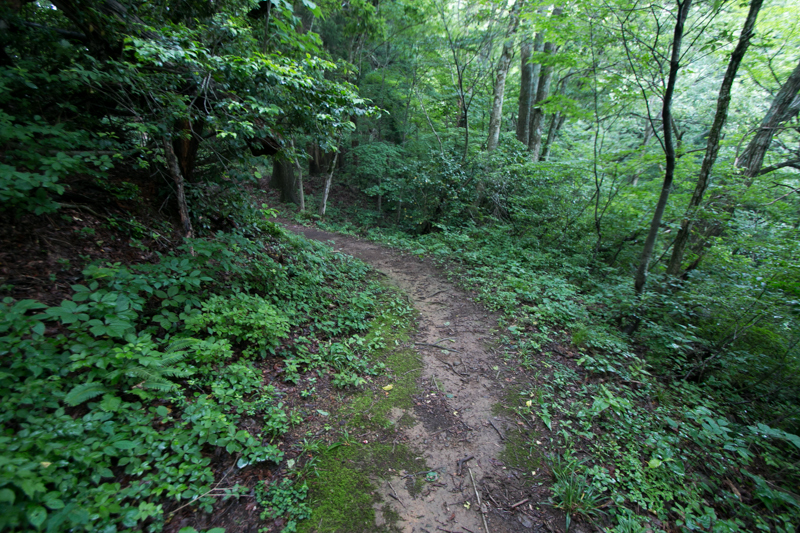 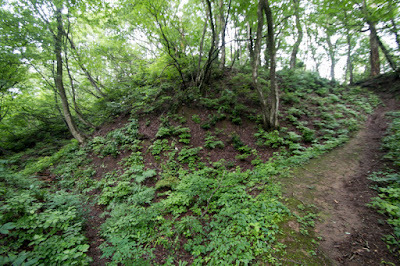 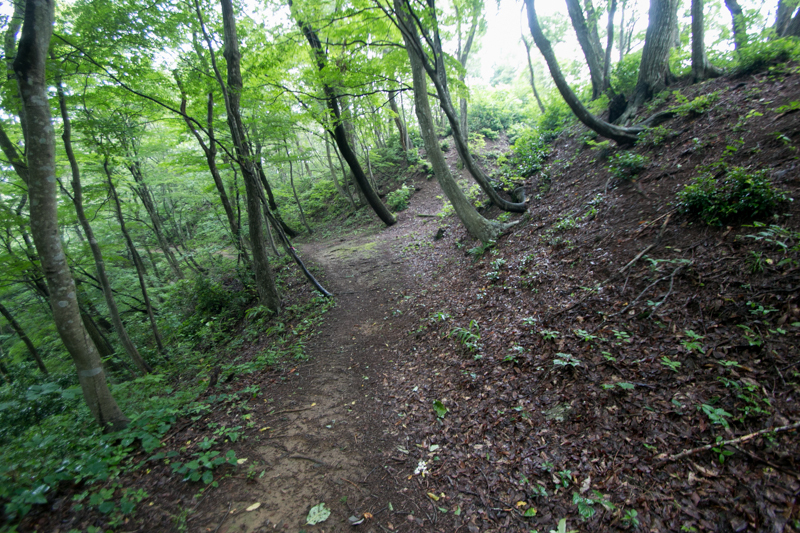 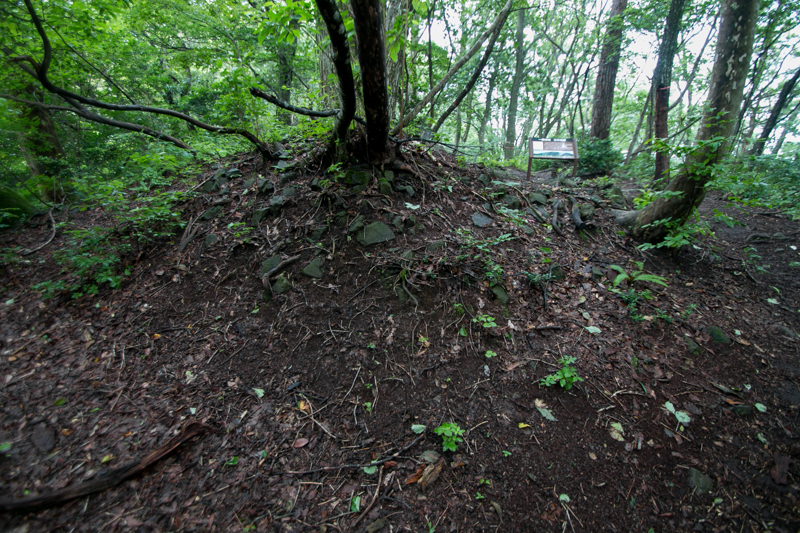 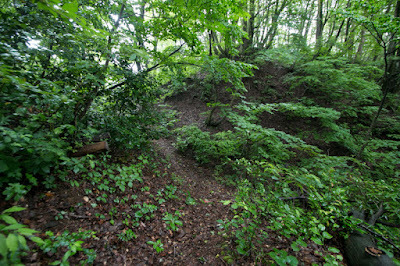 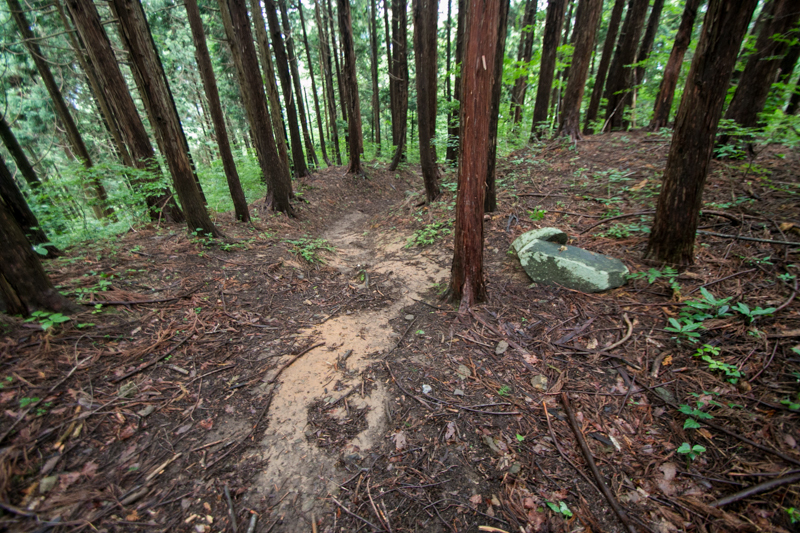 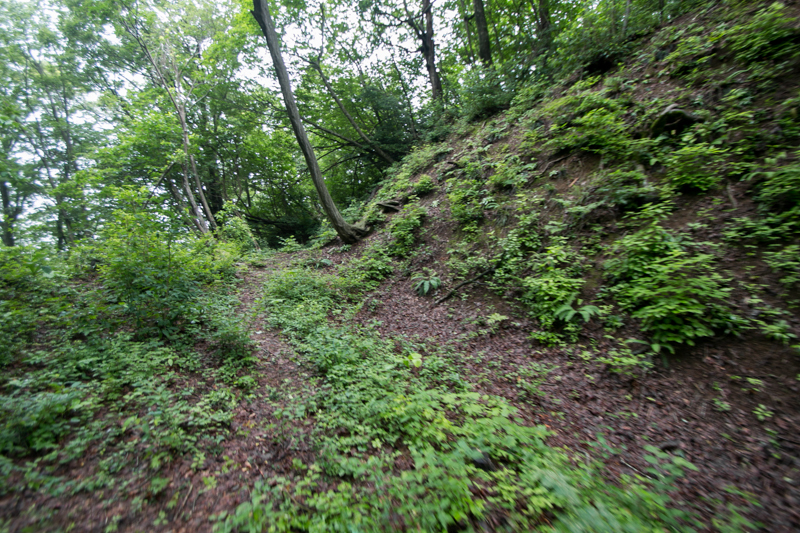 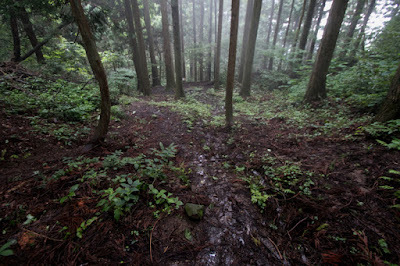 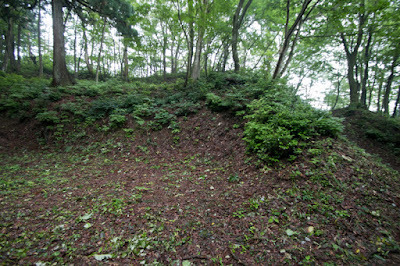 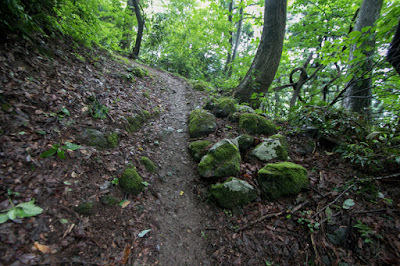 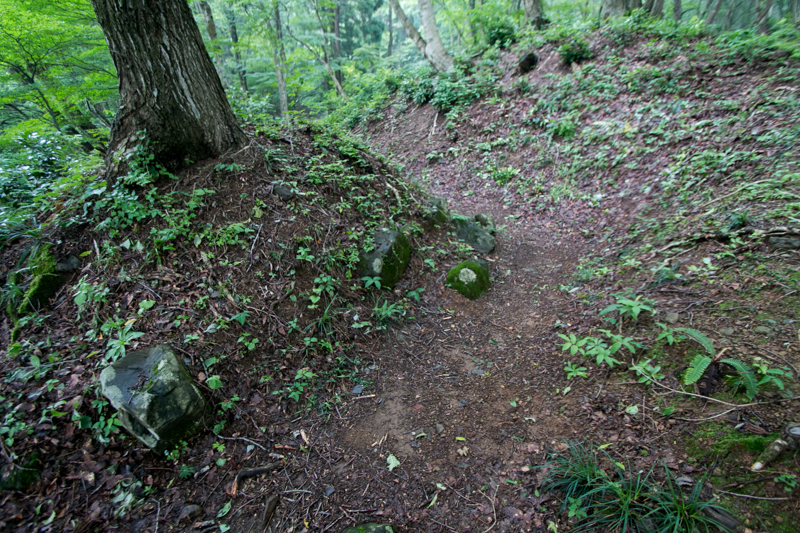 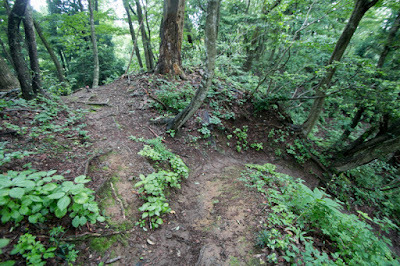 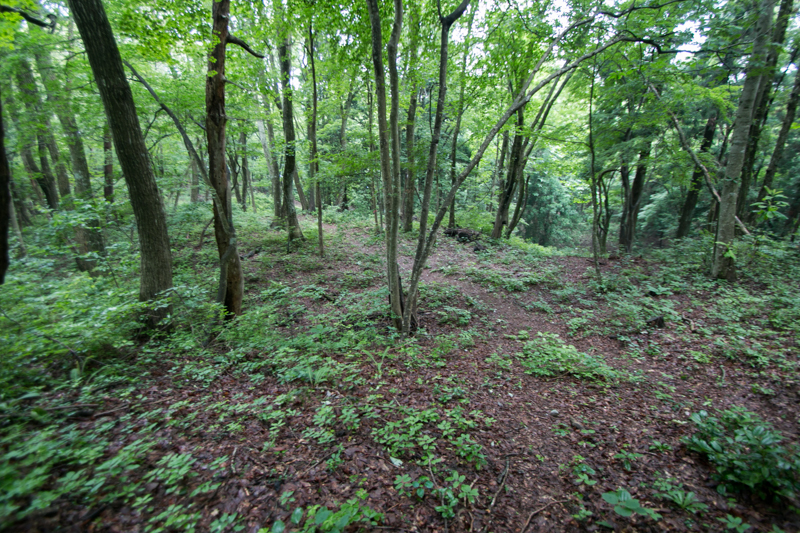 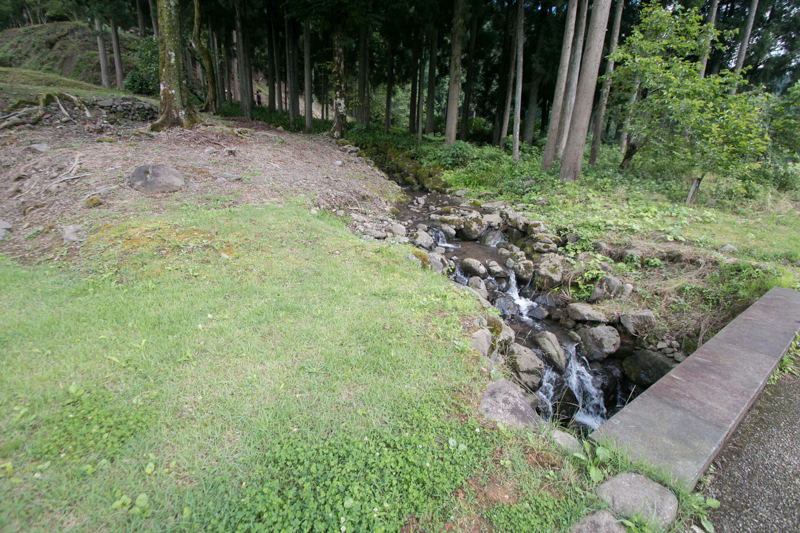 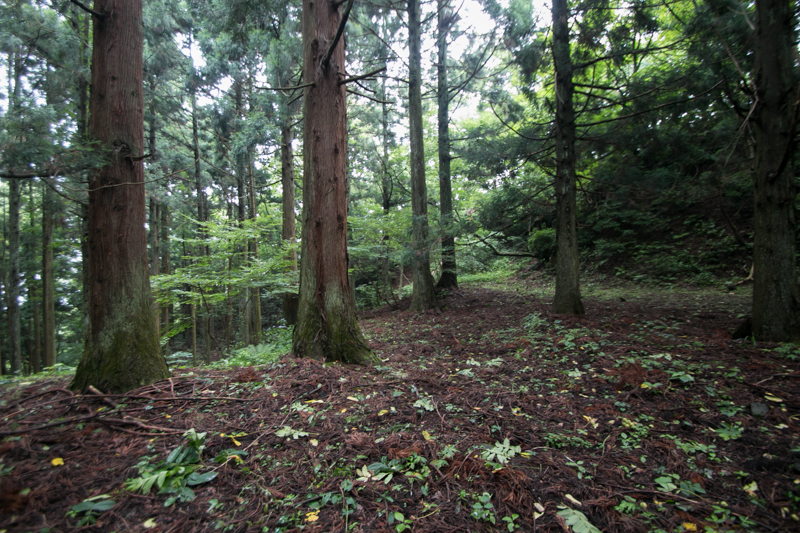 20 minute walk from JR West Etsumi-Hokusen line Ichijodani station to hillside ruins. Asakura-Siryokanmae bus stop of Keifuku bus from JR West Fukui station. 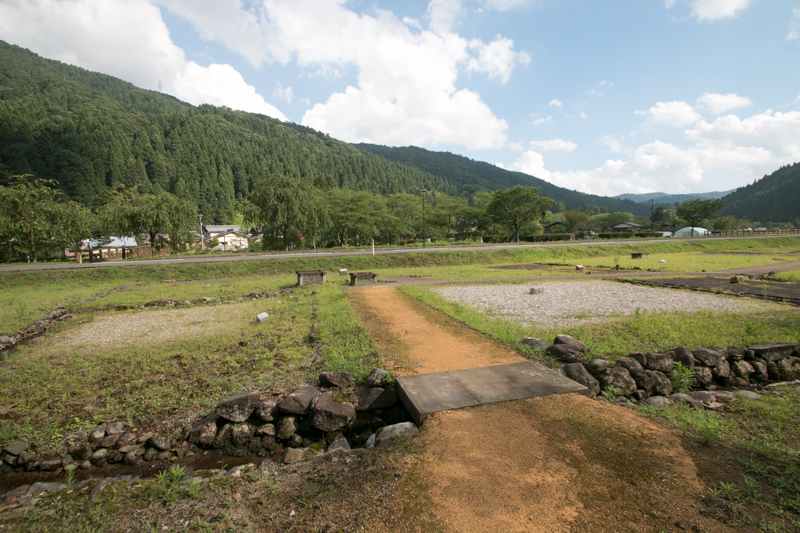 15 minutes drive from Hokuriku-Jidoshado Expressway Fukui interchange. 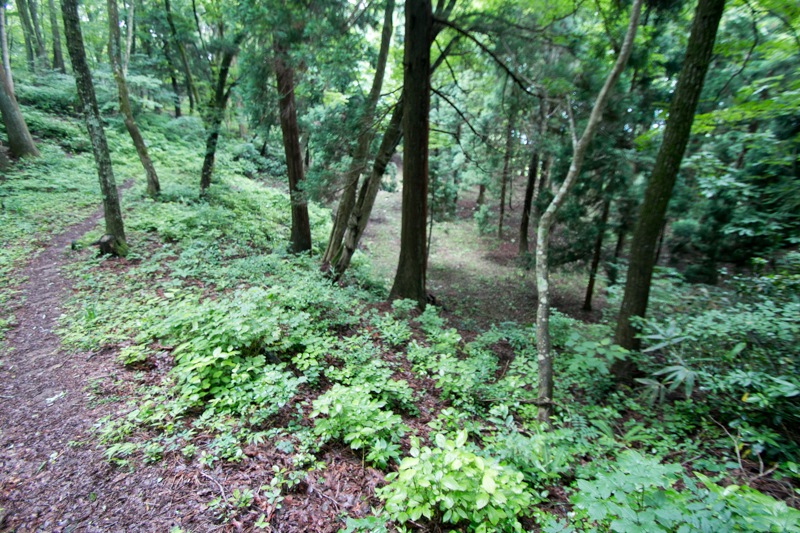 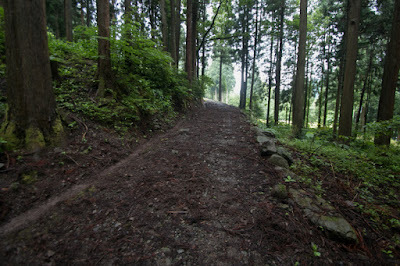 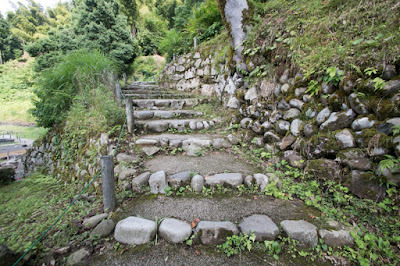 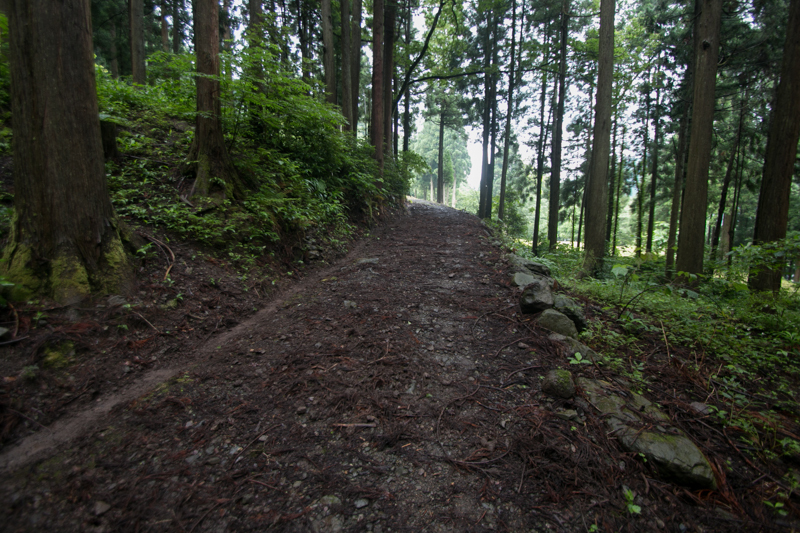 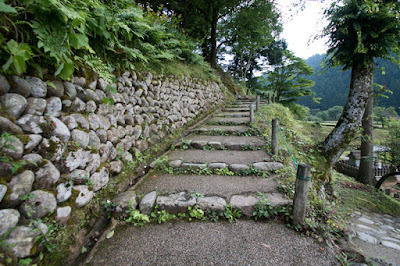 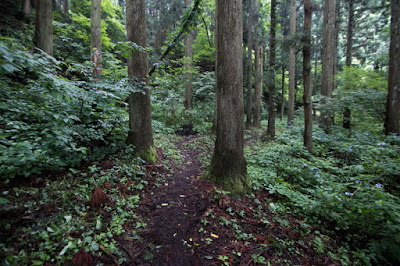 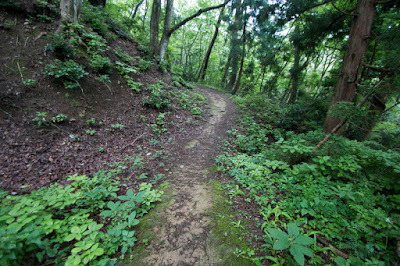 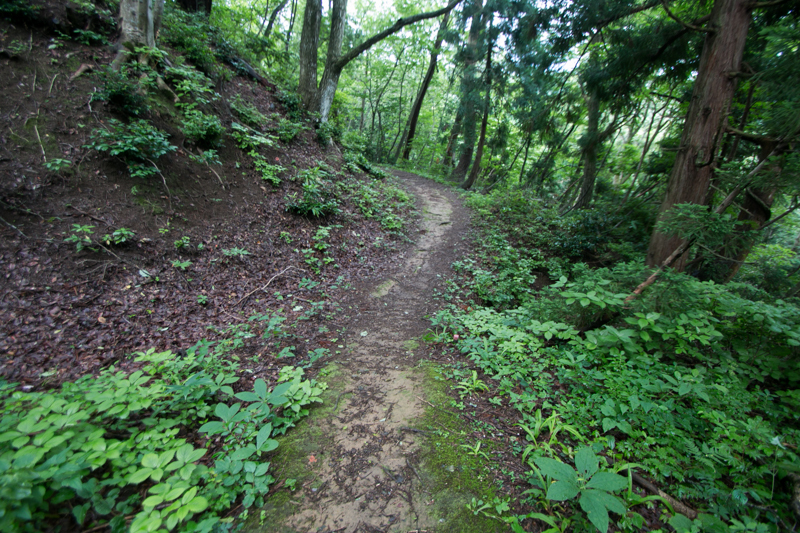 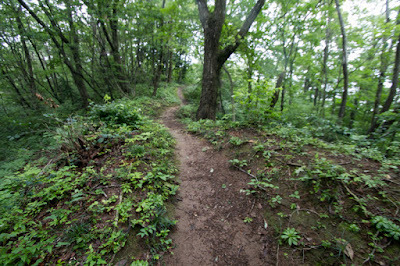 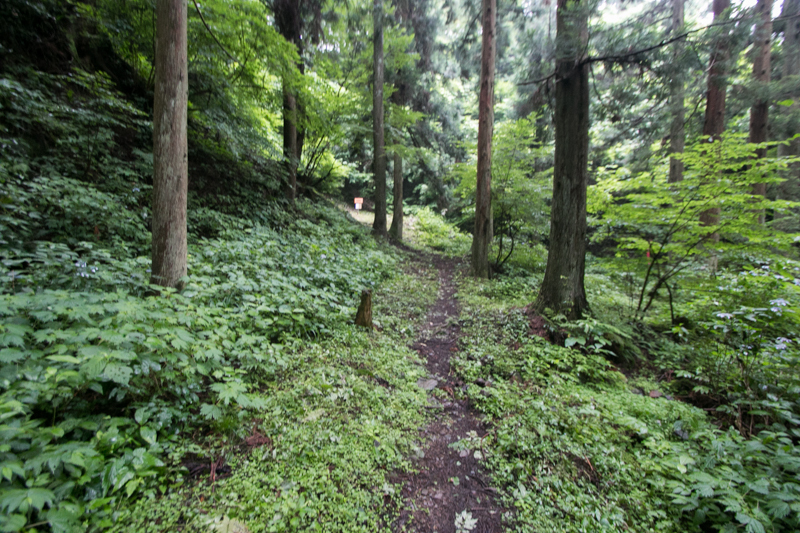 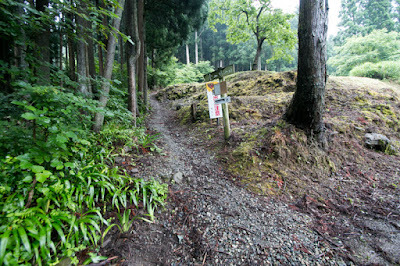 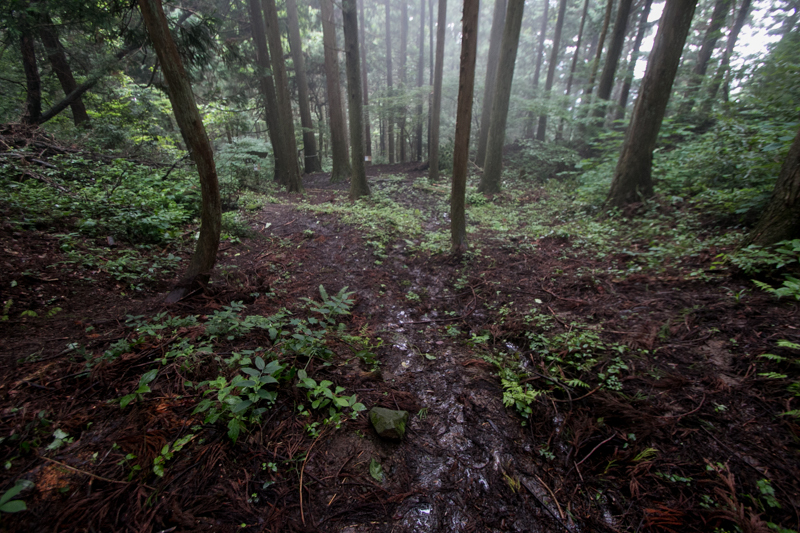 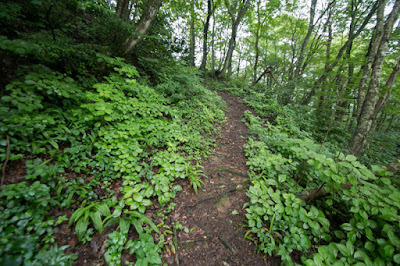 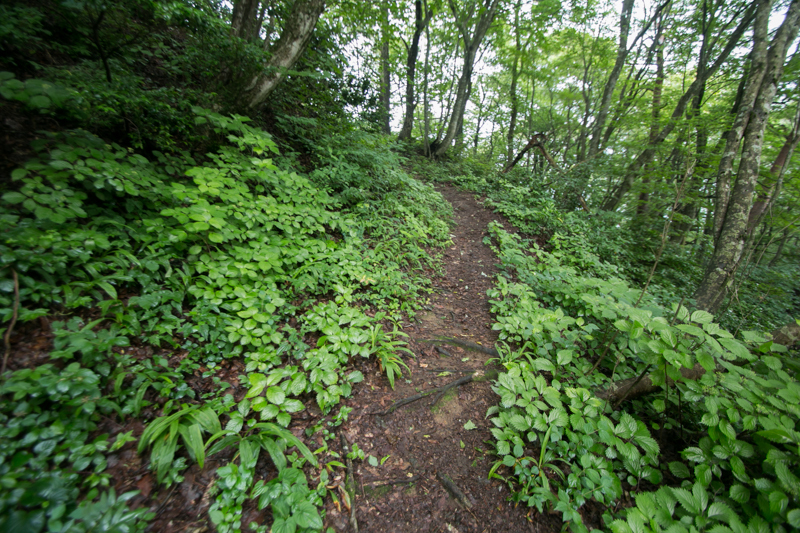 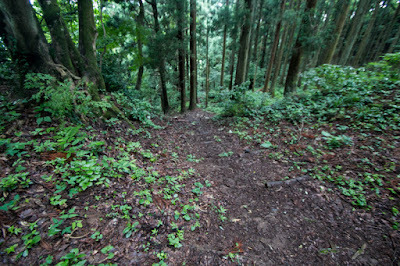 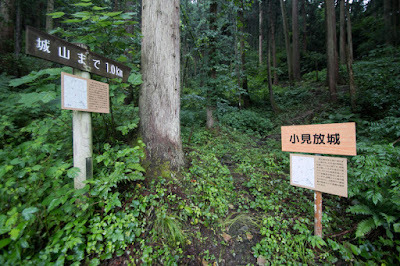 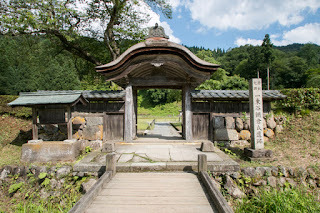 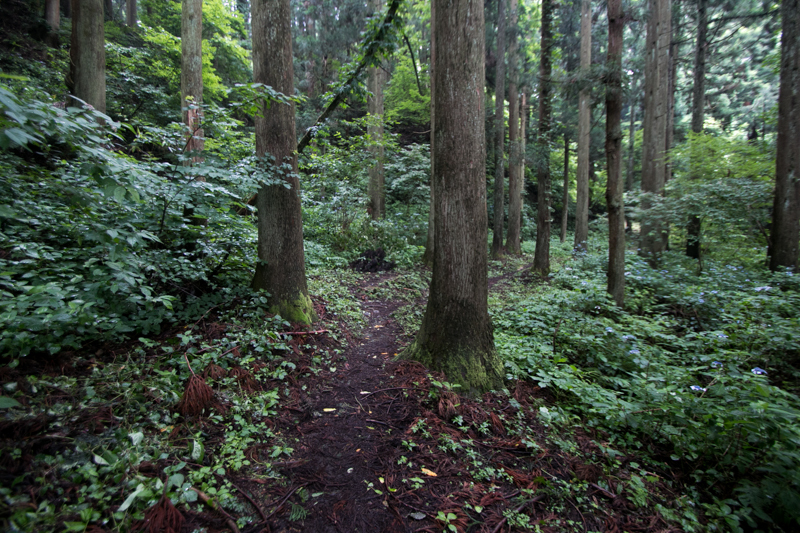 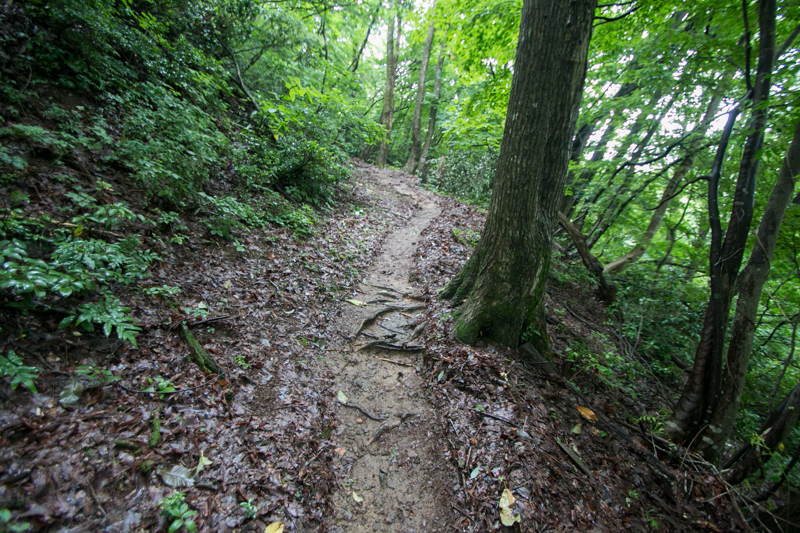 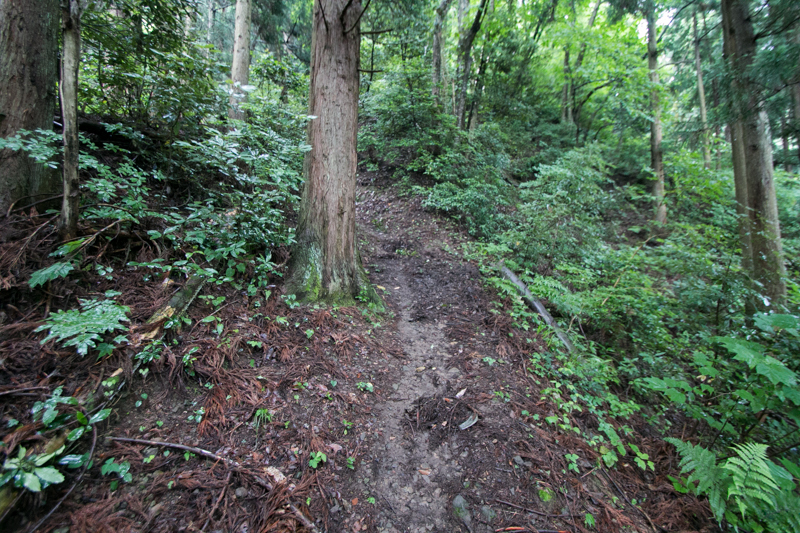 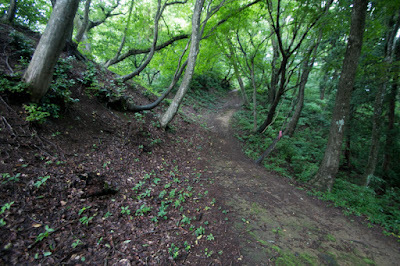 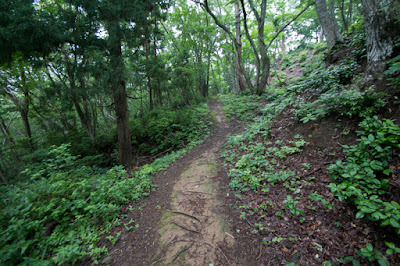 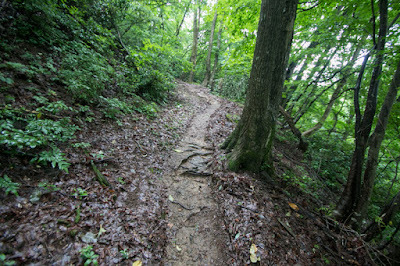 60 minutes walk from hillside entrance at the side of Hachiman shrine to hilltop castle area.